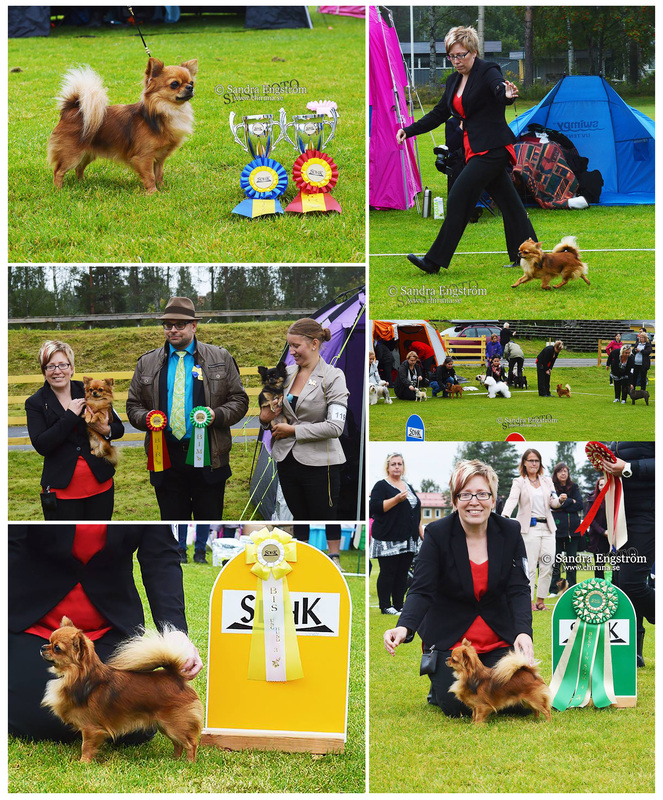 Great day at ”Swedish Winner Show” sooo close a winner title for Eddie! 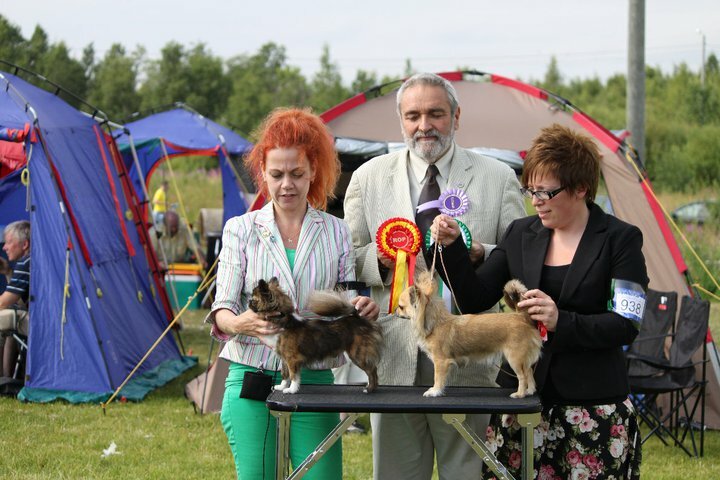 C.I.B NORDUCH NOUCH, Hungarian VeteranCH Tigerliljas Northern Light <NOOMI> Exc 3 (out of 7 veteran females) CQ. 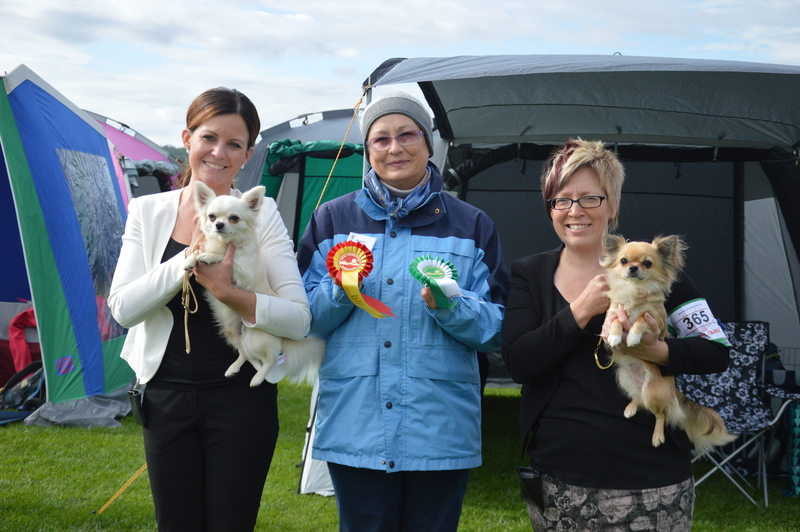 BEST OF BREED- & BEST IN SHOW4 VETERAN! NEW NORWEIGAN CHAMPION!!! 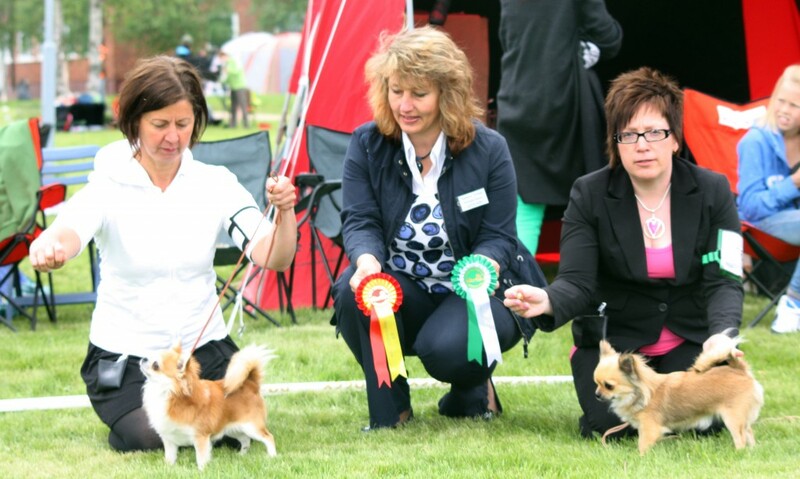 MultiCh C.I.B Tigerliljas Light Years Ahead; Exc but unplaced in a big strong class of 15 champion males. 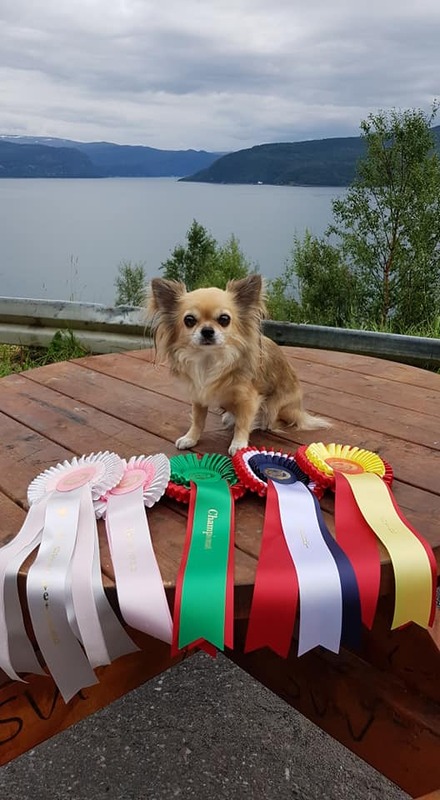 Back at home after a long trip to Norwegian Chihuahua Specialty. No results to ”brag” about but still nice results and great critique on both Eddie and Noomi. I´m Amazing Secret Of Angels Exc1, CQ, BEST MALE with CAC, BOS!! 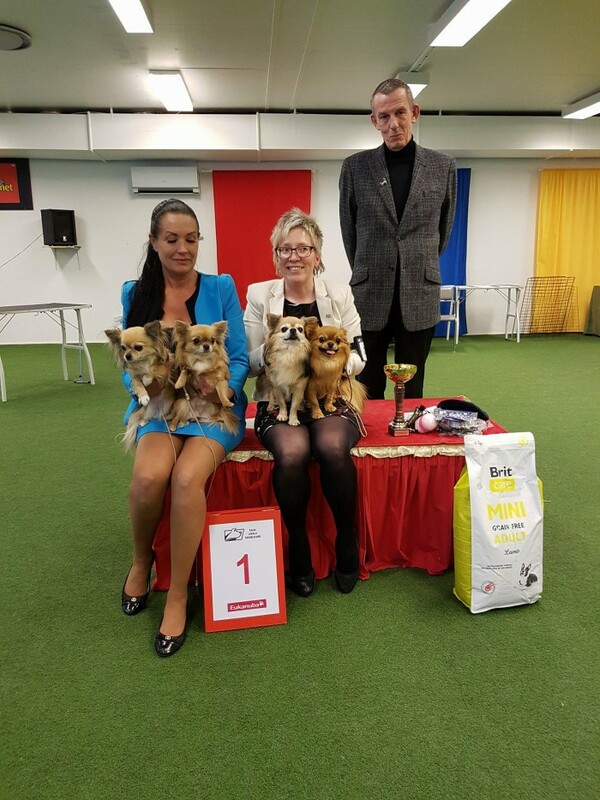 C.I.B NORD NO SE FI EE DK UCH HUCH Tigerliljas Light Years Ahead; Winner of CH.class, CAC, BOS, Specialty Winner, BOS BIS2, NEW HUNGARIAN CLUB CHAMPION! 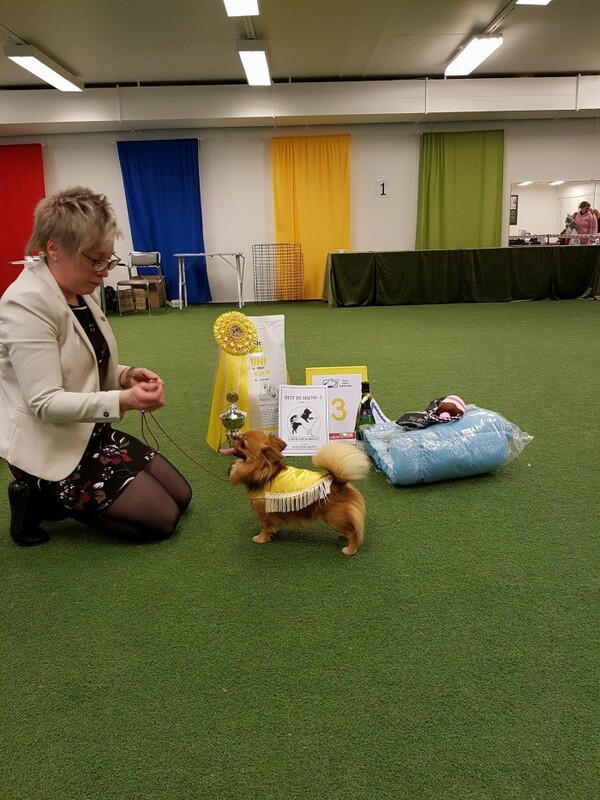 Specialty Winner, NEW HUNGARIAN CLUB CHAMPION! 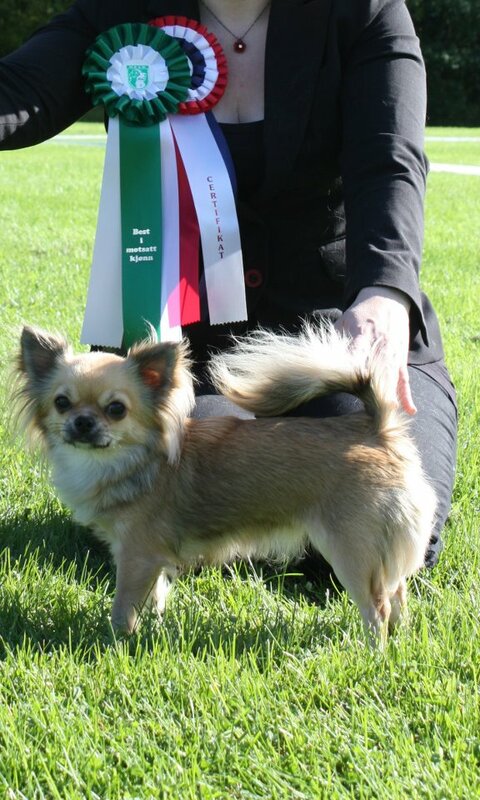 C.I.B NORD NO SE FI EE DK UCH Tigerliljas Light Years Ahead; Winner of CH.class, CAC, R-CACIB, NEW HUNGARIAN CHAMPION!! 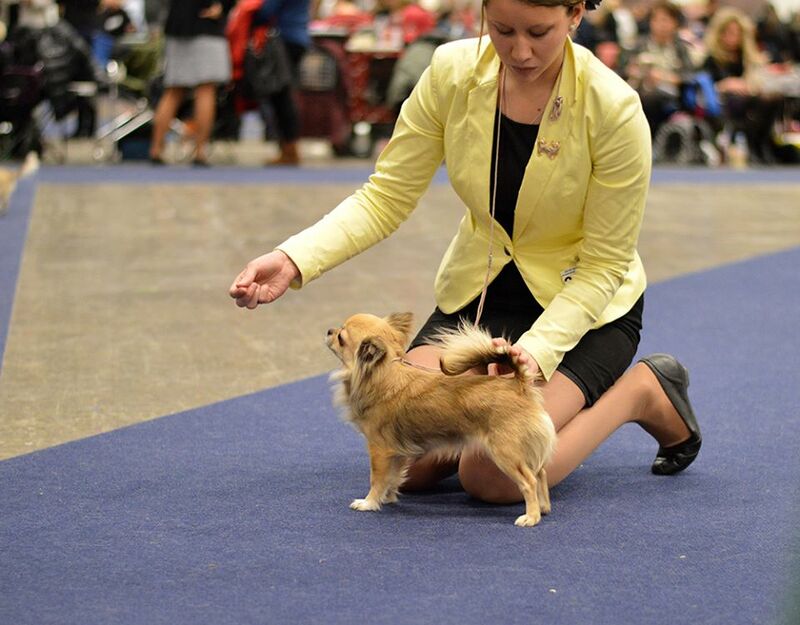 C.I.B NORD SE FI NO DK EE UCH RLD N Tigerliljas Pay Attention; Winner of Openclass CAC, CACIB, NEW HUNGARIAN CHAMPION!! *C.I.B [*pend.] 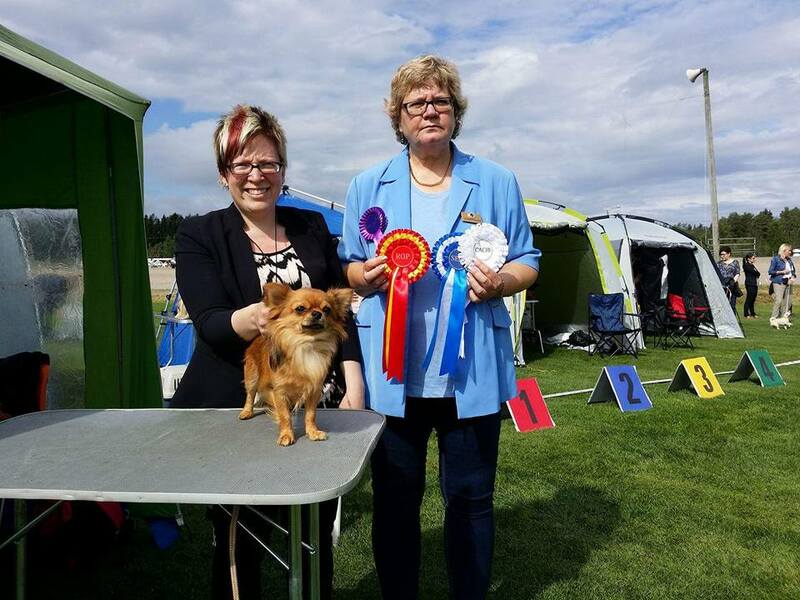 NORD SE FI DK UCH Tigerliljas Northern Light; Winner of Veteran class VET.CAC, BOB-VETERAN, BOS, NEW HUNGARIAN VETERAN CHAMPION!! 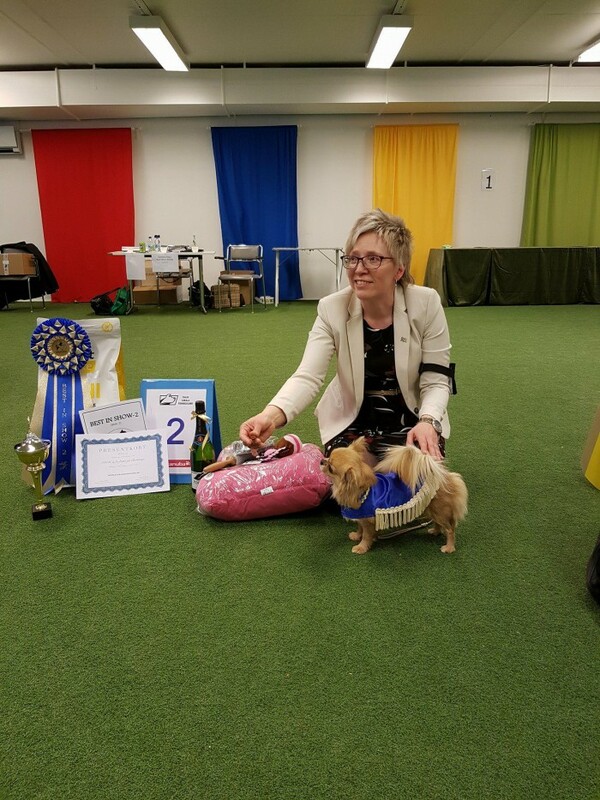 [Noomi] Winner of Veteran class, VET.CAC, BOB VETERAN (Didnt go to final because she was so tired because of the hot weather. 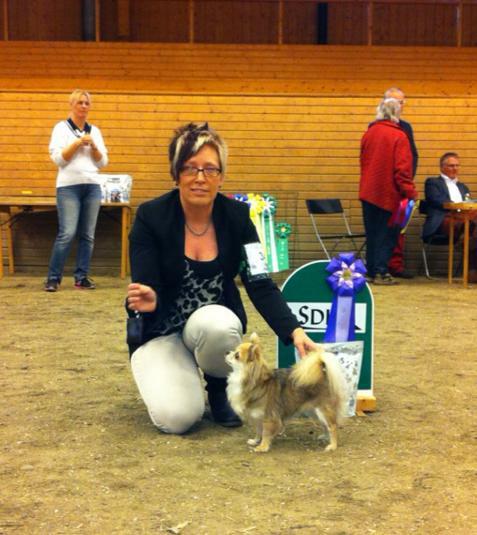 C.I.B NORD NO SE FI EE UCH Tigerliljas Light Years Ahead, Exc1, CQ, BM1, CAC, CACIB, BEST OF BREED & NEW DANNISH CHAMPION!! 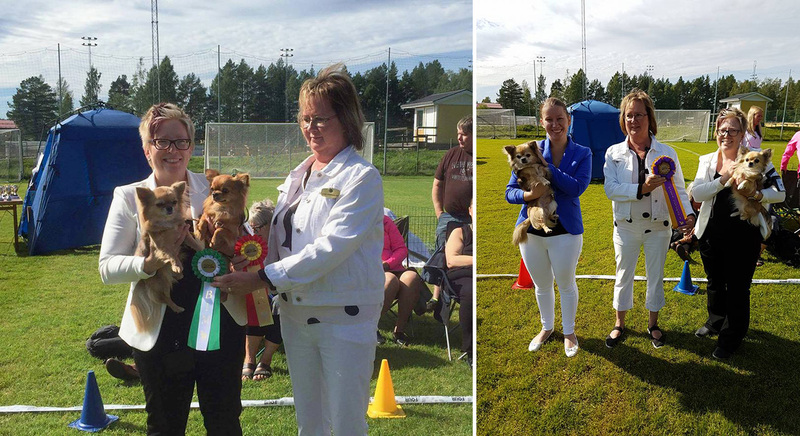 NORD SE FI DK UCH Tigerliljas Northern Light CHclass; Exc1, CQ, BF3, CACIB & NEW INTERNATIONAL CHAMPION!!! 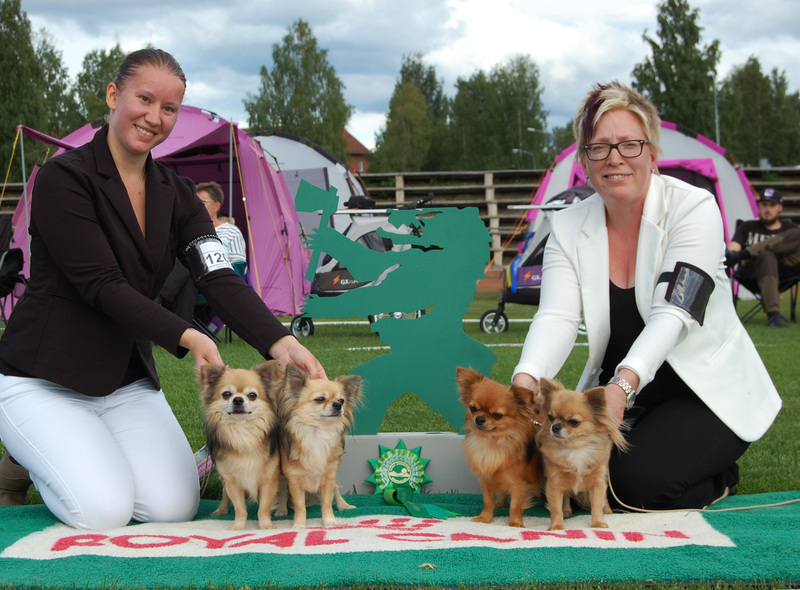 ☆ My dogs gained 7 new Champion titles together! 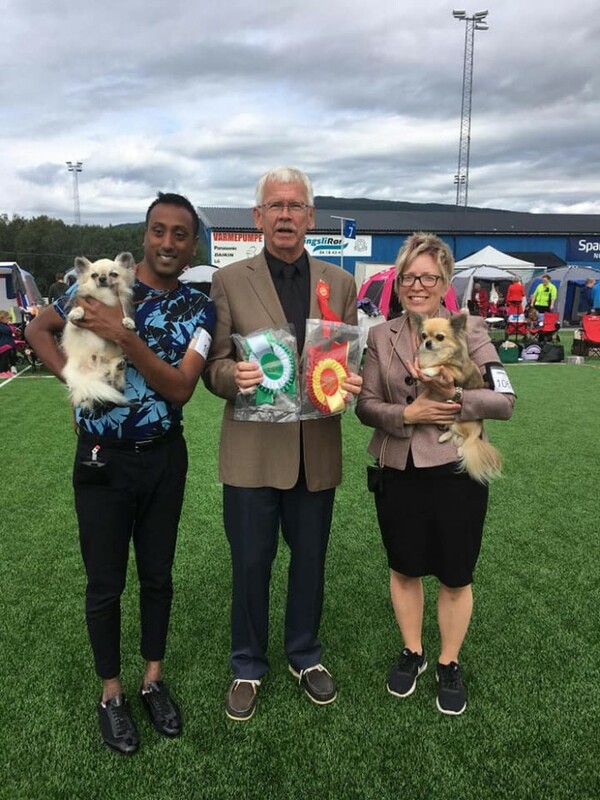 ☆ 3 out-of 4 of my participated dogs were placed on the Swedish Top 10 Most Winning LC (and one just ”out-side as # No 11″) Both my veterans were placed as # No 2 MOST WINNING LC VETERANS in Sweden- 2017! 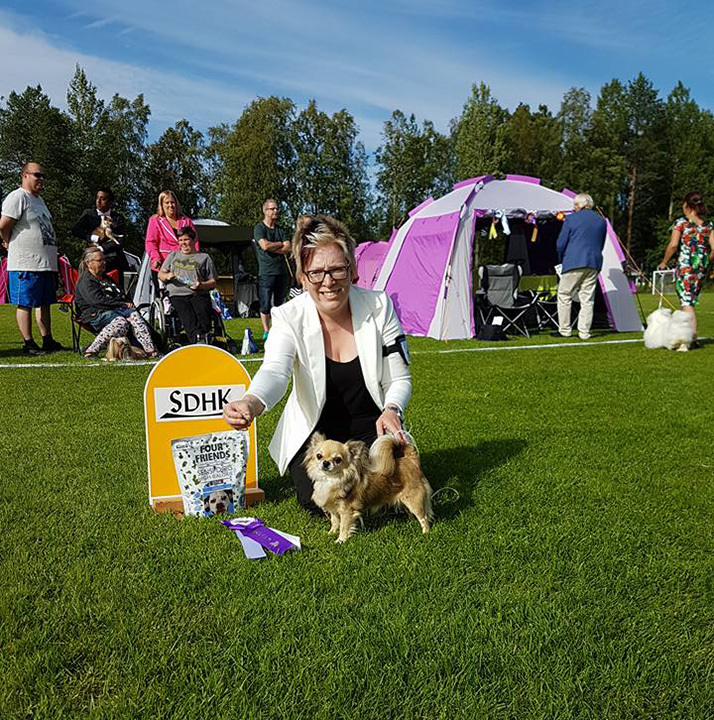 GREAT NEWS from SKK Top-list- 2017! 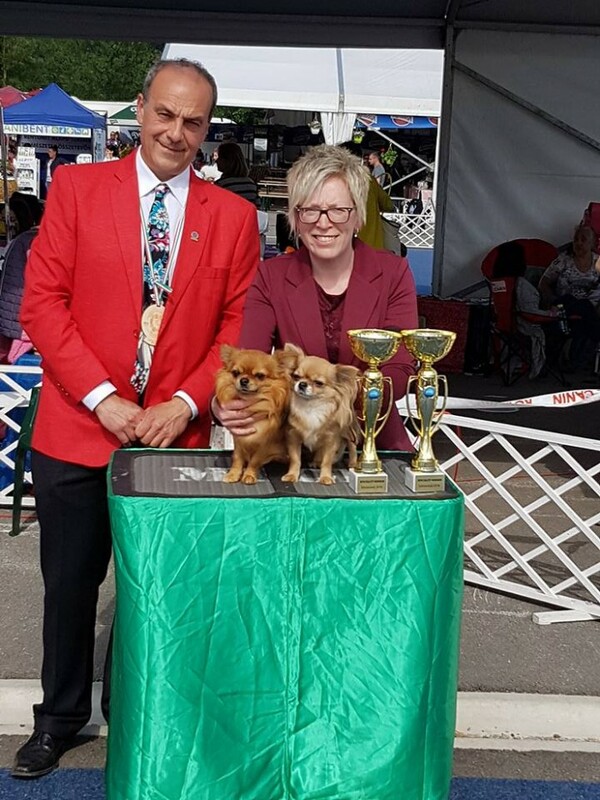 Last day at ”Voittaja Winner-2017″ EDDIE (MultiCh Tigerliljas Light Years Ahead) was again Exc (5) in a big strong champion class out-of 14 beautiful champion males. 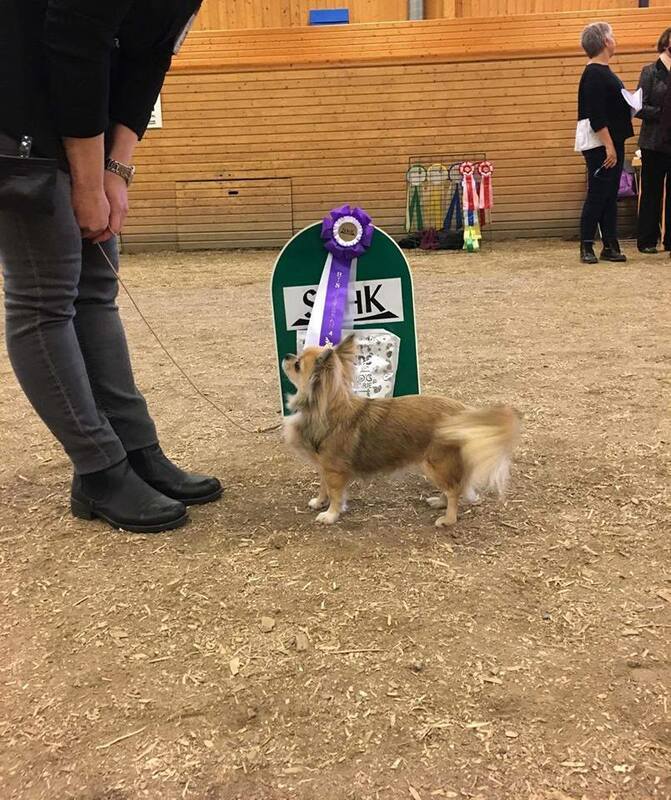 Eddie (MultiCh Tigerliljas Light Years Ahead) did great in a big strong champion class (Exc) but maybe not results to brag about. But still happy because my boy, as always makes me so proud. We had to take a ”memory picture” of us with this background. BOB- & BISS-4 VETERAN!! She was also shortlisted in the BISS final but no placement. 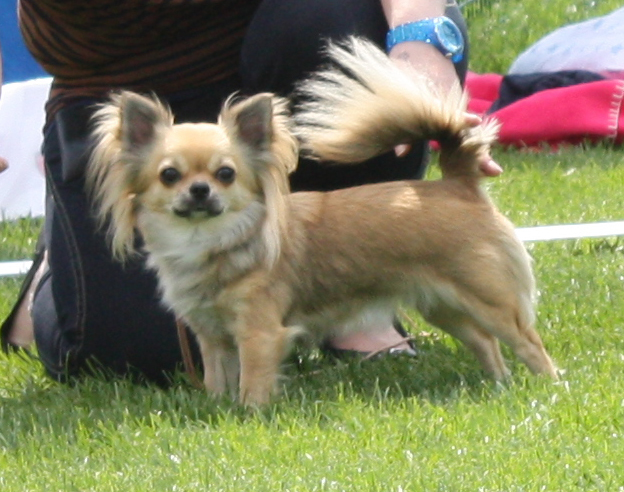 ☆ Luna (C.I.B NORD NO SE FI DK EE CH RLD N Tigerliljas Pay Attention) Exc4 with CQ. 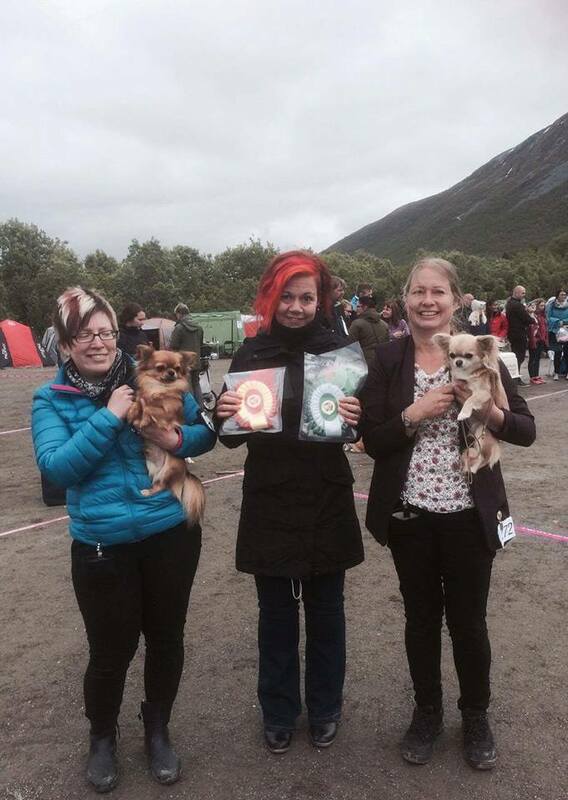 I didn´t think it was possible to have such great results two days a row but we had! So many happy tears today when my 8 year old veteran Gibson [NORD NO SE FI CH Tigerliljas Thunder And Lightning] went all the way to BOB, BOB- & BIS-2 VETERAN and finally BOG-4!!! 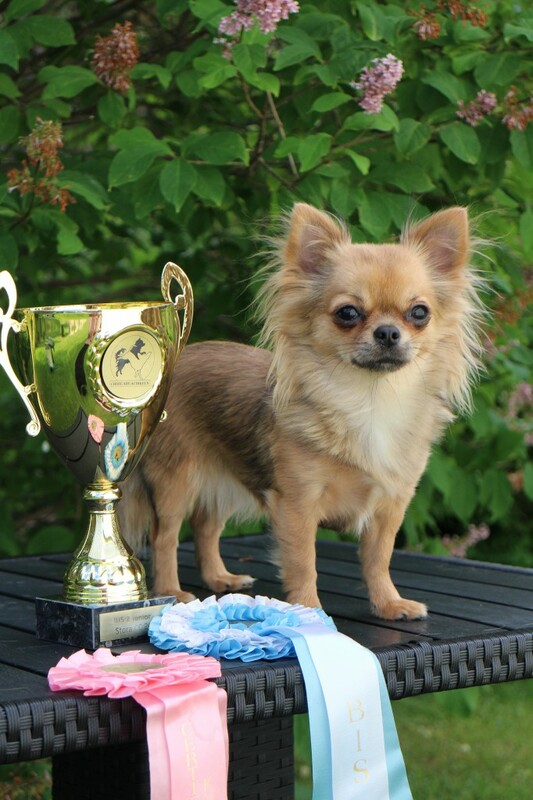 Noomi [NORD SE FI DK CH Tigerliljas Northern Light] BF-1 & BOS!! BOS-VETERAN!!! 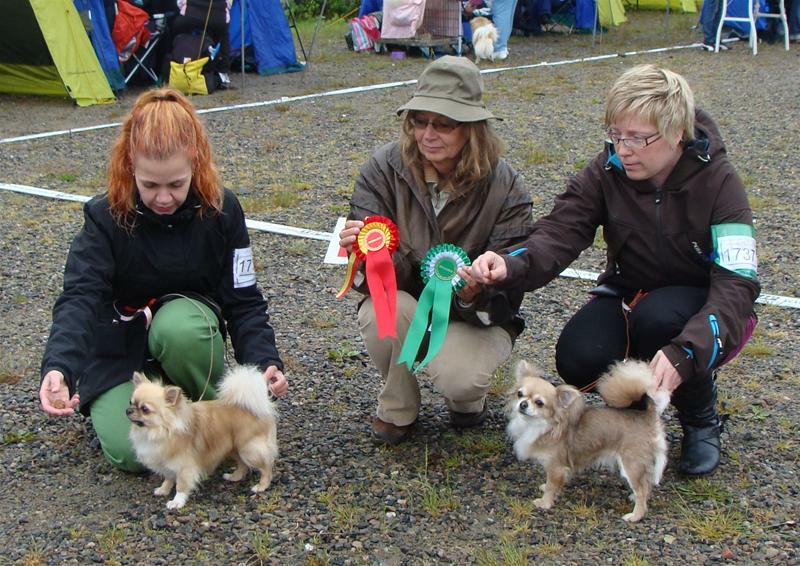 TIGERLILJAS~BEST BREEDER with HP and BEST IN SHOW-4 BREEDER!!! Crazy happy and funny day with amazing results! 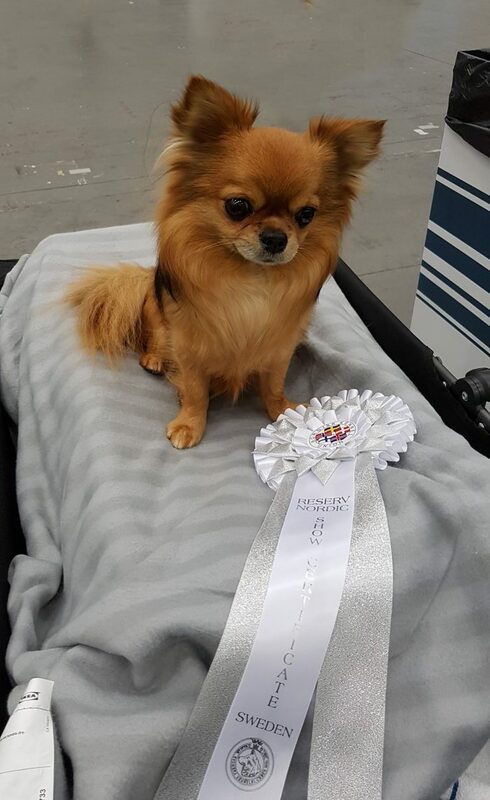 Tigerliljas Light Years Ahead [EDDIE] BM-1, BEST OF BREED!!! Shortlisted in BISS final but no placement. Tigerliljas Pay Attention [LUNA] BF-1 & BOS!!! Tigerliljas Thunder And Lightning [GIBSON] BM-4 BOS-VETERAN! 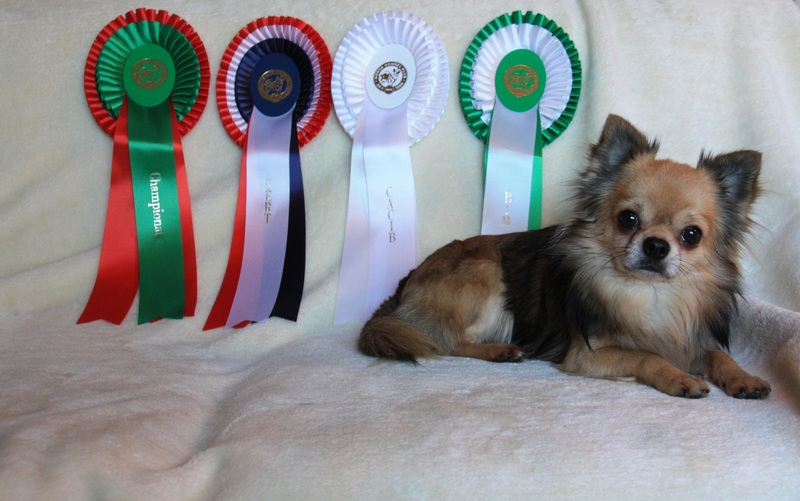 Tigerliljas Northern Light [NOOMI] BF-3 BOB- & BISS3 VETERAN!!! 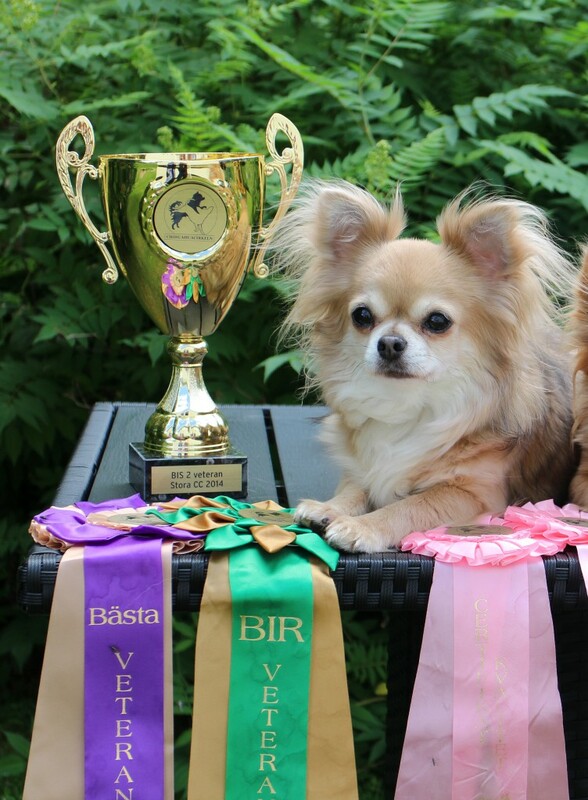 TIGERLILJAS~BEST BREEDERS GROUP with HP & BISS-2 BREEDER!!! 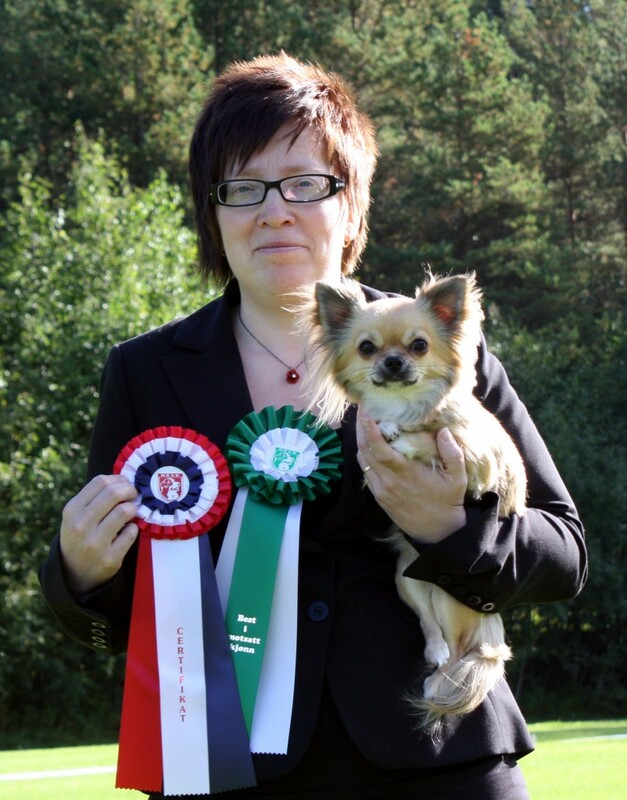 Wiiihooo, a very proud and happy breeder and owner!!! EDDIE BOB & LUNA BOS!!! Icing of the cake, we have a New C.I.B!!! 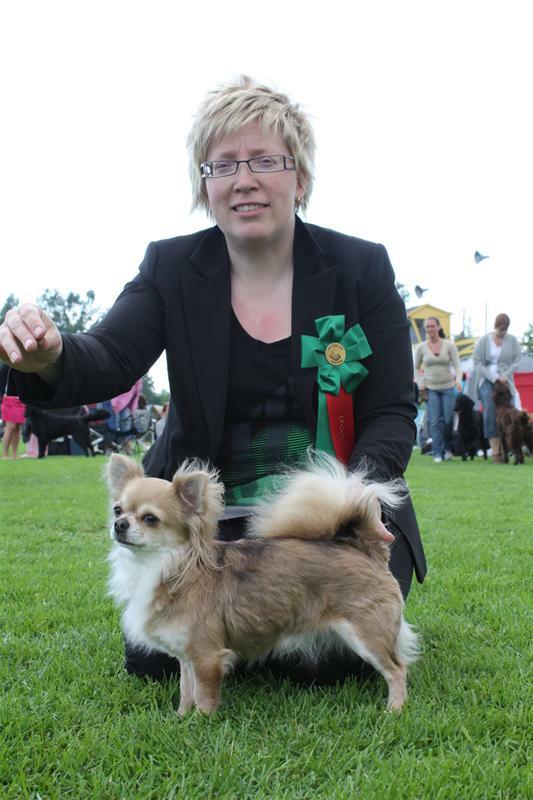 Last weekend Eddie closed his C.I.B title (pend.) and now It was Lunas turn! As I wrote above Eddie (NORD NO SE FI CH *EE CH C.I.B pend. * Tigerliljas Light Years Ahead) was BEST OF BREED. We stayed for the finals and it was a looong waiting but It was so worth it! Finally he ended-up as BOG-2!!!! Amazing feeling!! ☆Eddie BOB CACIB & BOG-2!! 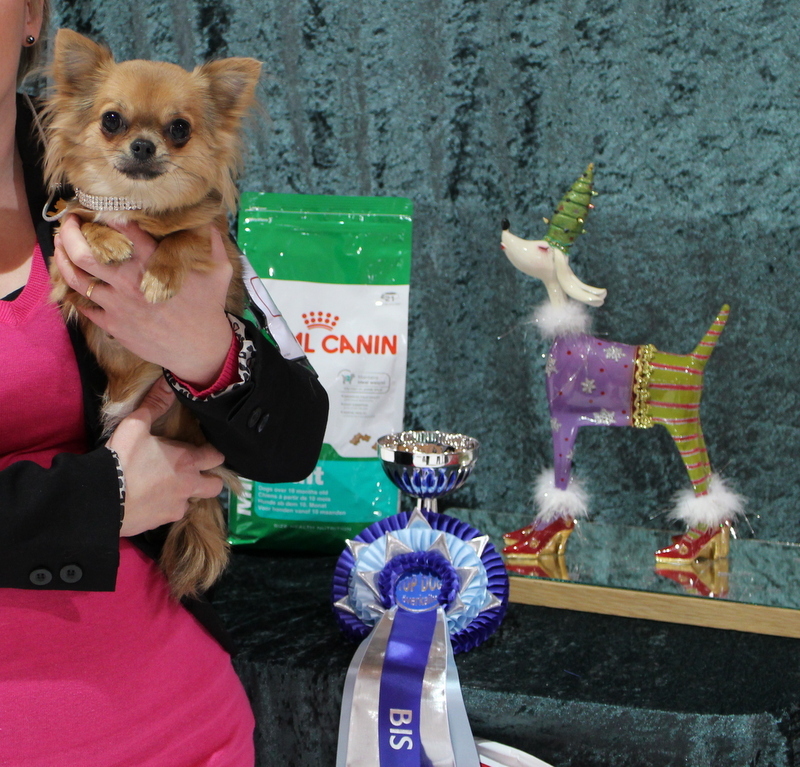 ☆Luna (NORD NO SE FI DK EE CH RLD N Tigerliljas Pay Attention) BOS CACIB & NEW INTERNATIONAL CHAMPION!!!! Day 1: Eddie (NORD NO SE FI CH *EECH *pend. 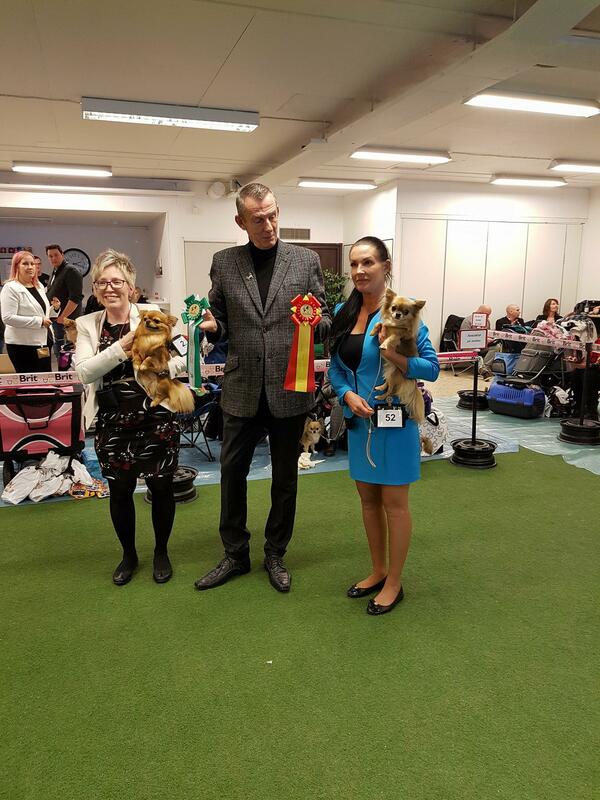 Tigerliljas Light Years Ahead) #1 BEST MALE CACIB & BOB and NEW INTERNATIONAL CHAMPION!!!!! 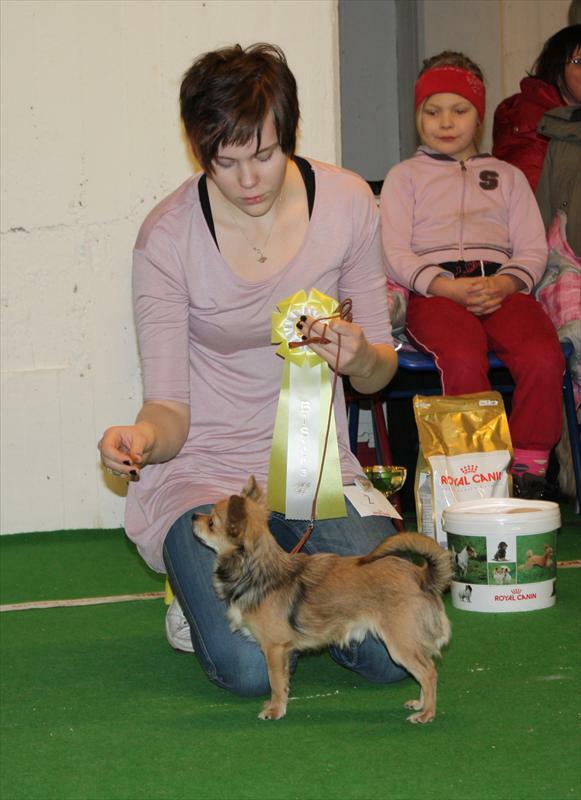 After a succesful trip to Pärnu, Estonia we have a NEW CHAMPION titel to present! 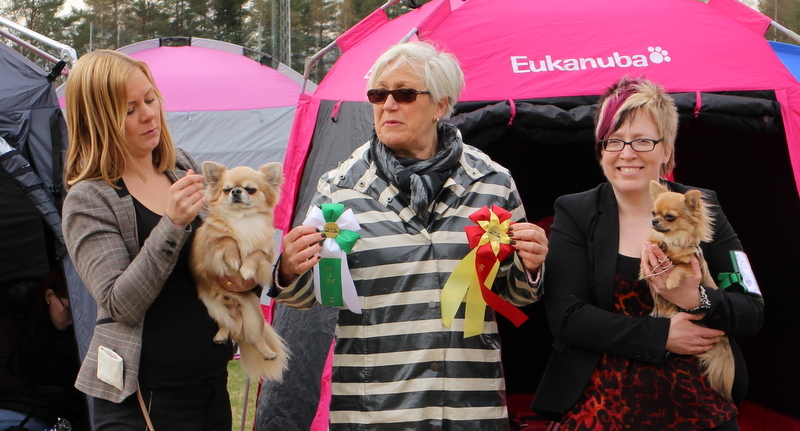 We participated for 3 days in Pärnu. 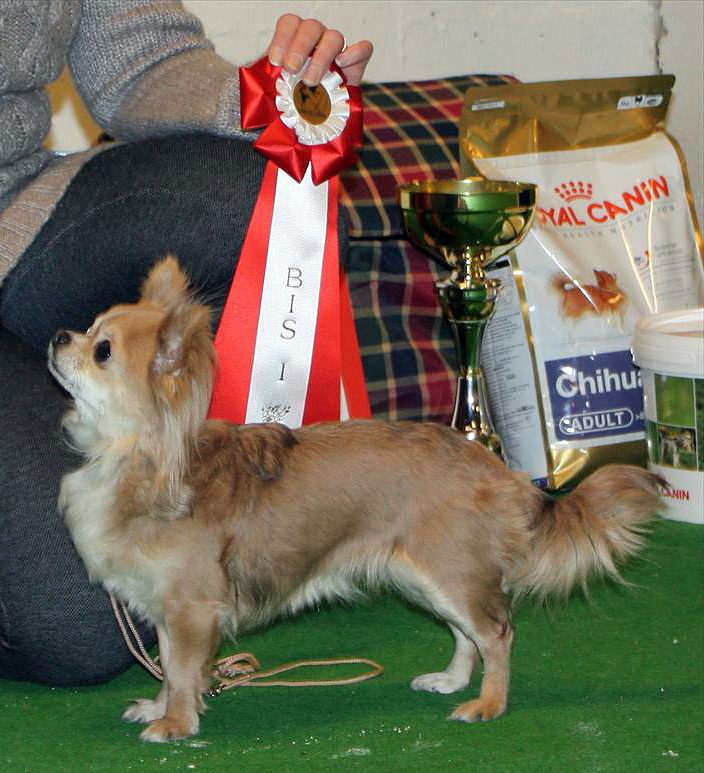 EDDIE (NORD NO SE FI CH Tigerliljas Light Years Ahead) BM-1 CAC BOS & NEW ESTONIAN CHAMPION!!!! 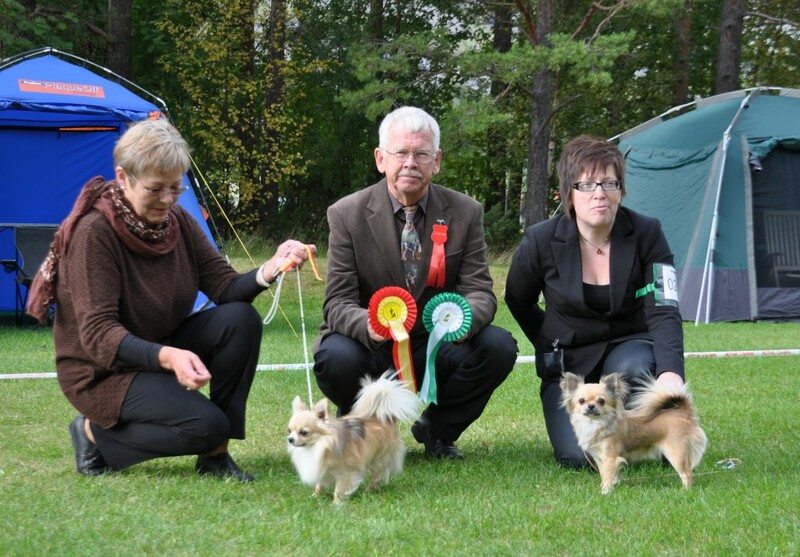 *Tigerliljas- Best Breeder group with HP & BIS 3 GROUP!!! 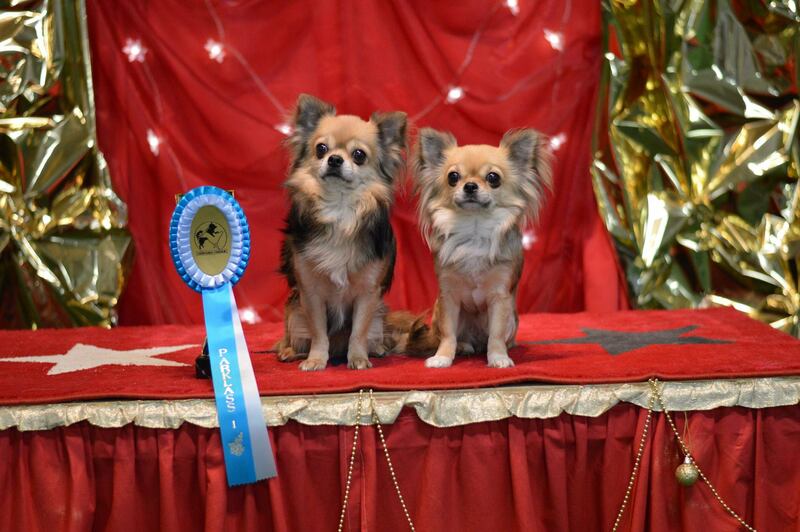 Both Gibson & Luna so close again a new INT champion title..
EDDIE BEST MALE ~ CACIB ~ BEST OF BREED!!! .. Now 2 days from ”closing” his INT champion title. 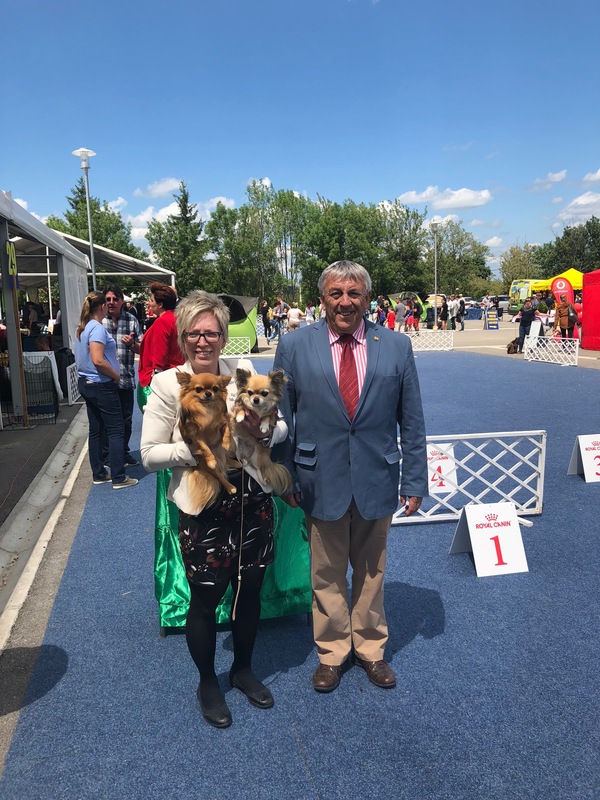 I will allways remember the judge words when he said to me – When he entered the ring I thought, Wow I realy REALY love that dog! 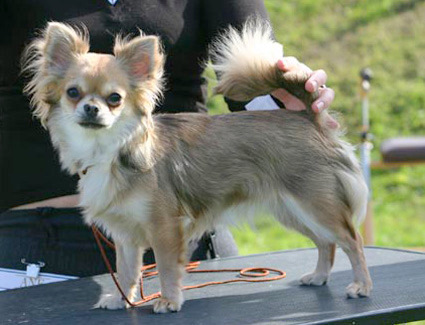 *TIGERLILJAS 2nd Breeders group with HP. EDDIE (NORD NO SE FI CH Tigerliljas Light Years Ahead) BEST MALE~ CACIB ~ BOS!!! 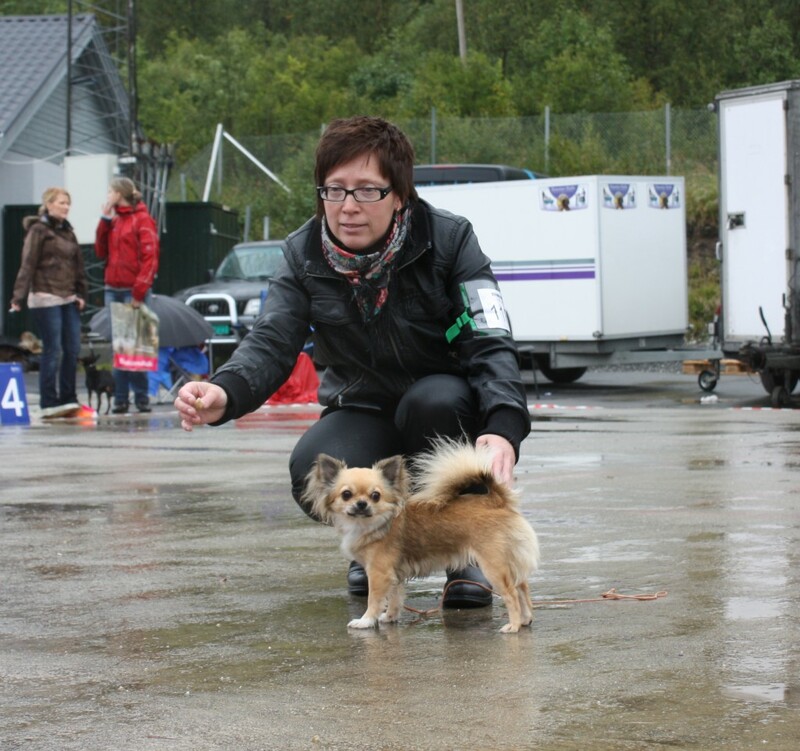 We didn’t stay for the finals because of the long trip ahead going to Tromsö for show the next day. EDDIE was 3 days from ”closing” his Int. 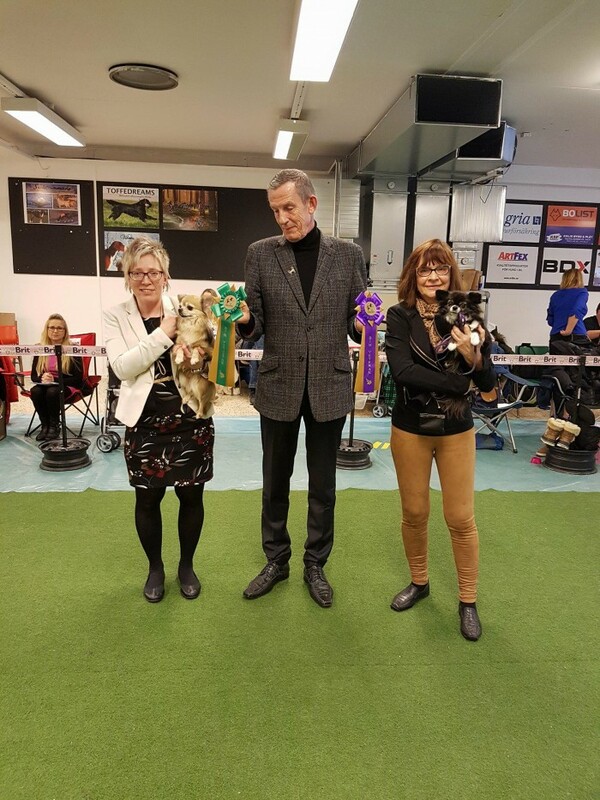 champion title.. and Luna also so close her INT champion title..
My old man, almost 8 years old GIBSON (CH TL Thunder And Lightning) Winner of Championclass with CQ, Best Male & BOS!!! Wow, Jiiiipiii!!! EDDIE (CH TL Light Years Ahead) Exc. LUNA (CH TL Pay Attention) Exc 2 CQ BF-3. 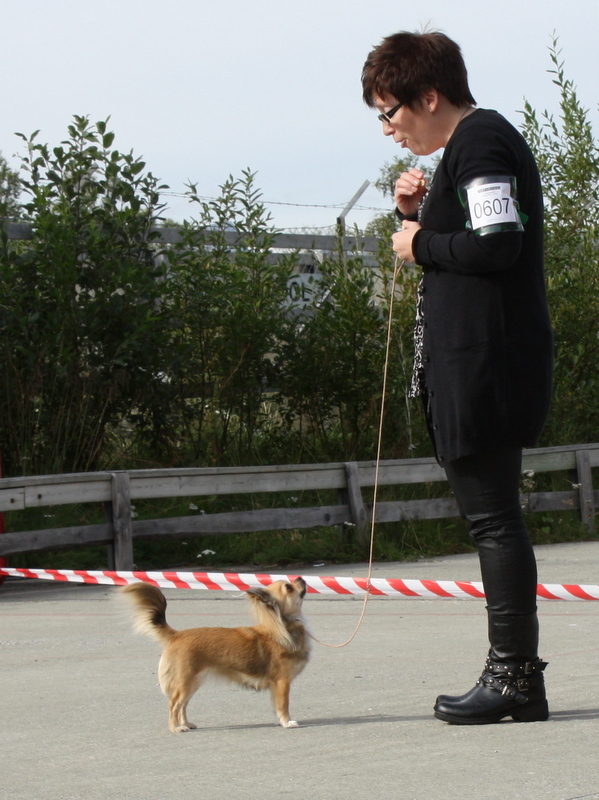 NOOMI (CH TL Northern Light) Exc 3 CQ BF-4. 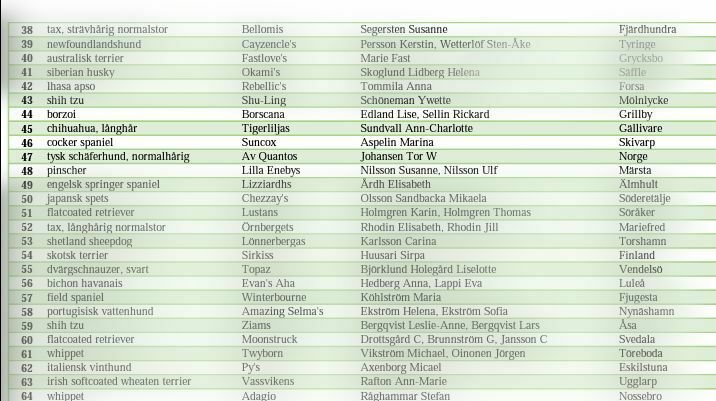 If this wasn´t enough..Best Breeder Group with honourprize & finally BIS-3 BREEDER GROUP again! I´m so proud and happy! 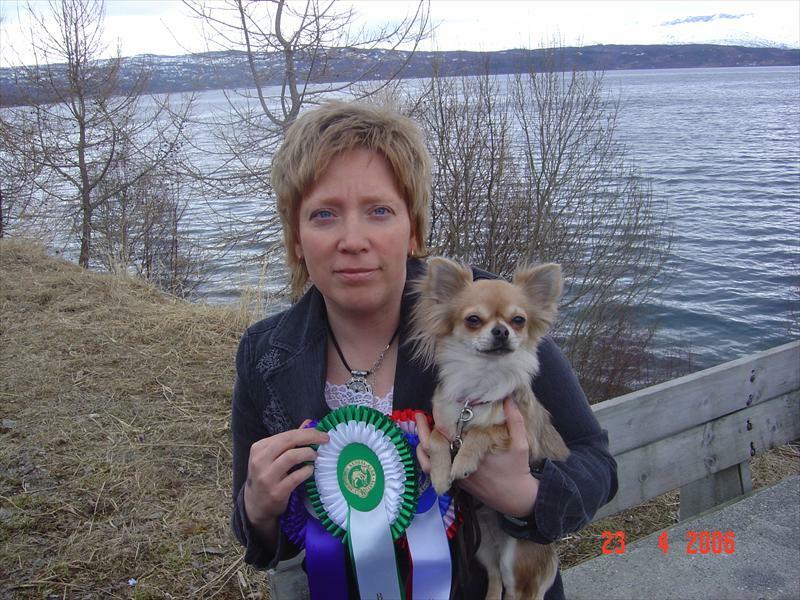 I´m forever thankful to Sandra Engström who showed Gibson & Noomi to perfection and for all her help with my Breedergroup <3 Love you my dear friend. 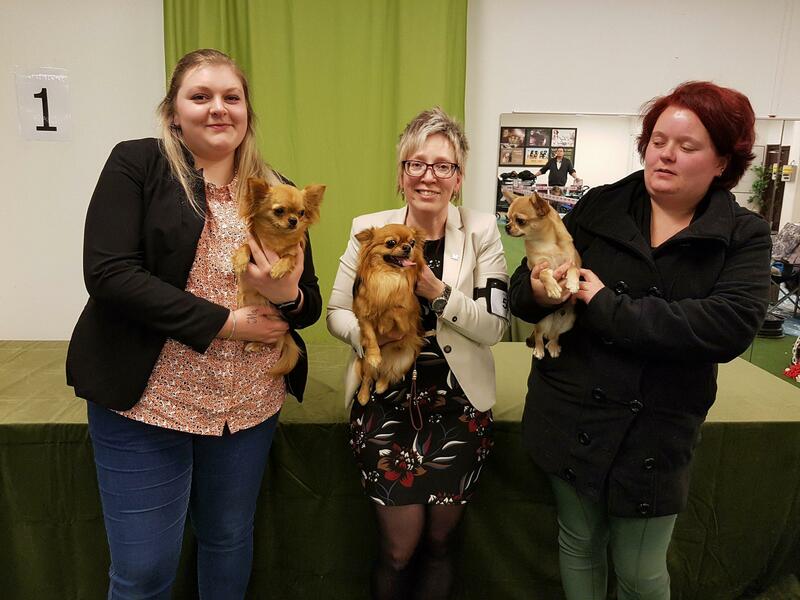 TIGERLILJAS~ Best Breeder Group with honourprize & finally BISS-3 BREEDER GROUP!!! 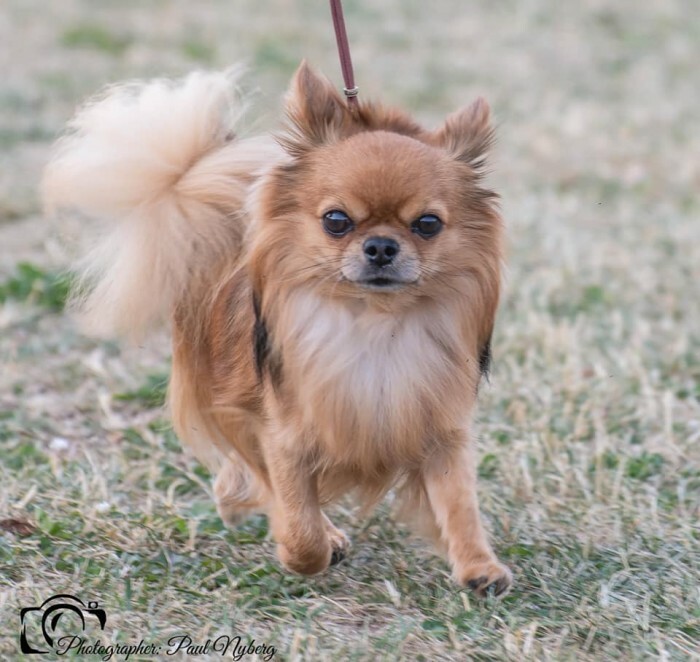 CHARLIE (I´m Amazing Secret Of Angels) BM-4, BOB-& BISS Intermediate!!! EDDIE (NORD NO SE FI CH TigerLiljas Light Years Ahead) Exc 2,CQ . 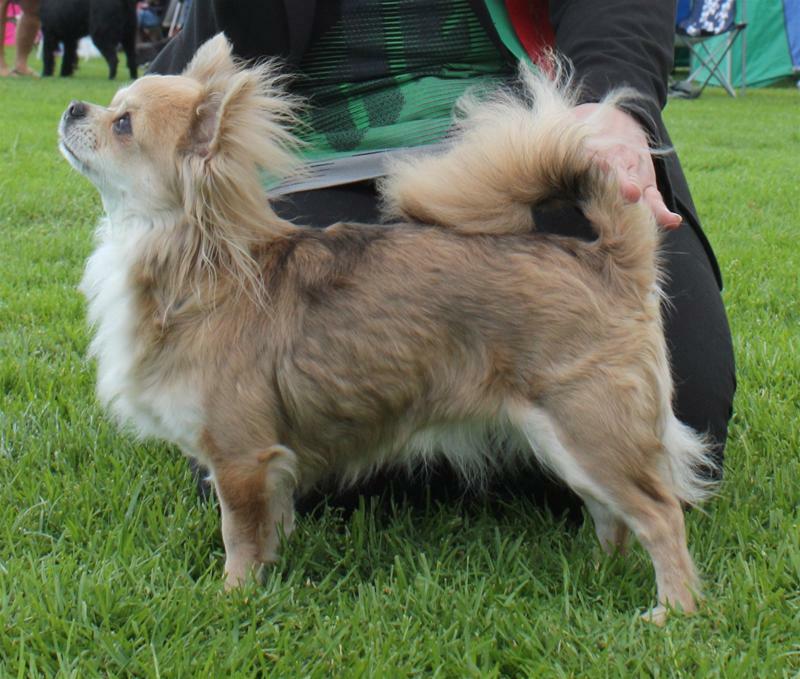 GIBSON (NORD SE FI NO CH TigerLiljas… Thunder And Lightning) Exc 4. LUNA (NORD NO SE FI DK EECH RLD N TigerLiljas Pay Attention) Exc 2, CQ BF-2. NOOMI (NORD SE FI DKCH TigerLiljas Northern Light) Exc 3, CQ BF-4. What a fantastic day! Great results at our biggest show of the year Swedish Chihuahua Specialty ”Stora CC” 2017, 124 LC entered! 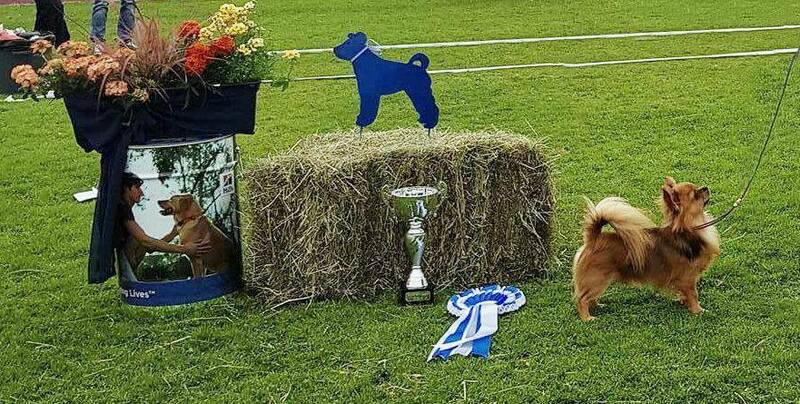 *EDDIE (NORD SE FI NO CH Tigerliljas Light Years Ahead) Winner of a big strong champion class with CQ and ended-up as 4th Best male!!! Nominated for best head and movement competition and ended-up as 2nd best movement! 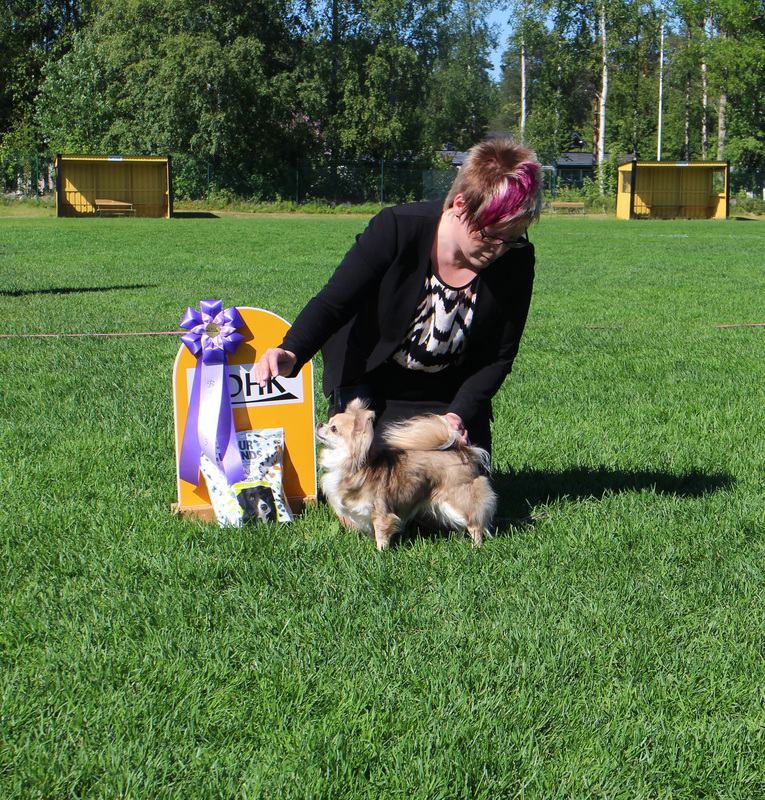 *LUNA (NORD DK EE CH RLD N Tigerliljas Pay Attention)… Exc 3 with CQ (in a big strong champion class) & ended-up as 4th Best female!!! Nominated for best head and movement competition. 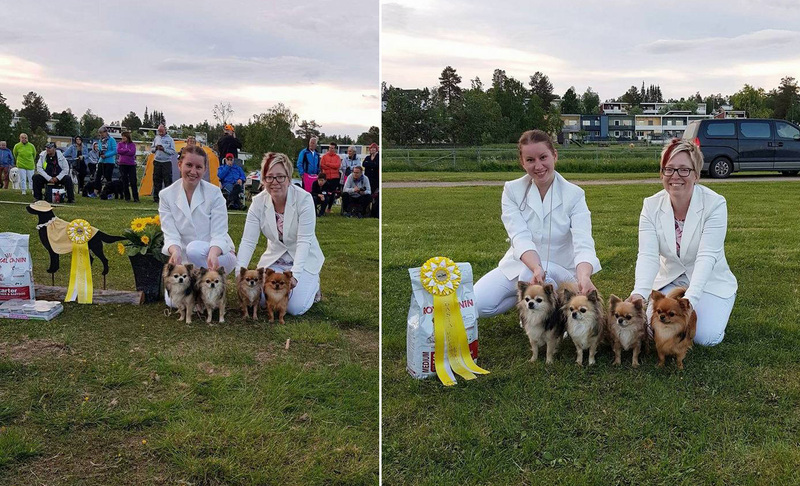 *Big congratulations to Zeb & Joy (Eddies offspring) and my dear friend Kerstin Ström <3 It was their debut in Puppy class (4-6 month) and they did so well! 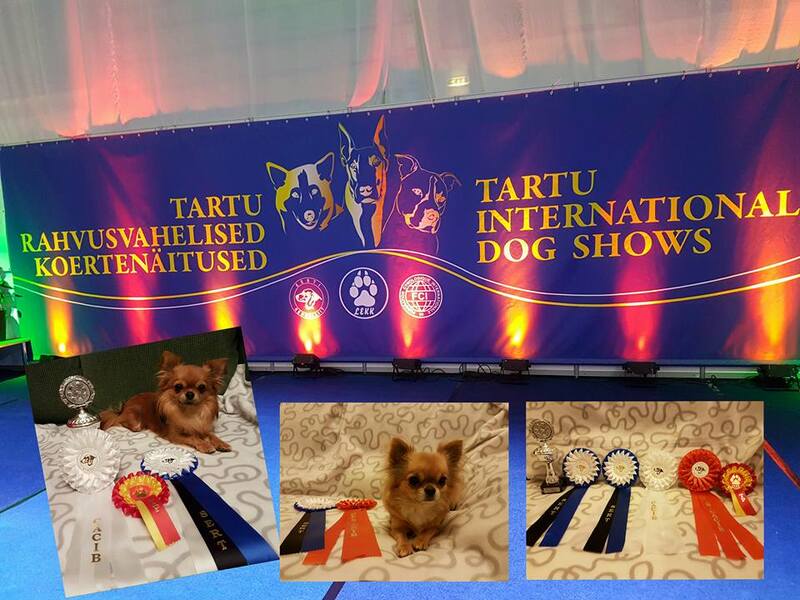 ZEB (Chisbeautiful A Touch Of Light -Ness) Best male puppy with honour prize x 2 , 2 x BOS Puppy, BISS 3 & BISS 4 Puppy!!! 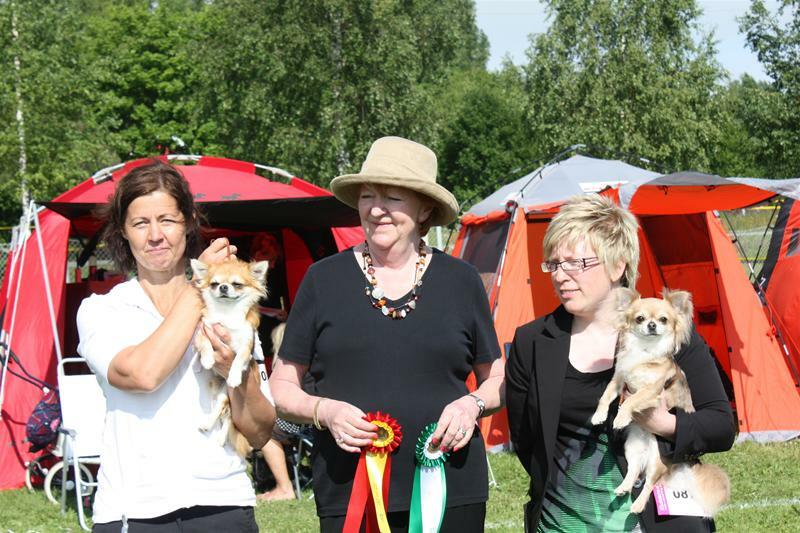 JOY (Chisbeautiful A Fab Black Pearl) 2nd Best female puppy with honour prize x 2. Crazy happy day with amaziiing results!!! 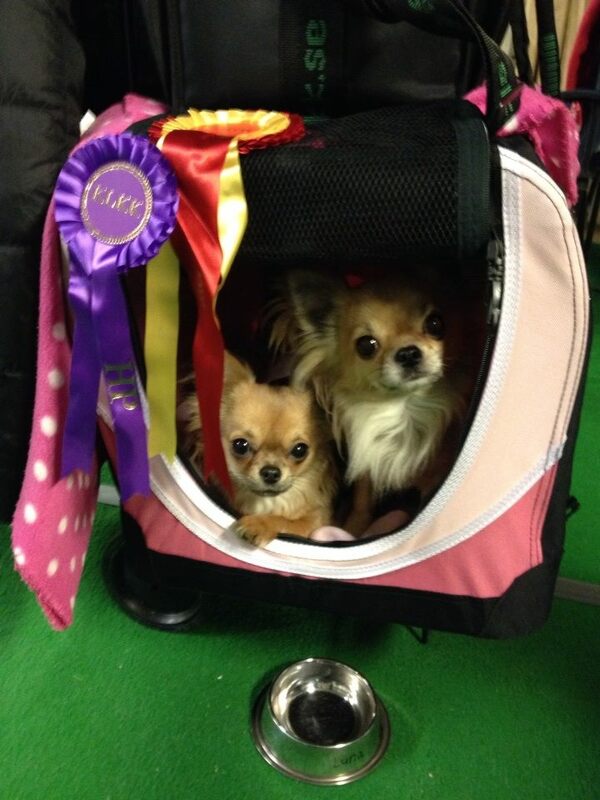 *TigerLiljas Breeders Group, Best Group with HP and BEST IN SHOW!!! *Eddie & Luna BISS-4 Brace!!! 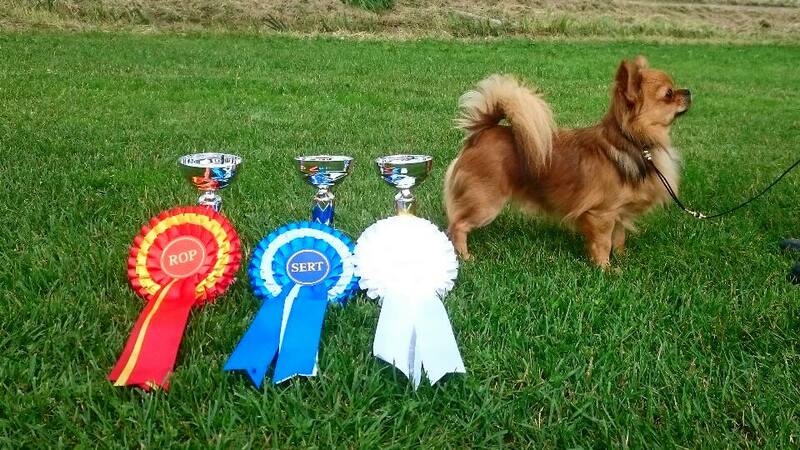 *Eddie ( NORD NO SE FI CH TigerLiljas Light Years Ahead) CH.class; Exc5 with CQ (BM 5) Nominated for Best Temperament & Best Head Competition. 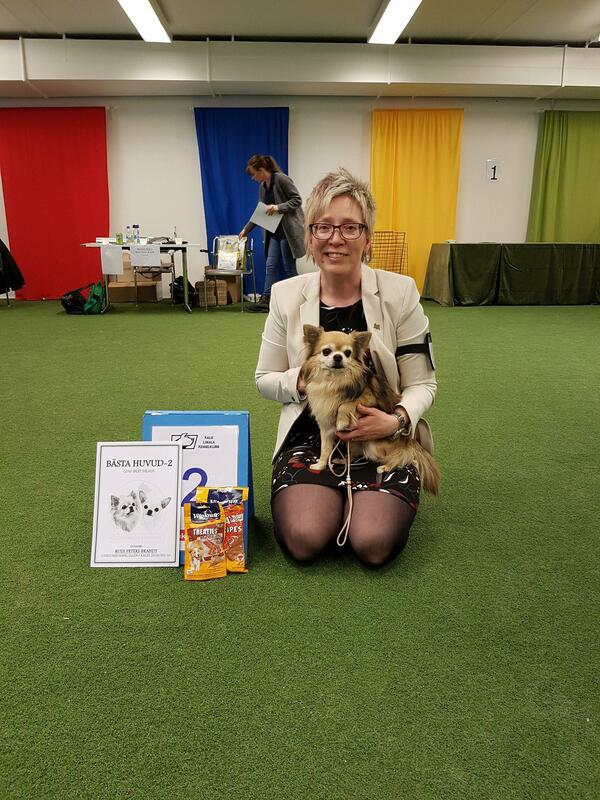 *Charlie (I’m Amazing Secret Of Angels) Winner of Intermediate Class with CQ, BM 3, R-CAC. 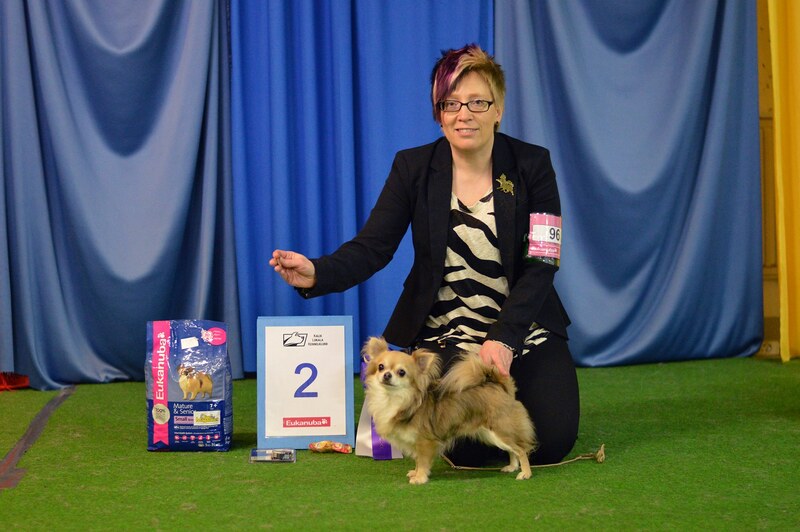 BOB- & BISS 2 Intermediate!!! 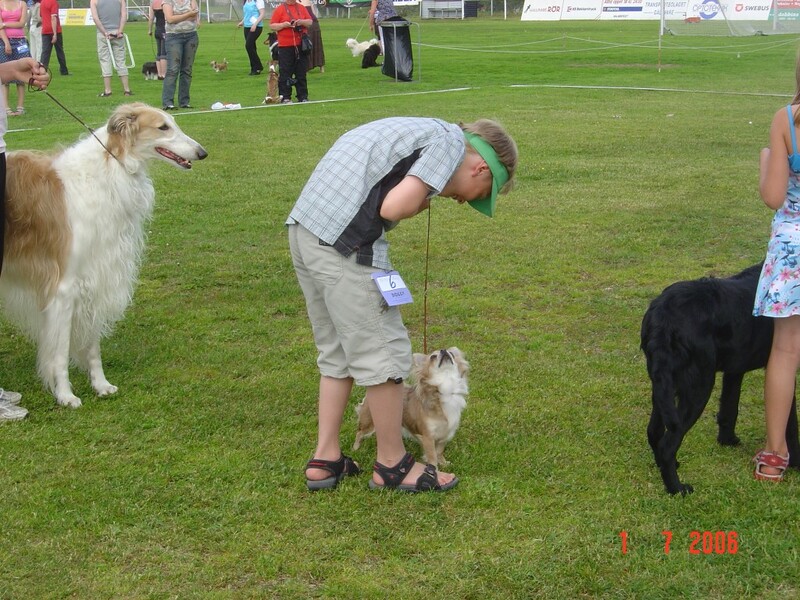 Nominated for Best Temperament- Head & Movement Competition. Thanks to my dear friends Sandra, Katarina, Sara and Kerstin who helped me during the day and made this so much easier and possible for me. 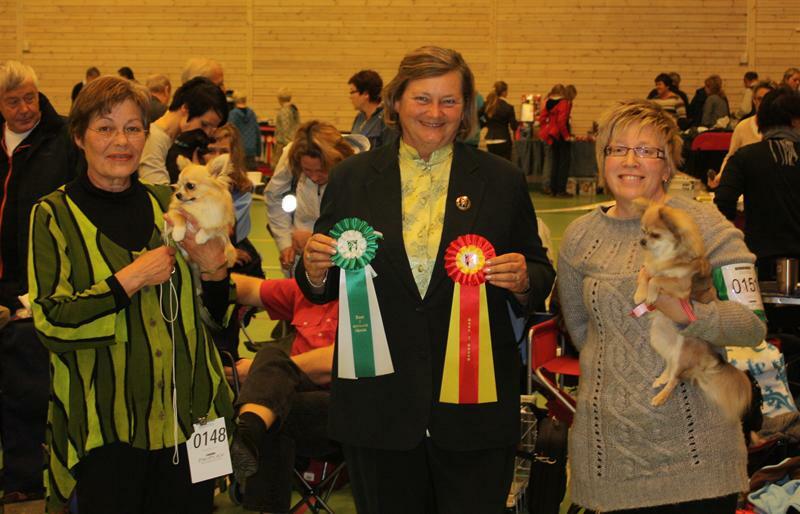 And last a big thank’s to judge Jeanette A. Bengtsen who appreciated my dogs and my breeding. 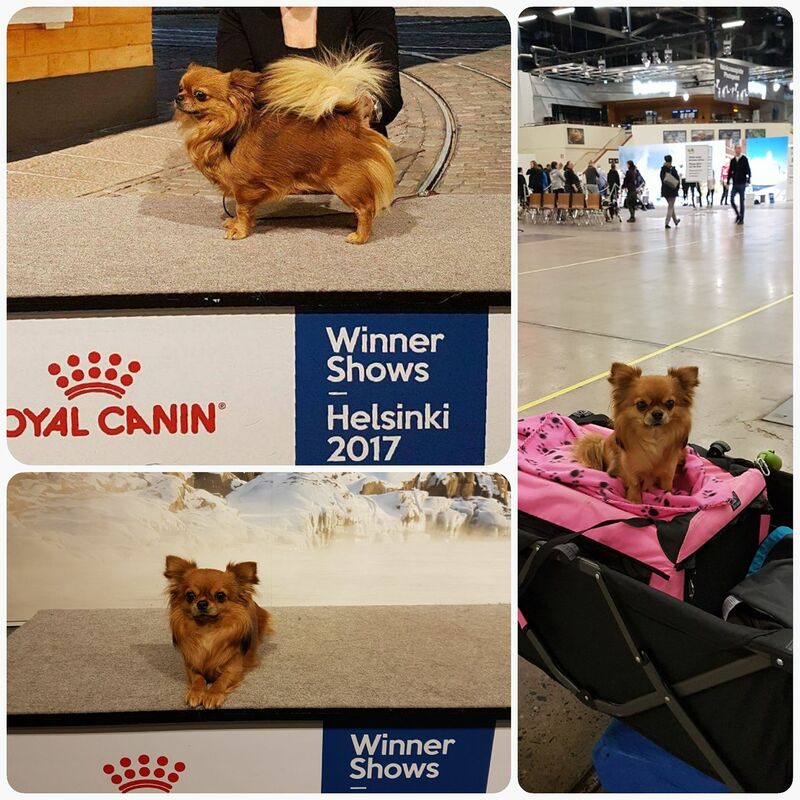 We had a VERY long trip to National Dogshow Letohallen (driving car totally 2800 km this weekend!) but the trip was so worth it! I´m so crazy happy, Wiiihoooo!!!! TigerLiljas Light Years Ahead, Openclass; Exc 1 CQ BM 2 with CAC !! 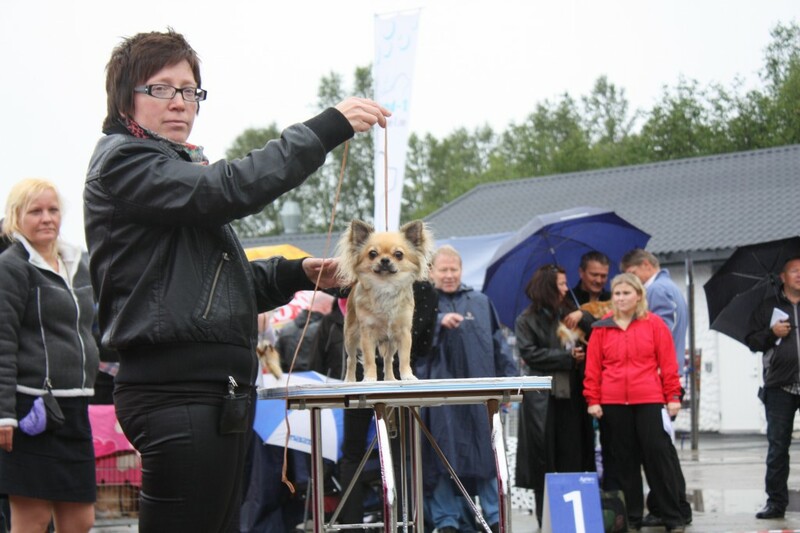 We have a New Nordic Norweigan Swedish & Finnish Champion!!!! 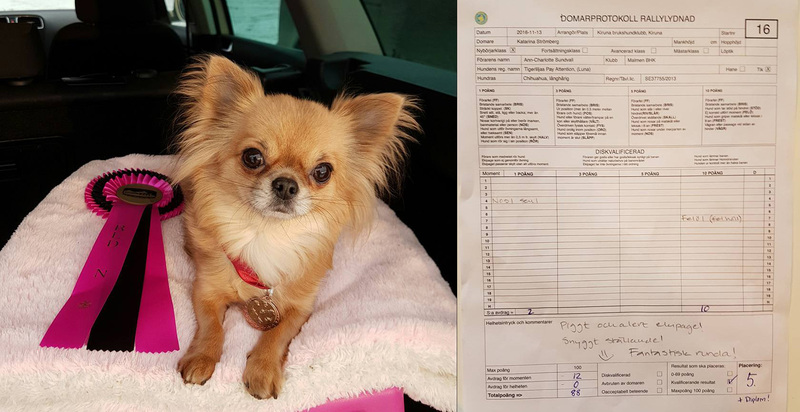 It turned out we had done well with succesful results, 88 Point ( 5th Place) and with her performance Luna got her Biginners class Diploma and can now add a new title to her name RLD N !!!! Round could have been nearly flawless if it had not been for me .. I tabbed in a part, made a ”spin” in the wrong direction (apparently perfect 😉 ) and we got a reduction of -10 points. Otherwise only -2 Points reduction on ”nose and late”. Wow, I said to myself! Maybe not so great for others but for us 😀 I’m so happy and above all especially proud of my princess and I long and looking forward to new events in the future. NORD NO SE FI EE CH, RLD N TigerLiljas Pay Attention!!!! 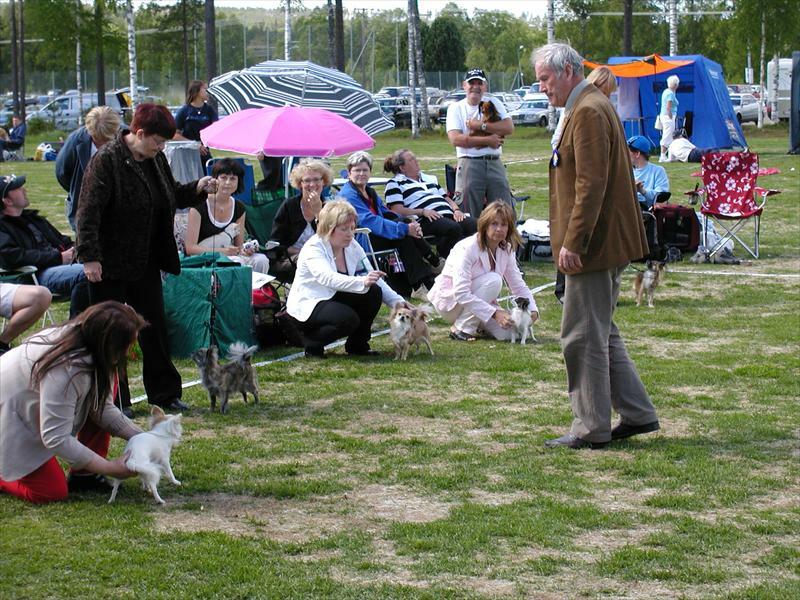 Second round – Not qualified result (62 point- 13th place). In this results, we did including two misstakes were we not carried out correctly two parts. Given that we haven´t practicing so much, it went beyond expectations. 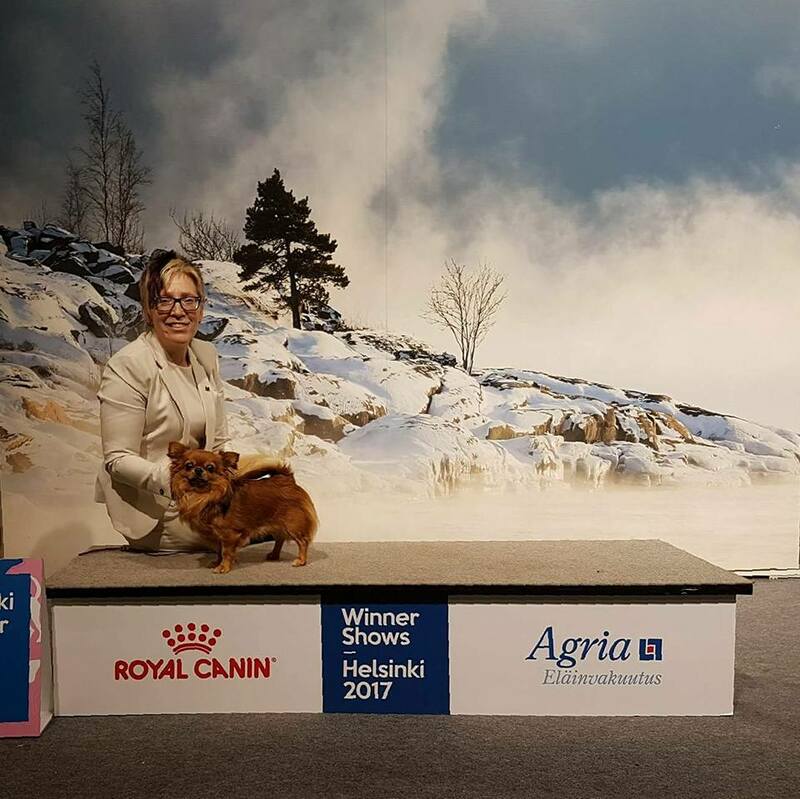 🙂 Pleased with the day and hoping for one more qualified results tomorrow, so Luna get her diploma.. The show results were amaazing this weekend!!! Wiiihooo!!! Day 1: TigerLiljas Light Years Ahead, BM 1 CAC CACIB & BEST OF BREED!!! 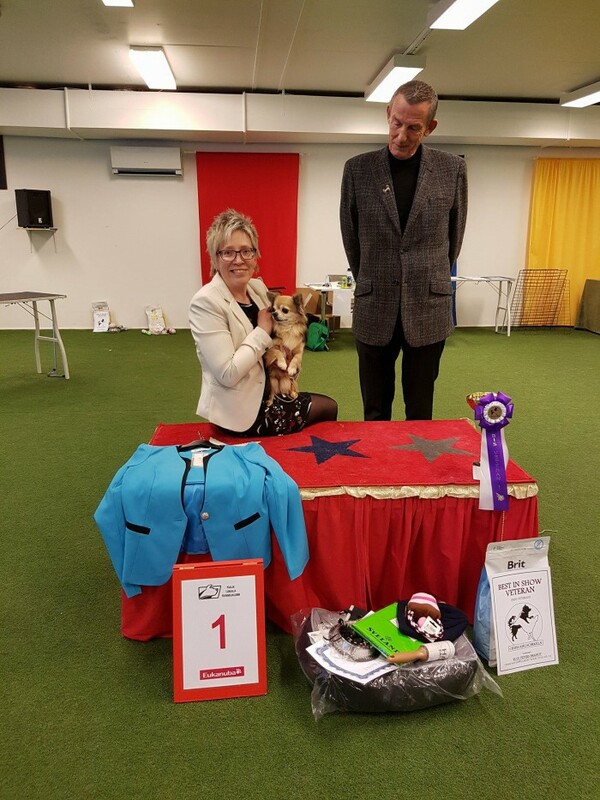 My Little showman ”Eddie” (TigerLiljas Light Years Ahead) was not at all at his ”showmood” today, his results was Exc 2 in Intermediateclass. 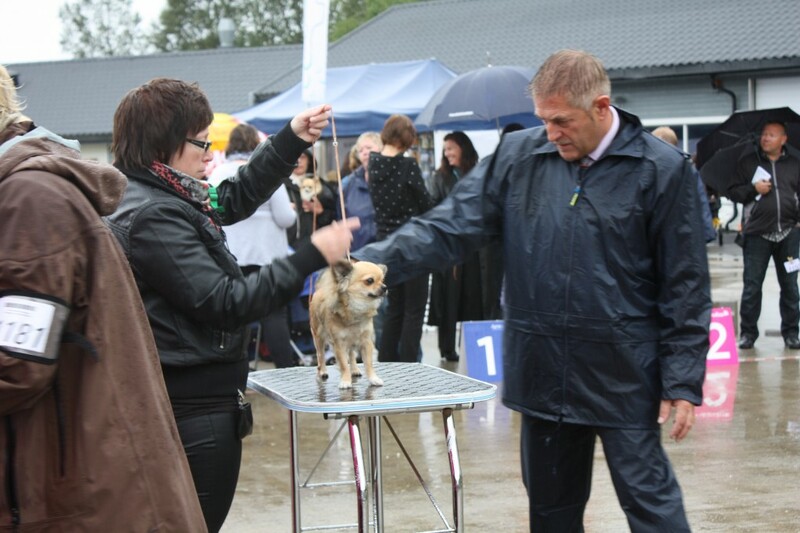 Luna (NORD NO SE FI DK CH TigerLiljas Pay Attention) BF 2 CAC R-CACIB and NEW ESTONIAN CHAMPION!!! 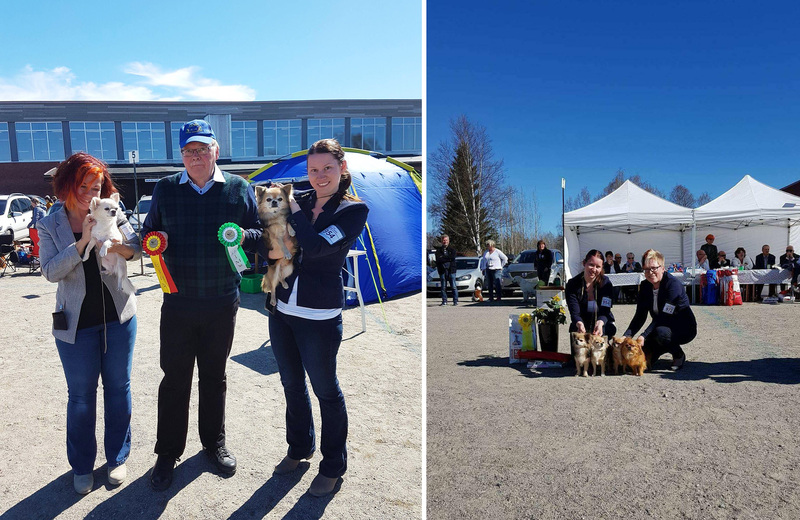 Great day at Rovaniemi Group show! 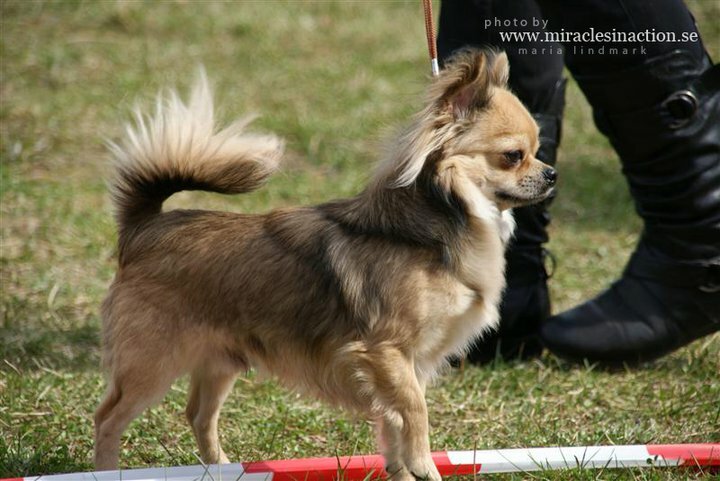 TigerLiljas Light Years Ahead BM 1 CAC & BEST OF BREED! In the final, in a very big group (Group 3 & 9 together) he was placed as BOG 3!!! 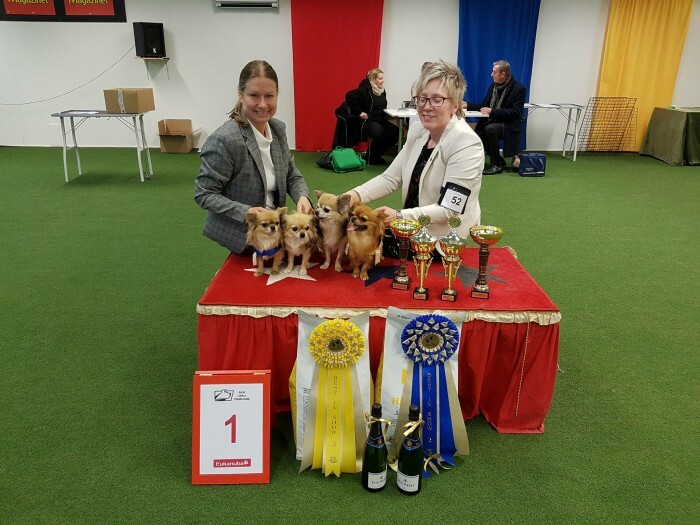 TigerLiljas Light Years Ahead, Intermediate class; Exc 1 CQ BM1 CAC BOB BOB-Intermediate BISS 3-Intermediate BEST IN SHOW 4!!! 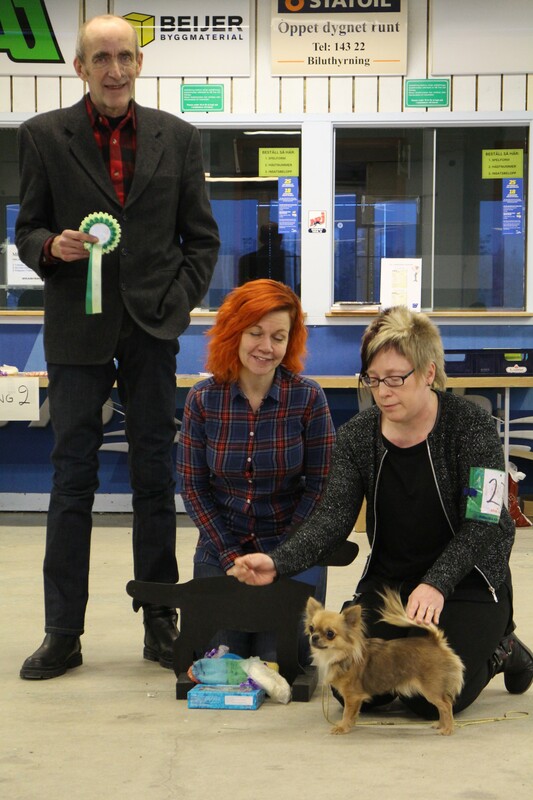 BISS Judges: Bengt-Åke Bogren & Alexandra Polumbo. After a long drive all night long (about 1100 km) we finally come to Kittilä Group show. Another succesful day for Eddie, BM 2 with CAC!!! TigerLiljas Light Years Ahead BOB CAC CACIB!!! TigerLiljas Light Years Ahead BOB CAC CACIB !!! 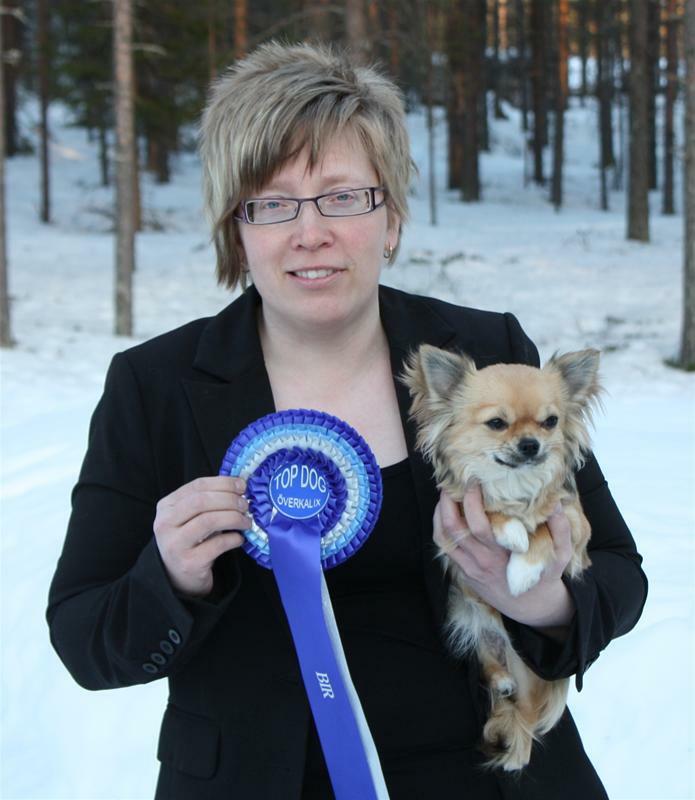 Big thank’s to judge Elisabeth Spillman -Åkerlund for appreciate my boy and for all the nice words about him. I’m ”over the moon happy” for this weekends results. Eddie (TigerLiljas Light Years Ahead) BM1 CAC CACIB & BOB!!! He was shortlisted in the group finals but no placement. 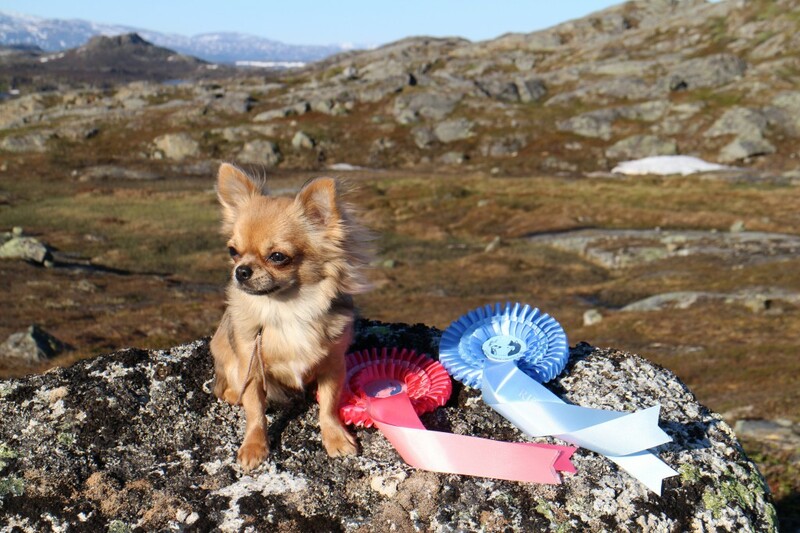 Noomi (SE FI DK NORD CH TigerLiljas Northern Light) EXC1, CQ. TigerLiljas Light Years Ahead ~ Eddie BM2 with R-CAC. Nominated to ”Best head competition” and ended-up as 4th best head. The show took place at the beautiful Grand Hotel in Stockholm. We had an luxurious day where we were served Afternoon tea, scones, sandwiches and pastries, and other ”goodies” through-out the day. 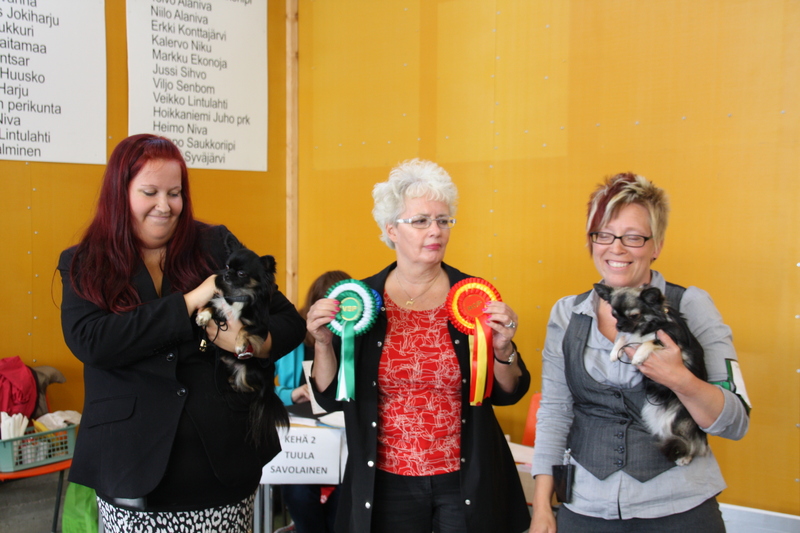 The show was to select Puppy of the Year-2015. 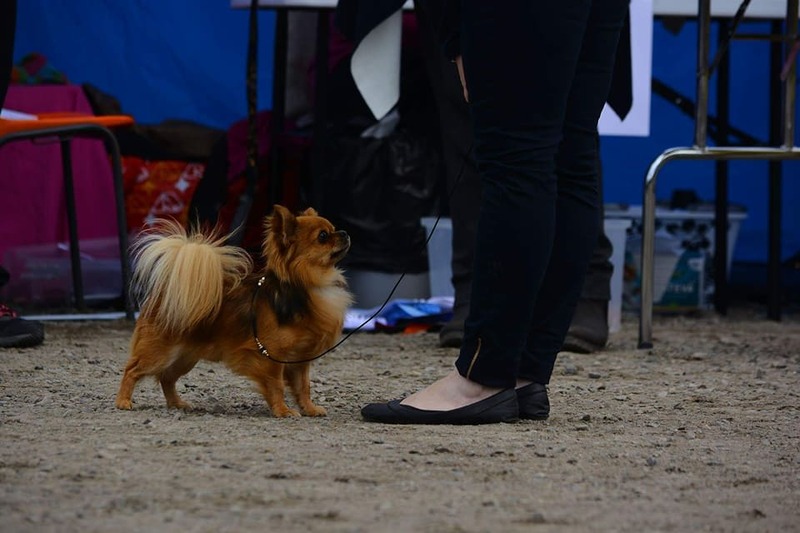 My BIG love Eddie <3 (Tigerliljas Light Years Ahead) was one of the dogs that was qualified to participate in this event. 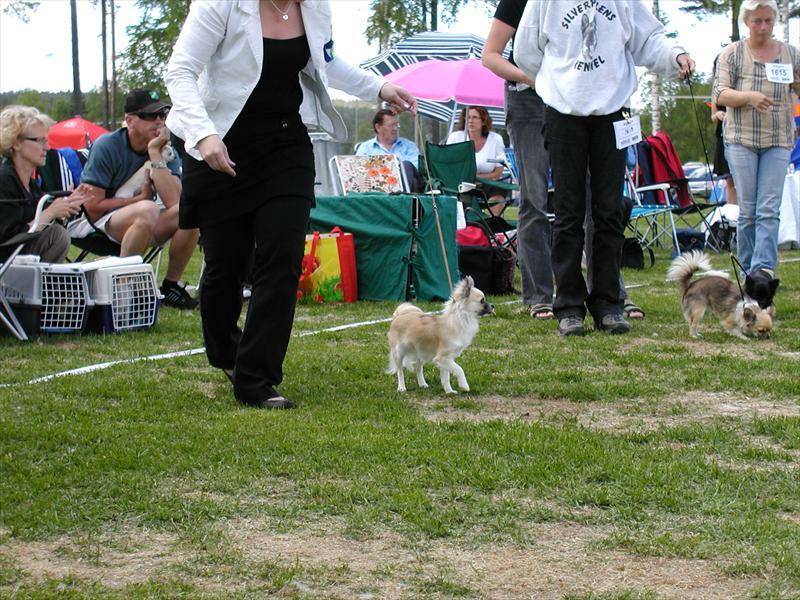 Eddie did excellent and participate/remained until the 3rd round (out of five), among many other beautiful dogs. It was also a great honor when Eddie was awarded the Kenneth Edh memory price. 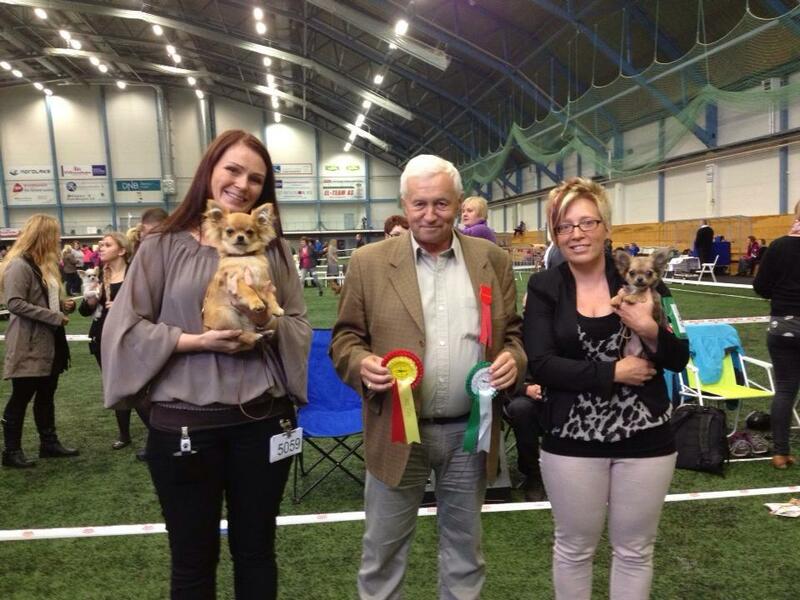 Judge: Dan Ericsson Very nice event and a memory for life! December 12, 2015TigerLiljas Light Years Ahead ”Eddie” did great; Exc 2 with CQ in a big and strong Beautiful Junior class! 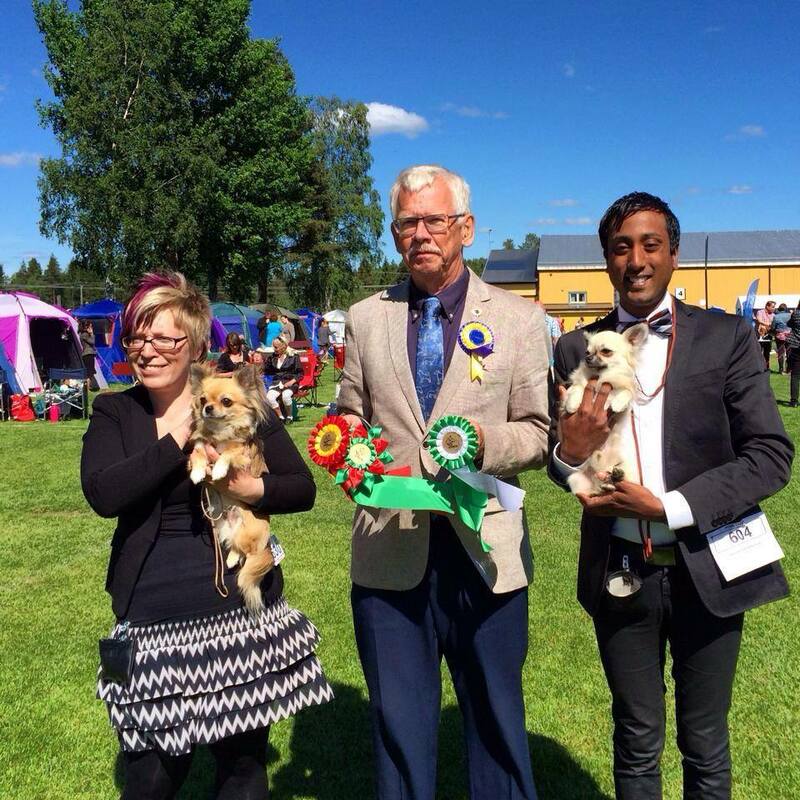 No 3 Most Winning Lc Puppy in Sweden- 2015!!! 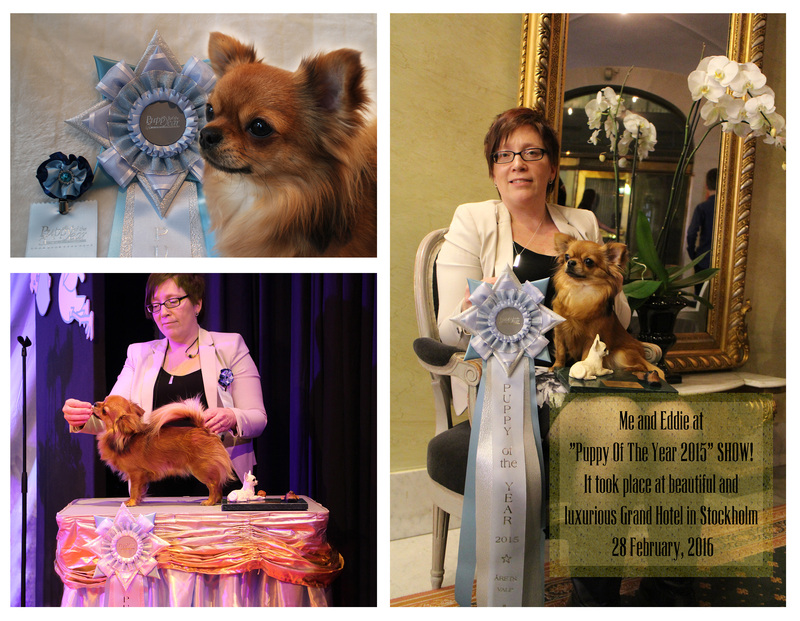 Also qualified to the event ”Puppy Of The Year- Årets Valp-2015”!!! 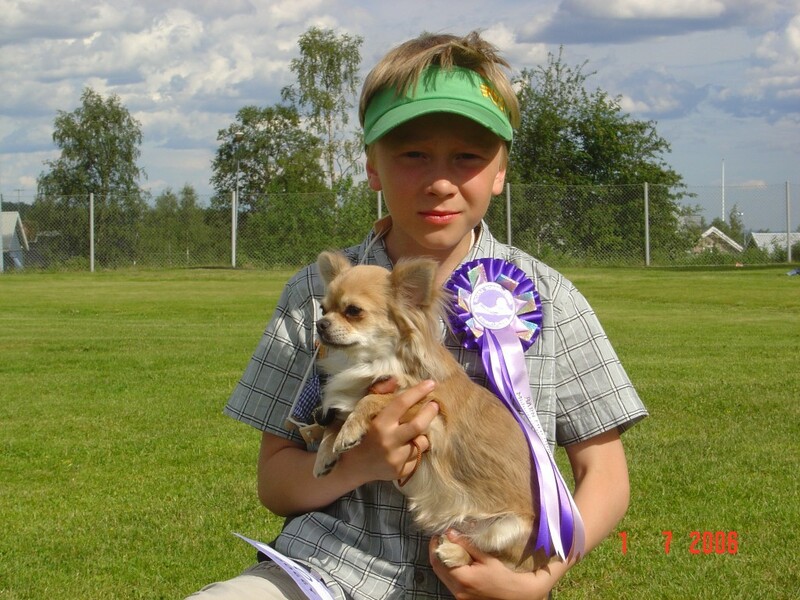 He has had a great puppy career and very nice start in Juniorclass. I´m so proud of him. 1x R-CAC (DK) At only 9 month old! 1x R-CAC (SE) At only 9 month old! 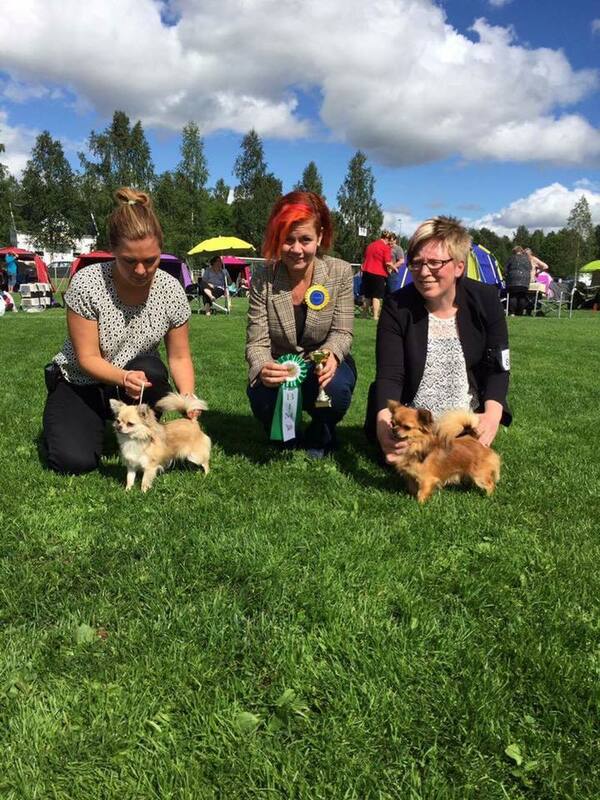 No 3 Top Winning Lc PUPPY in Sweden -2015!!! TigerLiljas Light Years Ahead, Juniorclass: Exc 1 CQ BM 2 CAC!!! TigerLiljas Light Years Ahead, Juniorclass: Exc 1 CQ BM 2 R-CAC! TigerLiljas Light Years Ahead, Juniorclass: Exc 2 CQ BM 4 & R-CAC! TigerLiljas Light Years Ahead ; BOB-PUPPY! TigerLiljas Light Years Ahead BOB-PUPPY!!! TigerLiljas Light Years Ahead ; BOB- & BISS 2 PUPPY!!!!! 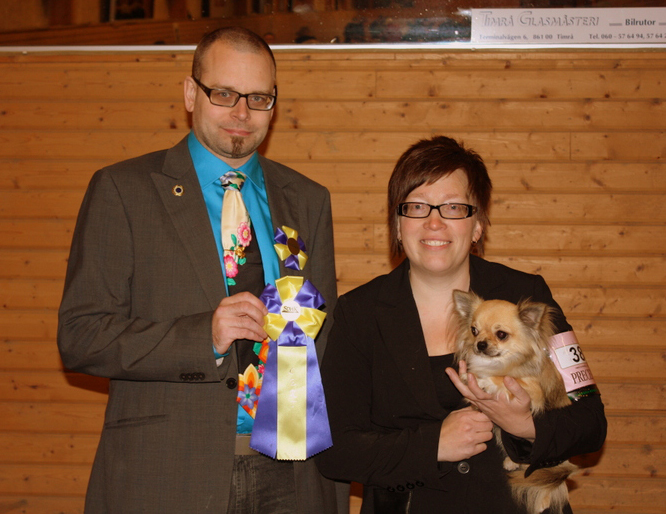 CH TigerLiljas Northern Light ; BF 1 CAC BOS – New NORDIC SWEDISH FINNISH & DANISH CHAMPION!!!!!! 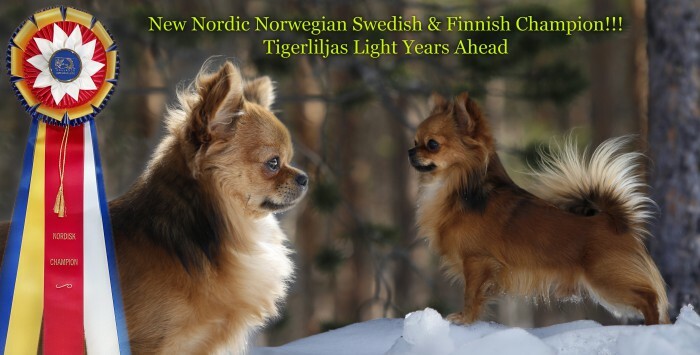 TigerLiljas Light Years Ahead BOB- & BIS 2 PUPPY!!! 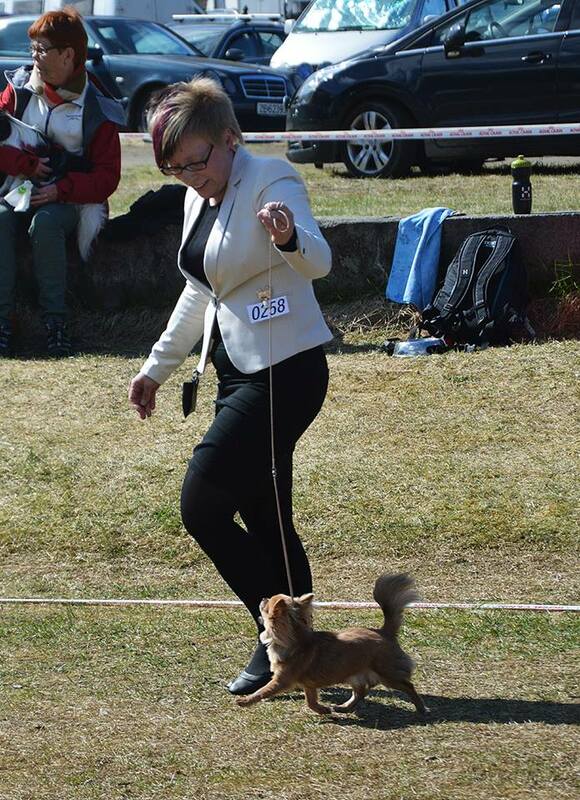 NORD NO SE FI DK CH TigerLiljas Pay Attention Ch.class: Exc 1 CQ BEST FEMALE CACIB BOS!!!! 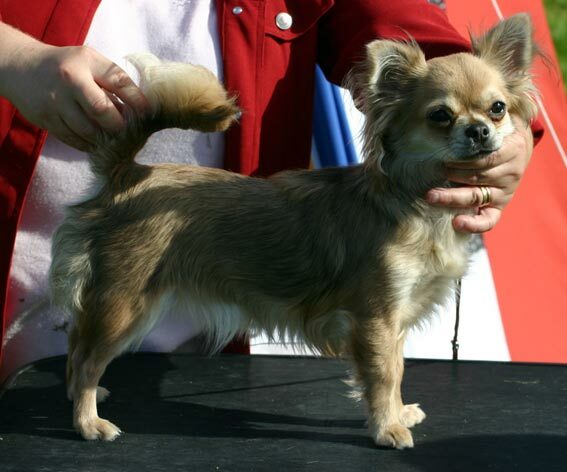 NORD NO SE FI DK CH TigerLiljas Pay Attention, Ch.class: Exc 1 CQ BF 1 CACIB & BOS!!!! TigerLiljas Light Years Ahead BOB-PUPPY! TigerLiljas Light Years Ahead BOB- & BISS 2 PUPPY!!! TigerLiljas Light Years Ahead BOB-& BOG 2 PUPPY!!! NORD NO SE FI DK CH TigerLiljas Pay Attention Ch.class:Exc2 CQ. 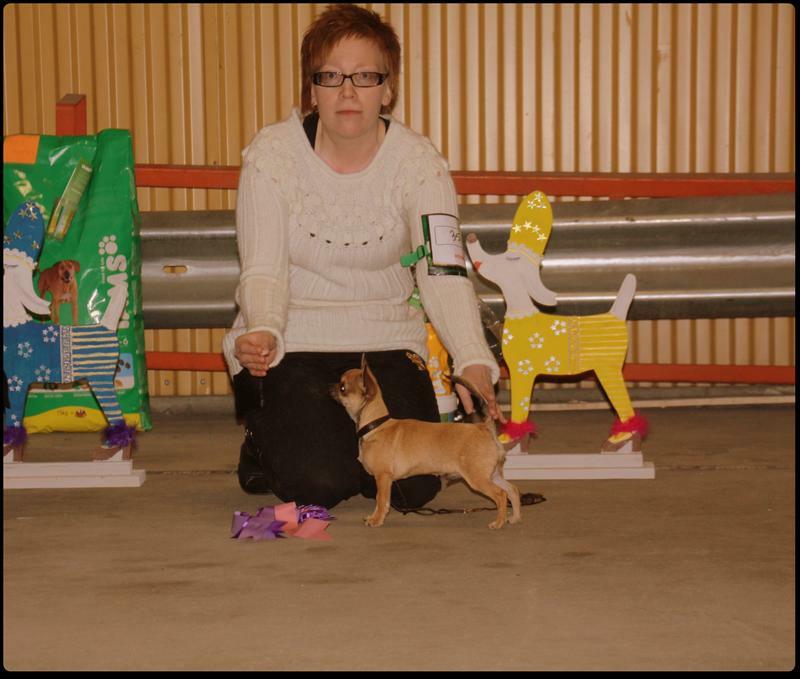 LUNA (NORD NO SE FI DK CH TigerLiljas Pay Attention) first time in Champion class EXC1 CQ BF 3. EDDIE (TigerLiljas Light Years Ahead) 2nd. 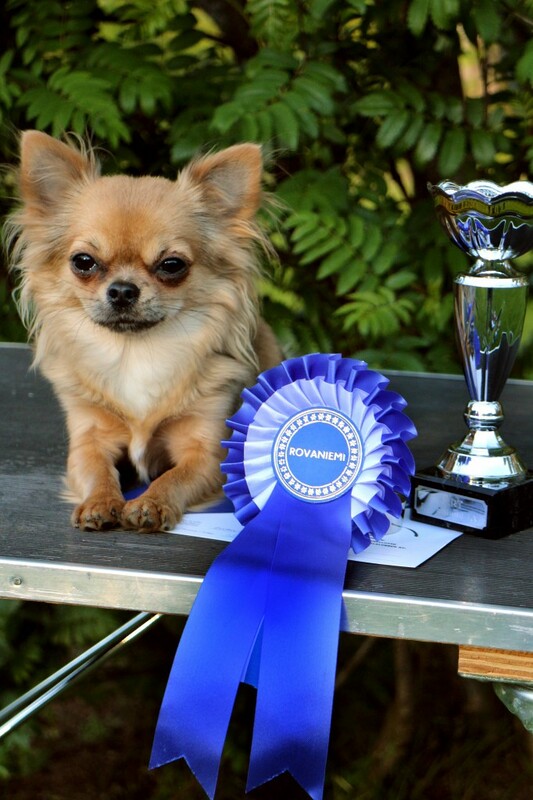 best male puppy with HP. Crazy HAPPY weekend with lot’s of happy tears!!!!! 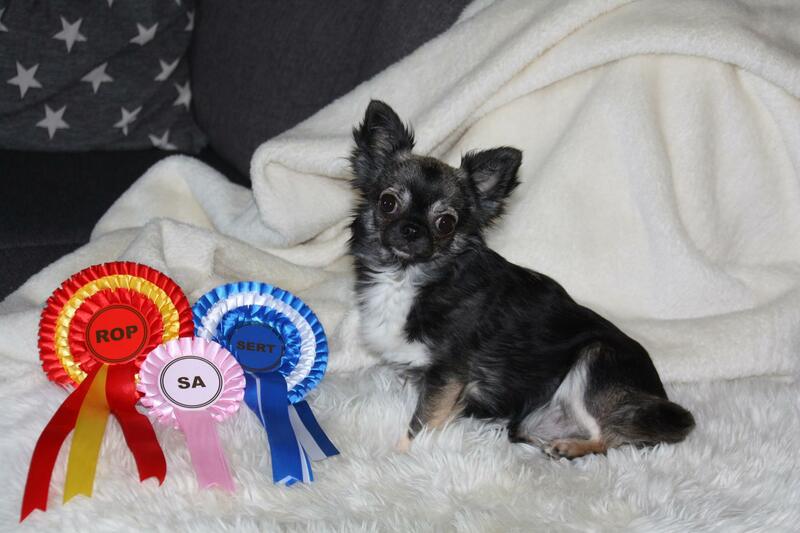 LUNA (TigerLiljas Pay Attention) NEW NORWEGIAN SWEDISH FINNISH DANISH & NORDIC CHAMPION!!!! LUNA (TigerLiljas Pay Attention) BF2 with CAC!!! Judge: Barbara Muller. 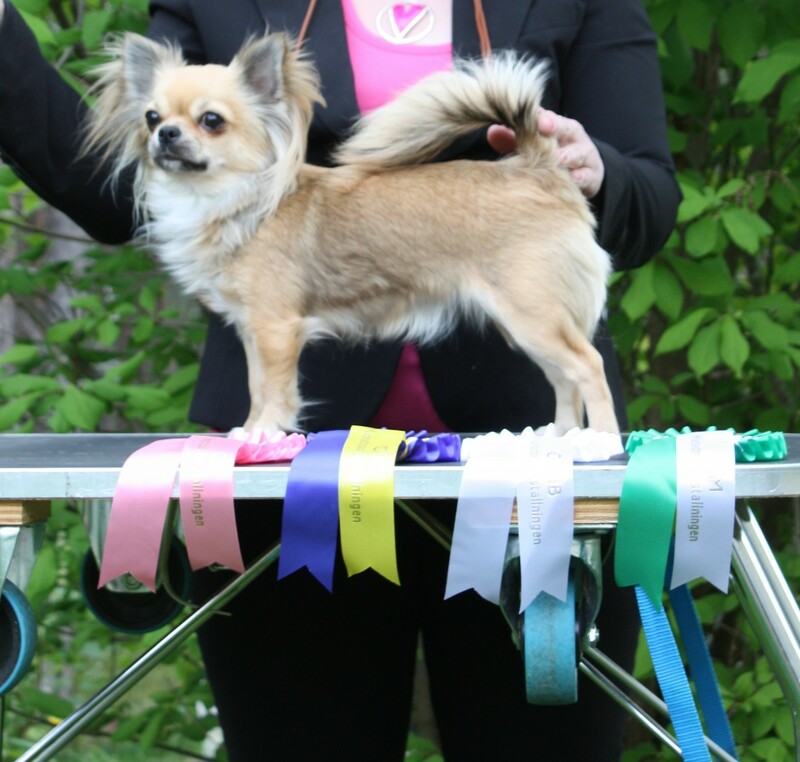 My little sweetheart ”EDDIE” (TigerLiljas Light Years Ahead) was BOS-PUPPY with a excellent critiqe. 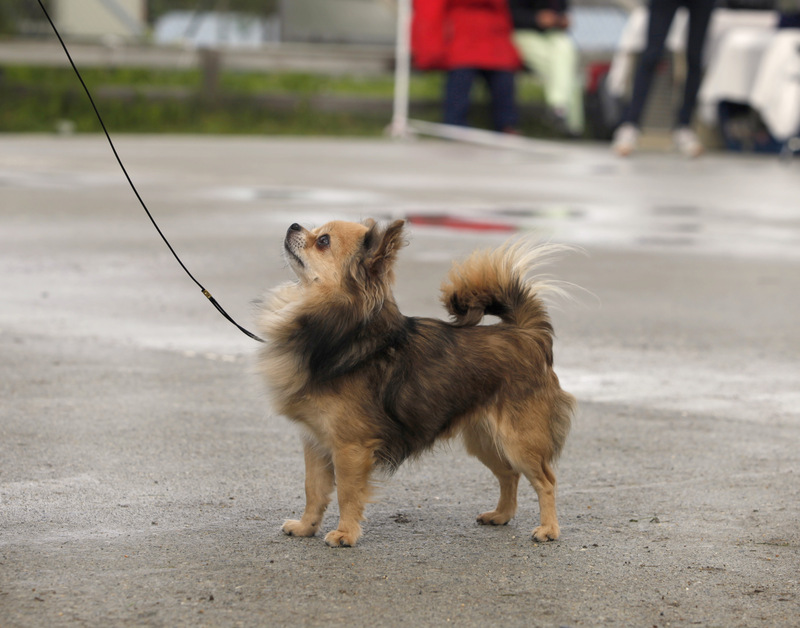 He was so happy in the ring, tail wagging and on top. 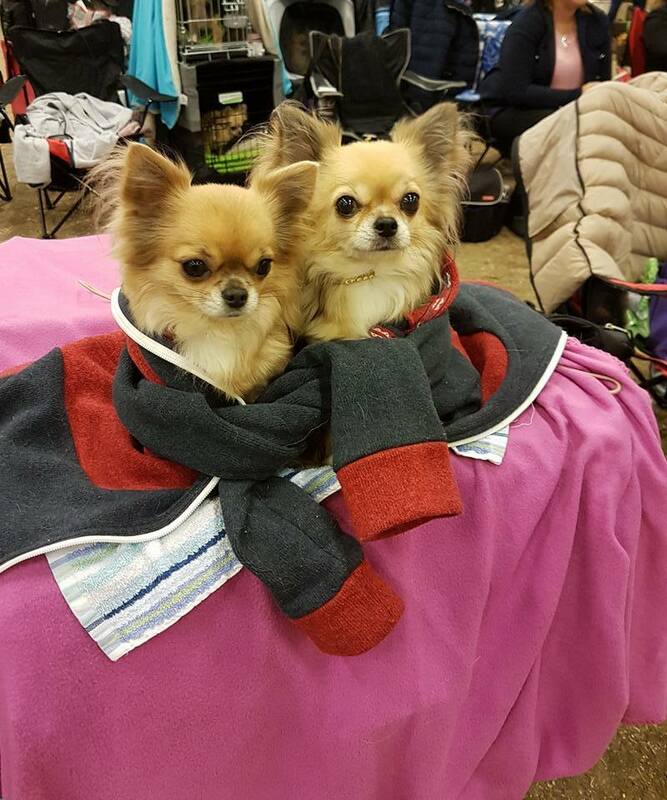 So great for ”mummy” to see :)))) ”LUNA” (TigerLiljas Pay Attention) won openclass with CQ and ended up as BF3 with R-CAC!! ..Oooohhh so close to ”getting” her champion titles. ”EDDIE” (TigerLiljas Light Years Ahead) just turned 6 month old,and had his first official premiere in the ring. 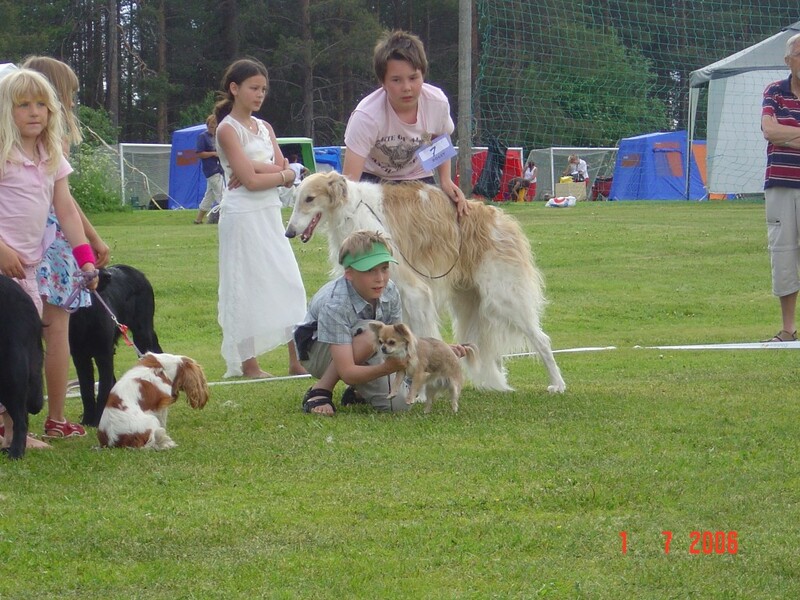 Unfortunaly he got a little bit scared of another dog and did not really show his best after that. 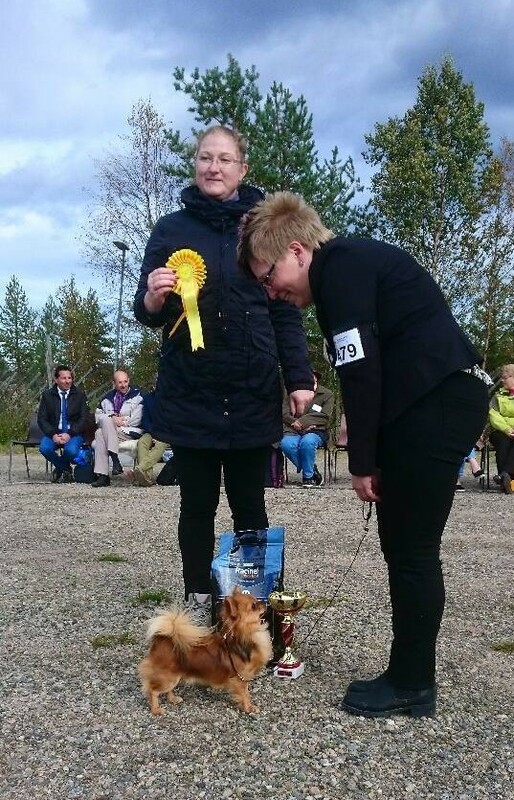 He was second best puppy with an really nice critique, but didn´t get honour price because the judge thought he needed more training. 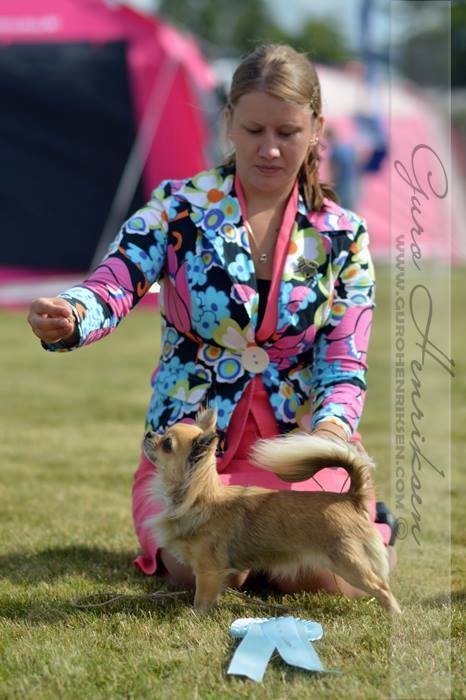 ”LUNA” (TigerLiljas Pay Attention) Exc 2 in openclass. Eddie (TigerLiljas Light Years Ahead) did great again! BOB-PUPPY (4-6 month) with excellent critiqe. 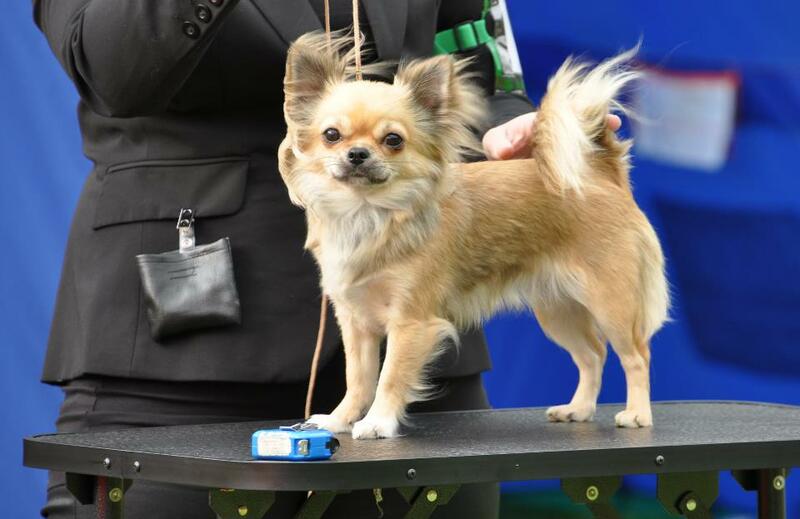 Great debut for my Little ”prince” Eddie (TigerLiljas Light Years Ahead) BOB & BISS 2- Puppy!!! 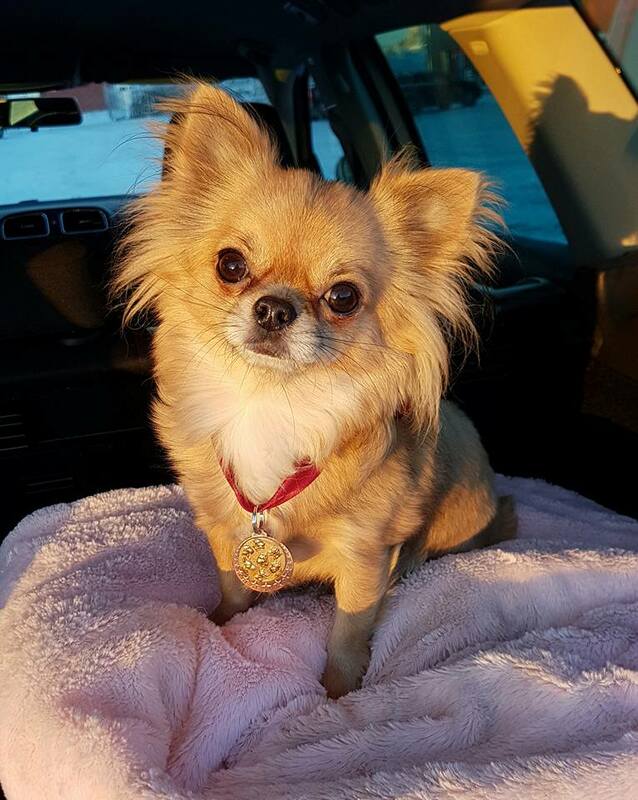 ”Luna” (TigerLiljas Pay Attention) Intermediate: Exc 1, CQ, BEST FEMALE 4. She was also nominated for Best Head competition. 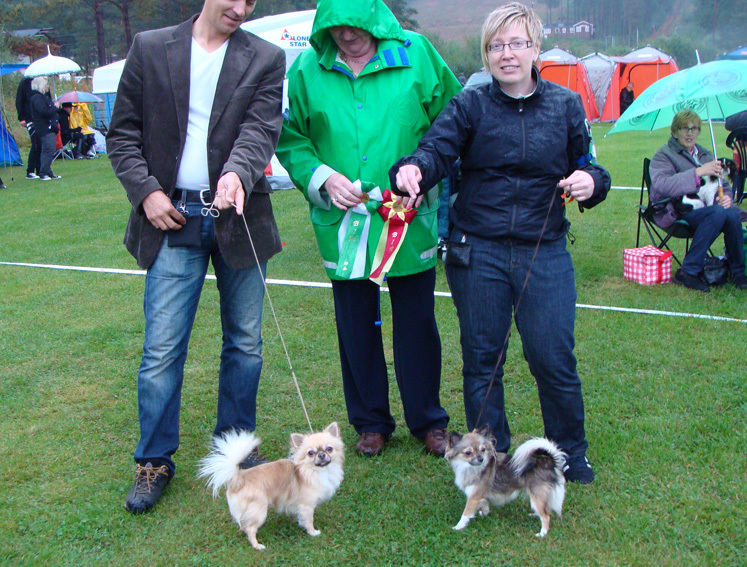 Together with ”Elvis” (Elith Oh My Godness) they were BISS4 Brace! 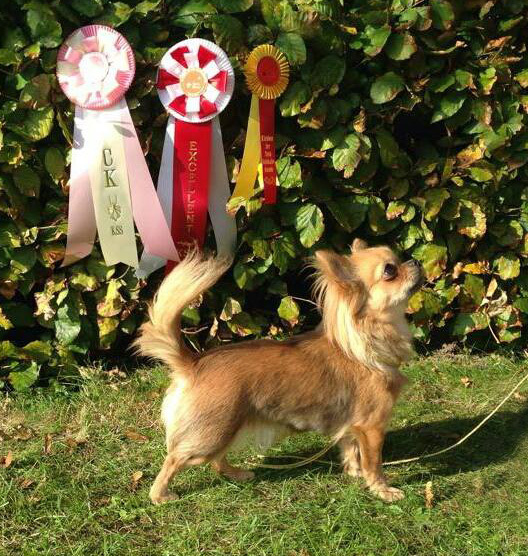 SE FI CH TigerLiljas Northern Light, Championclass: Exc 1, CQ, BF 1, BOS!!!! C.I.B NORDUCH BrändaBergets X´Clusive, Veteranclass: Exc 1, CQ, BOB-Veteran!!! 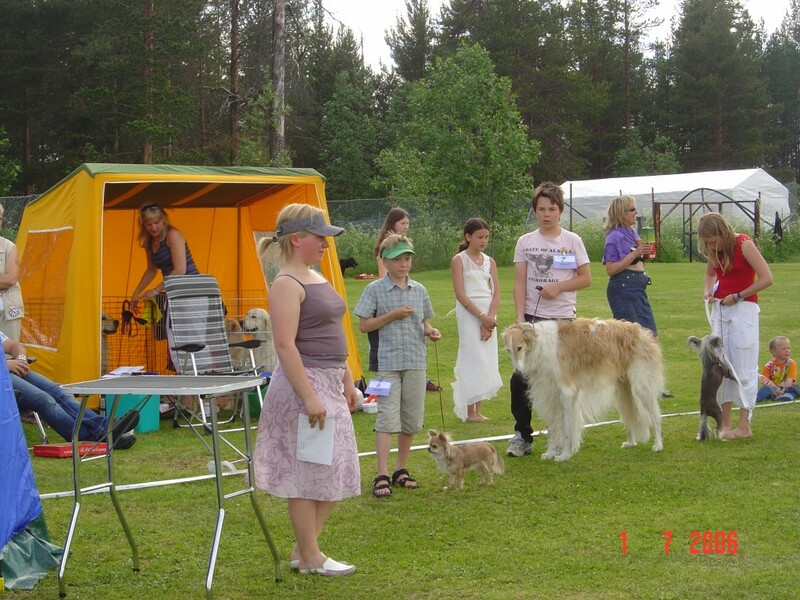 In the final, in a big competition, she was also selected to the last final seven dogs but didn´t reach a placement. 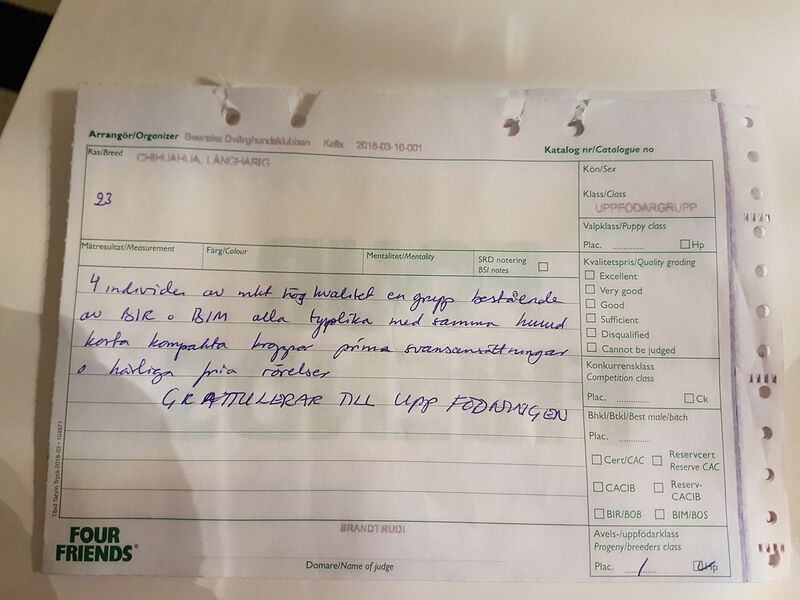 Jiiiiihoooo, I got som great news from Oslo! 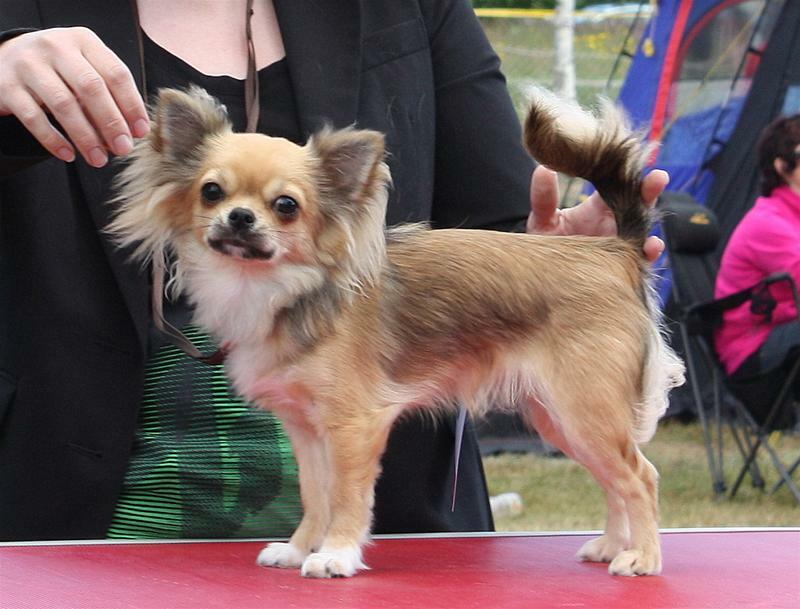 Noomi (SE FI CH TigerLiljas Northern Light) BF 3 with R-CAC! 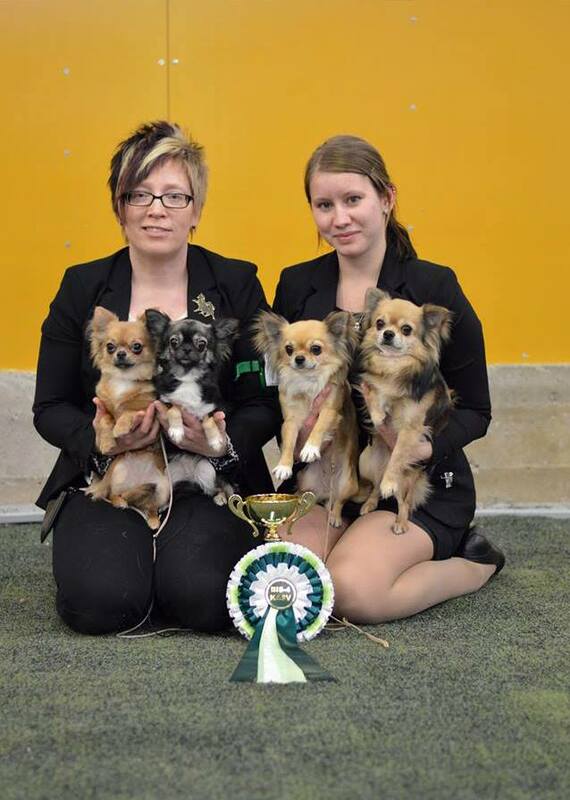 I am so soooo proud and happy breeder and owner!!!!! 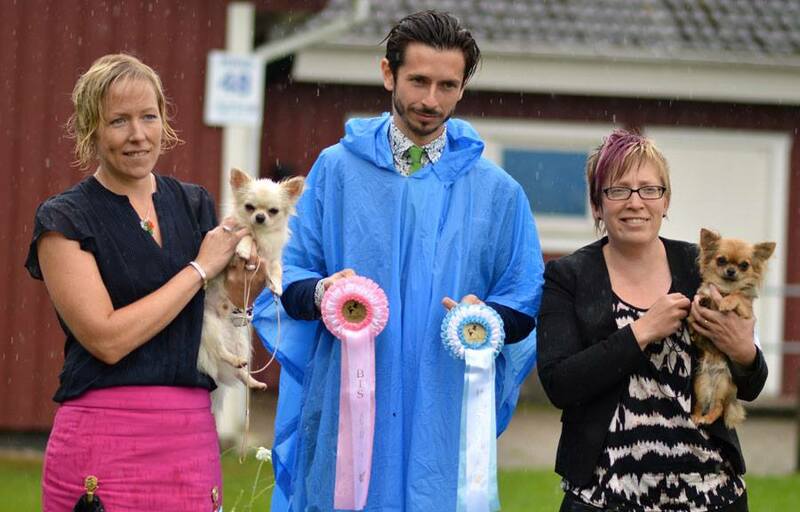 Thank you Breed Specialist Judge Samuel Carlid, Sweden. TigerLiljas Pay Attention, Juniorclass: Exc 1, CQ in a very big class. BOS-Junior & BISS 2 Junior!!! TigerLiljas Pay Attention Juniorclass: Exc 1 CQ BF 3 R-CAC!! 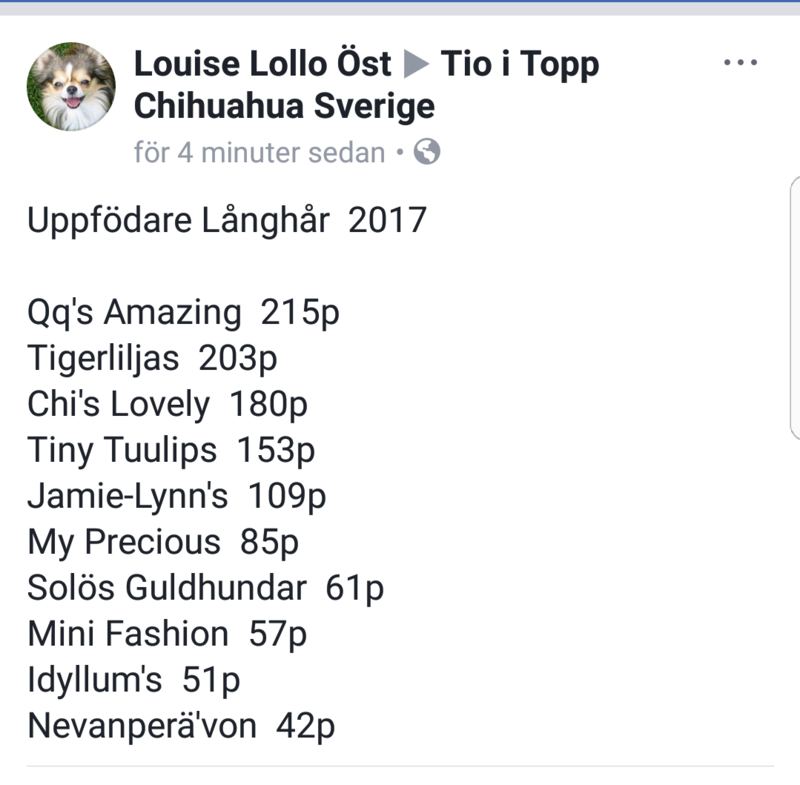 SEUCH FIUCH TigerLiljas Northern Light CHclass: Exc 1 CQ BF 1 CACIB and BOS!!! C.I.B NORDUCH BrändaBergets X’Clusive Veteranclass: Exc 1 CQ (BF 5) BOB-VETERAN!!! TigerLiljas Pay Attention 1 BEST FEMALE CAC & BOS!!! BOB-Junior!!! 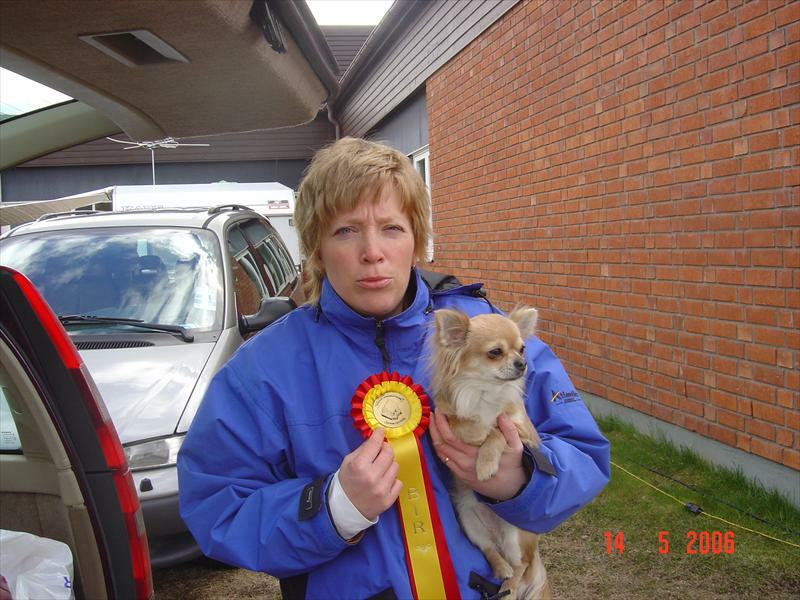 C.I.B NORDUCH BrändaBergets X´Clusive 4 BEST FEMALE BOB-VETERAN & BISS 3-VETERAN!!! 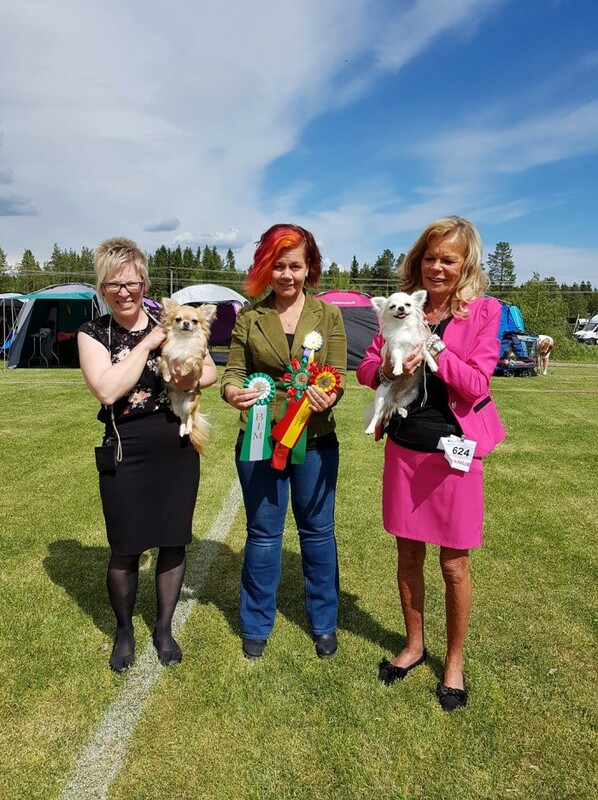 After our successful day at Gällivare Int. (28/6-2014) we went on the journey towards Svolvaer Nat, Norway (29/6-2014). I showed Luna (TigerLiljas Pay Attention) and she almost did it again .. she ended up as BF 2 with R-CAC!!! TigerLiljas Pay Attention, Juniorclass: Exc 1, CQ, BF 1, CAC & BOS!!!! 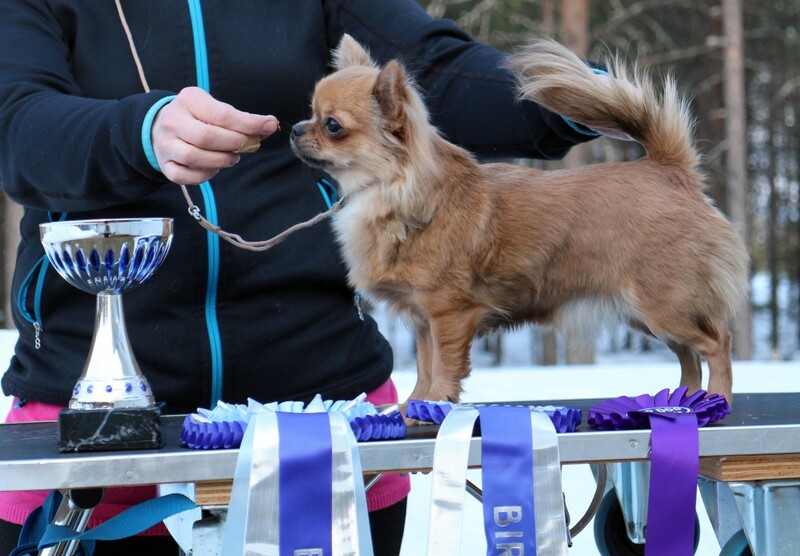 SEUCH (*FI UCH, not confirmed) TigerLiljas Northern Light, Championclass: Exc 1, CQ, BF 2 , CACIB!!! 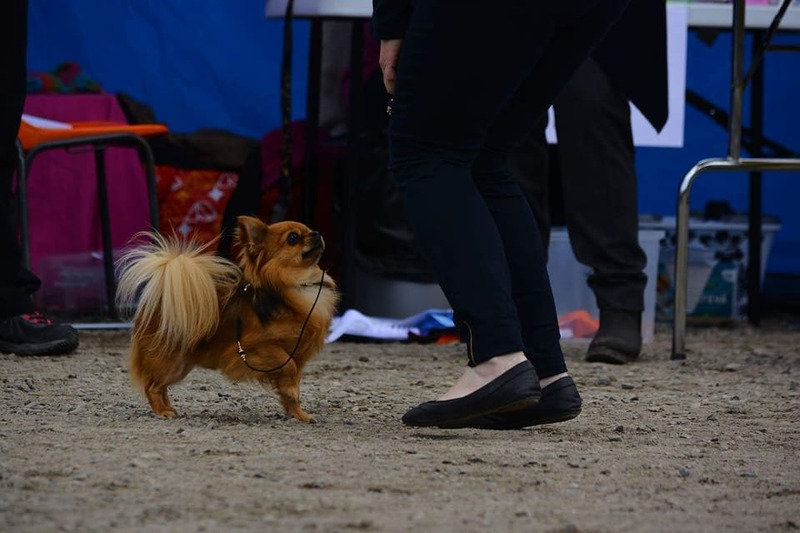 SE & NO CH TigerLiljas Thunder And Lightning, Championclass: Exc 1, CQ, BM 1, CAC & BOS!!! 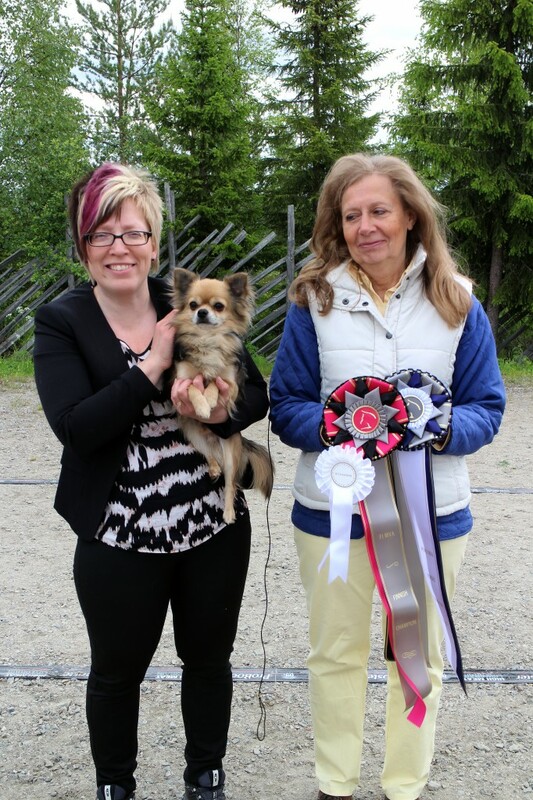 NEW FINNISH & NORDIC CHAMPION!!!! TigerLiljas Pay Attention, Juniorclass: Exc 1, CQ, BF 3 with CAC!!!! Luna (TigerLiljas Pay Attention) BF 3 with CAC!!!! 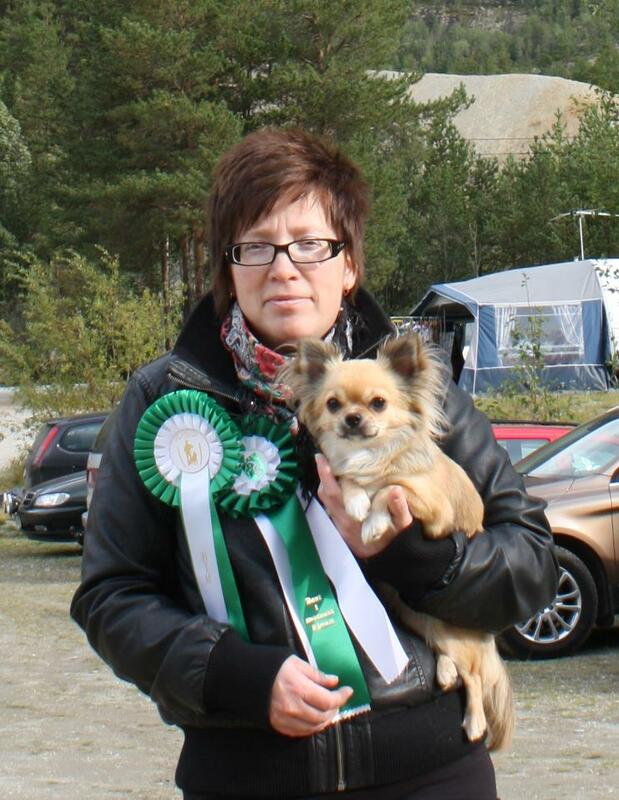 Handler today was Sandra Engström, Thank you for great results with my little girl. C.I.B NORDUCH BrändaBergets X´Clusive, Veteranclass: Exc 1, CQ, BOB-VETERAN!!!! 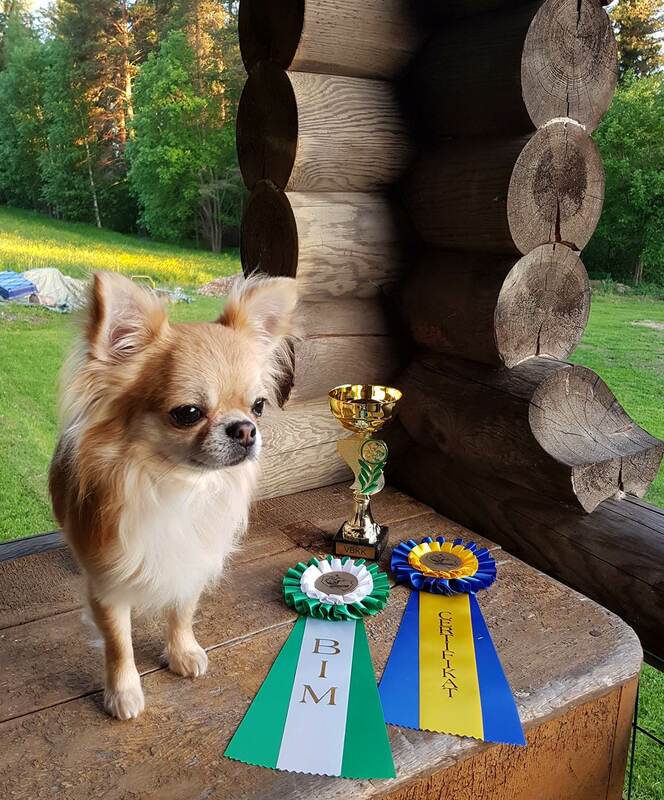 BF 1 CAC BOB & NEW SWEDISH & FINNISH CHAMPION!!!! C.I.B NORDUCH BrändaBergets X´Clusive, BOB-Veteran!!! 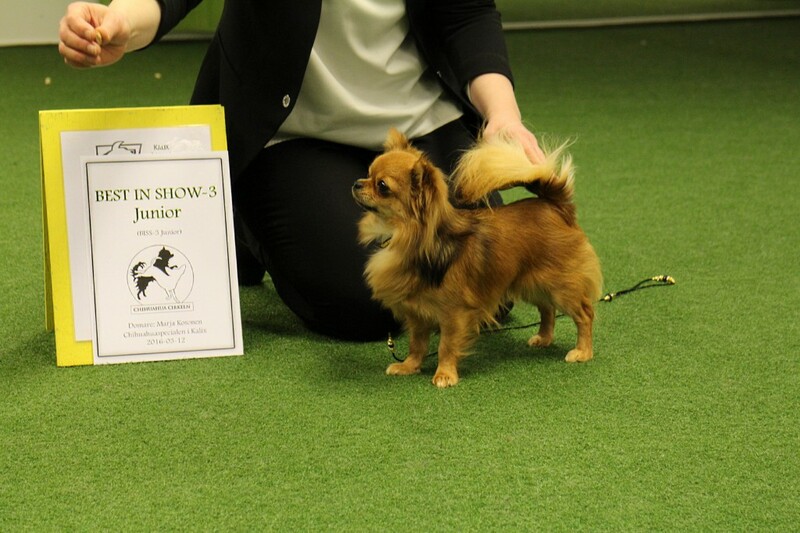 TigerLiljas Pay Attention, BEST OF BREED from juniorclass with CAC!!! She also became BOB-junior! 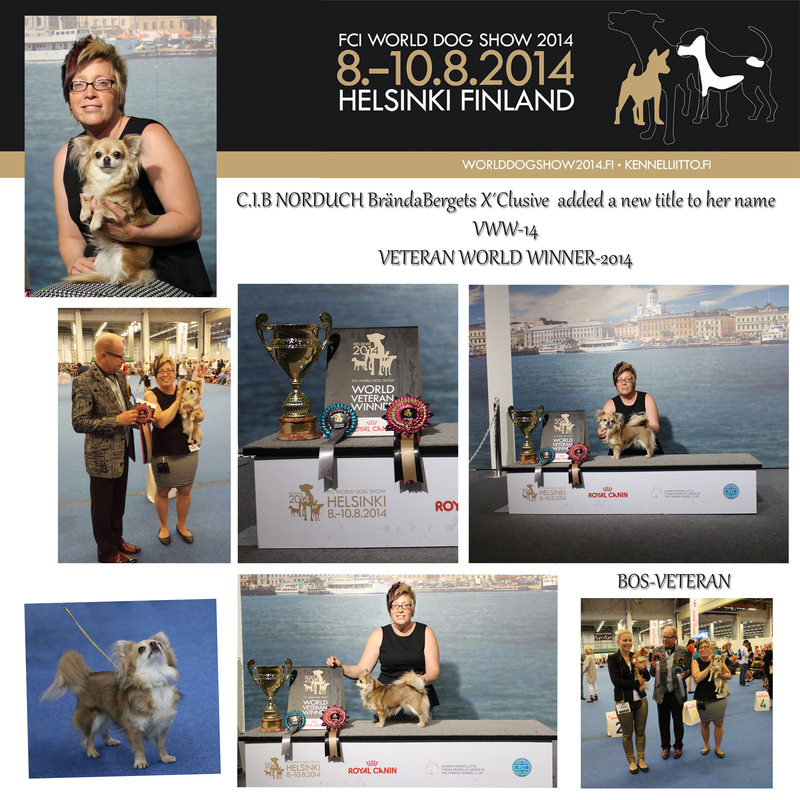 C.I.B NORDUCH Brända Bergets X´Clusive, Veteranclass: Exc 1, CQ, BF 3 and BOB-Veteran!!! 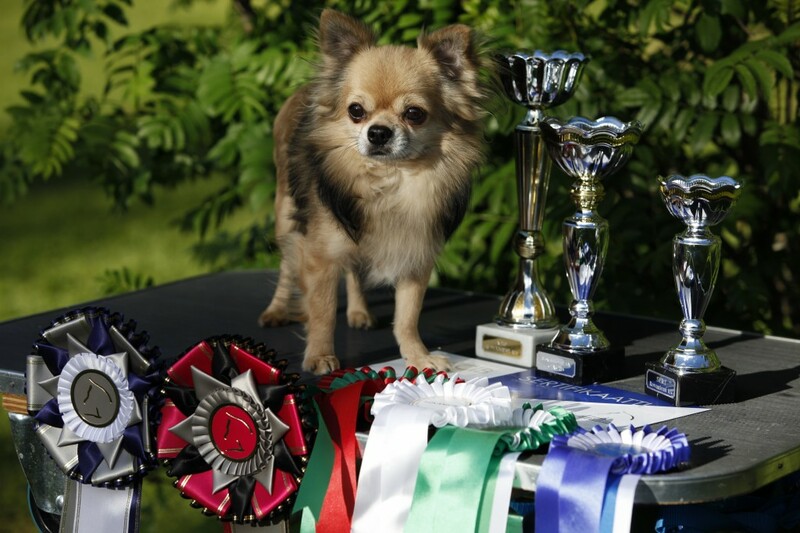 TigerLiljas Pay Attention, BEST OF BREED!!! 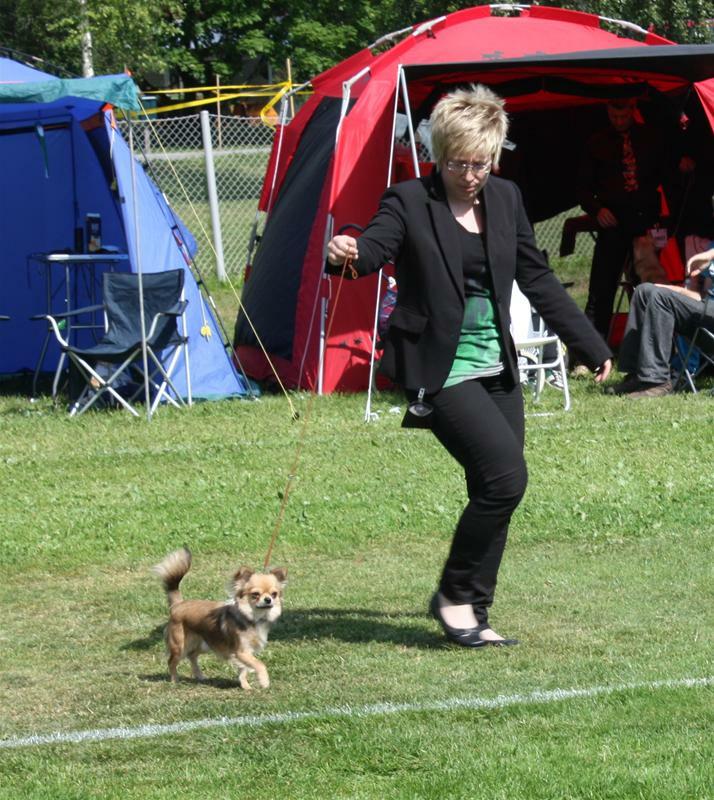 Mum Noomi comes as company and cheer on her today. 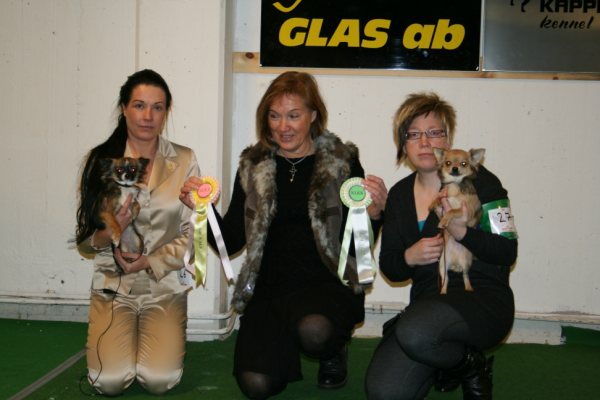 TigerLiljas Northern Light, Openclass: Exc 1, CQ, BF 2 with R-CAC!!! 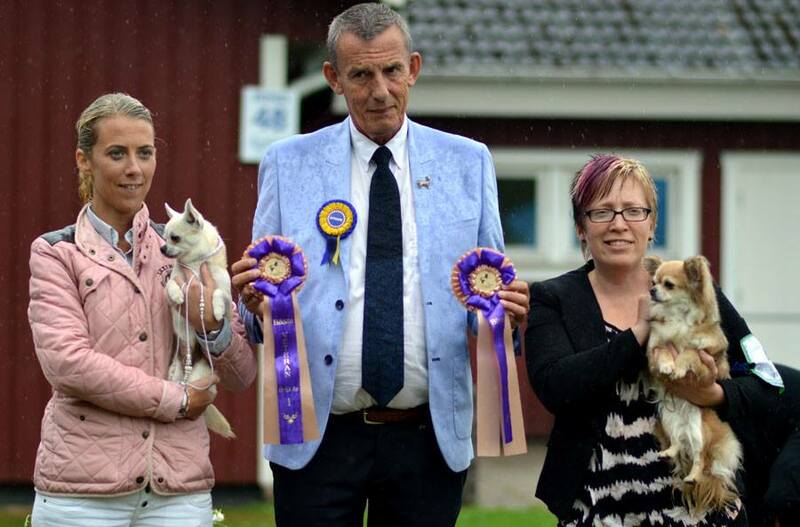 C.I.B NORD UCH BrändaBergets X´Clusive, Veteranclass: Exc 1, CQ, BOB- veteran and BIS-2 Veteran!!!! 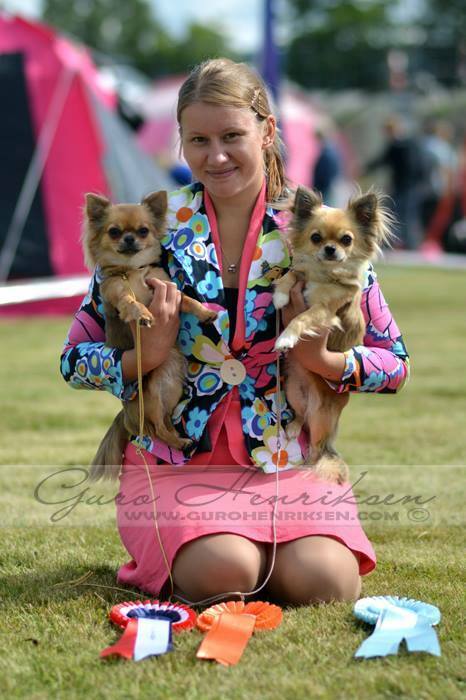 Siblings Noomi (T. Northern Light) and Gibson (CH T. Thunder And Lightning) was also BIS-Brace!!! 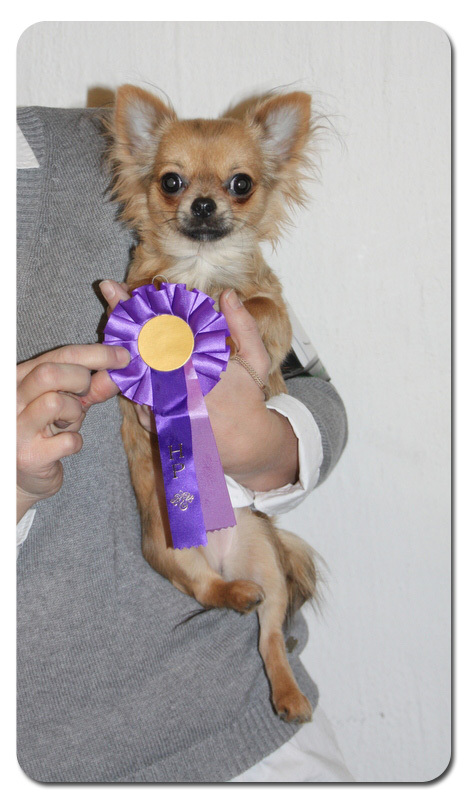 SE NO CH TigerLiljas Thunder And Lightning, Championclass: Exc 2, CQ, BM 3 with R-CAC. 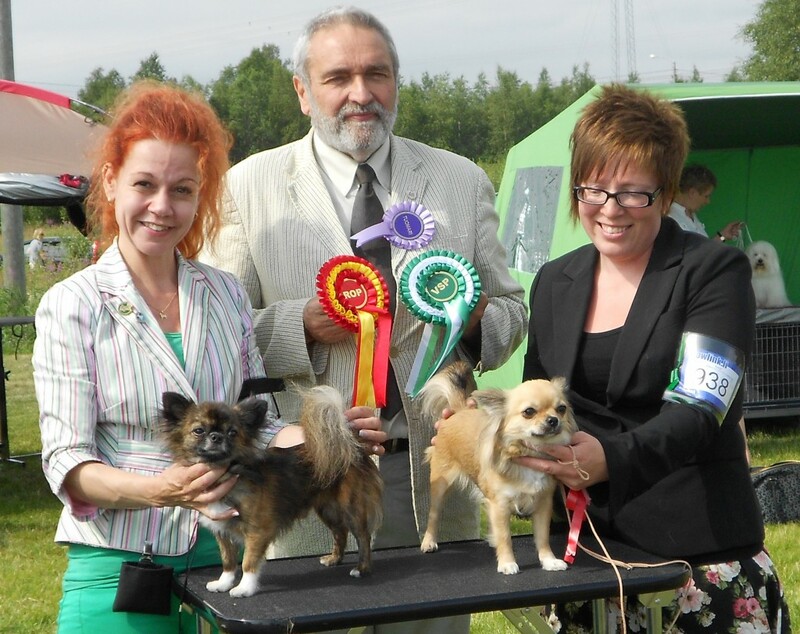 TigerLiljas breeding group 16/2-2014 in Pello BIS-4, my first group of 3 combinations! T.Thunder And Lightning, T.Northern Light, T.Light Breeze Blowing, T.Pay Attention. 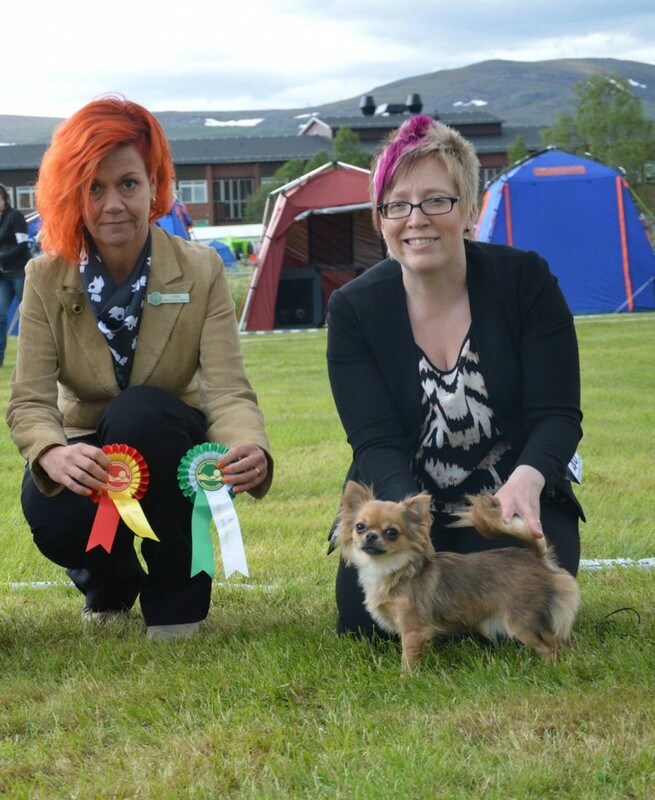 Great results for my Noomi (TigerLiljas Northern Light) at My Dog 2014. Huge thanks to Noomi´s handler Sandra Engström , you and Noomi made a brilliant performance together! BrändaBergets X´Clusive BOB, BOB-veteran, BIS-2 veteran and finally BOG-3 !!! #NR 1 MOST WINNING LC- VETERAN IN SWEDEN 2013!!! TigerLiljas Pay Attention “Luna” BOB-puppie!!! C.I.B NORDUCH BrändaBergets X´Clusive BOB, BOB-Veteran & BISS 4-Veteran!!!! C.I.B NORDUCH BrändaBergets X´Clusive BOB-Veteran! 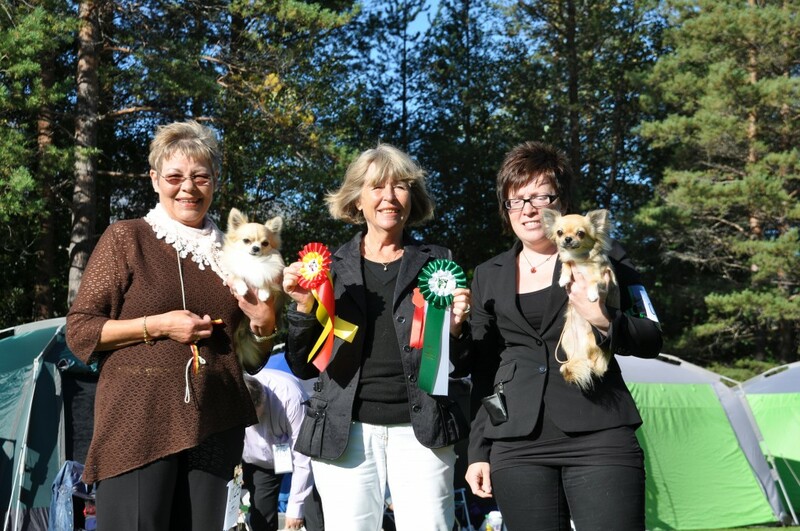 NEW SWEDISH AND NORWEGIAN CHAMPION! I´m soooooo happy!!! 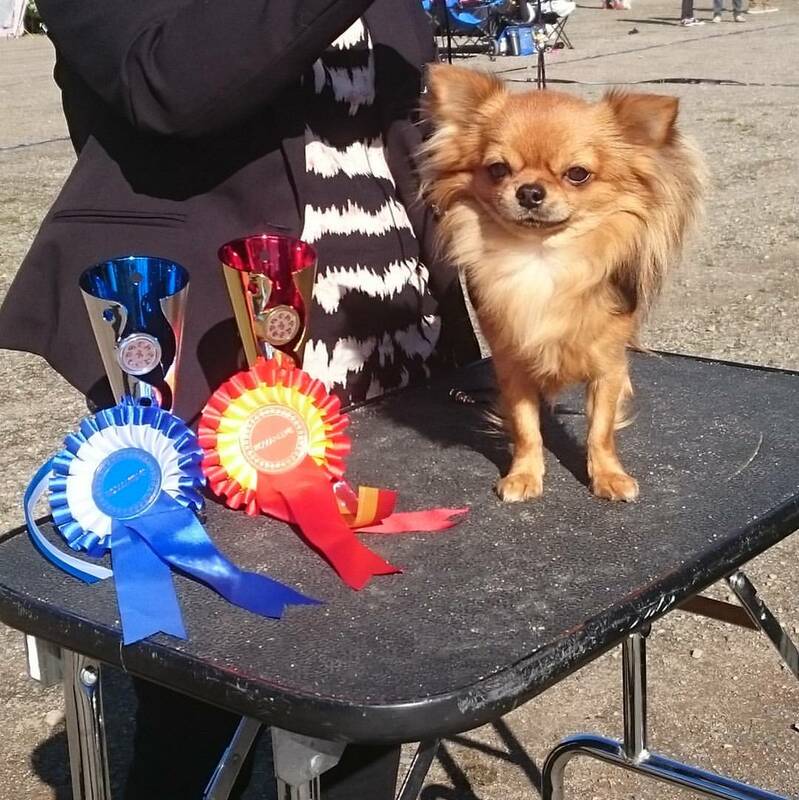 Yesterday our Gibson (TigerLiljas Thunder and Lightning) became Swedish and Norwegian Champion!!!! 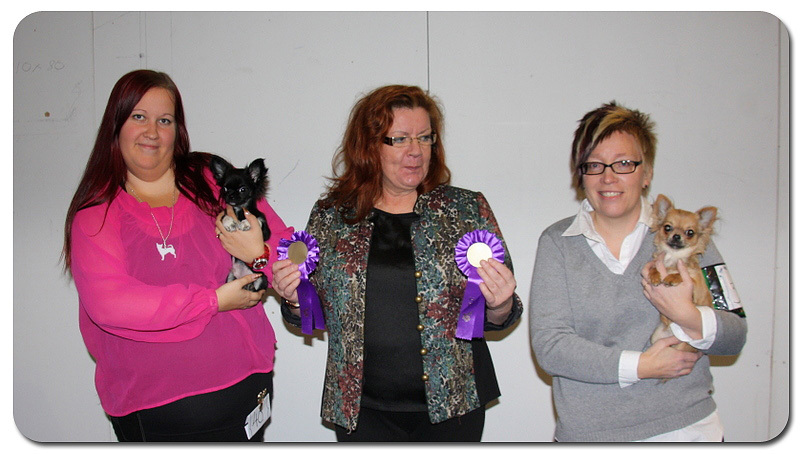 Gibson was BM 1, with CAC & CACIB and new CHAMPION! Lykke (TigerLiljas Light Breeze Blowing) Intermediate class: Exc1, CQ. (She ended up as BF 5). 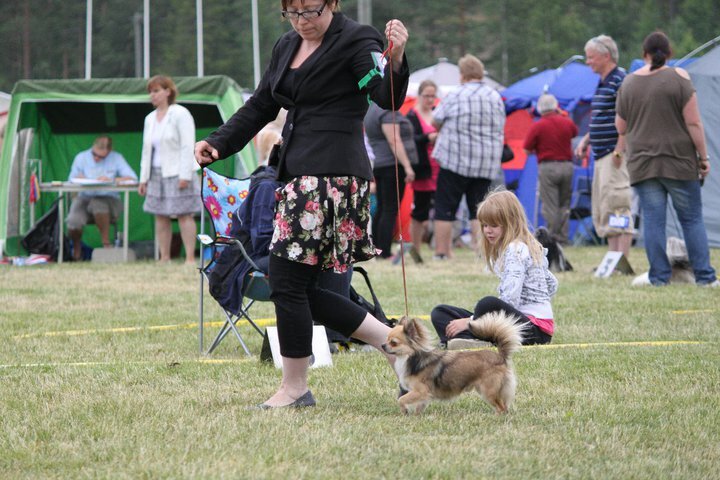 Noomi (TigerLiljas Northern Light) Openclass: Exc 3, CQ. 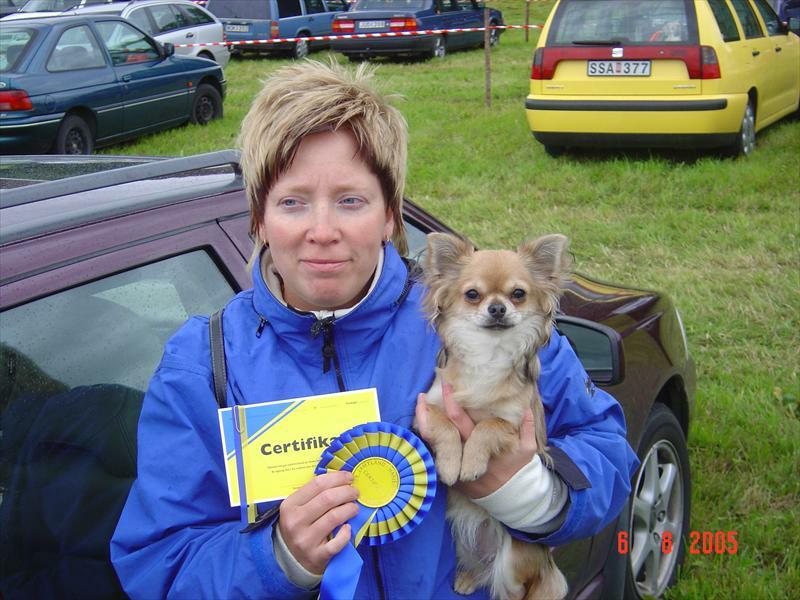 Big thank´s to judge Anne-Mari Haugsten! 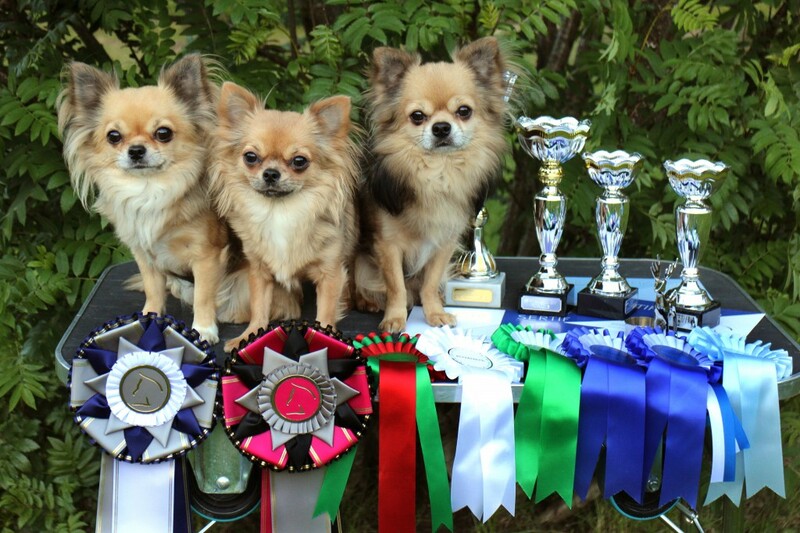 Gibson (TigerLiljas Thunder And Lightning) BOB and CAC, Lykke (TigerLiljas Light Breeze Blowing) BOS & CAC!!!! Luna (TigerLiljas Pay Attention) BOS-puppie again! 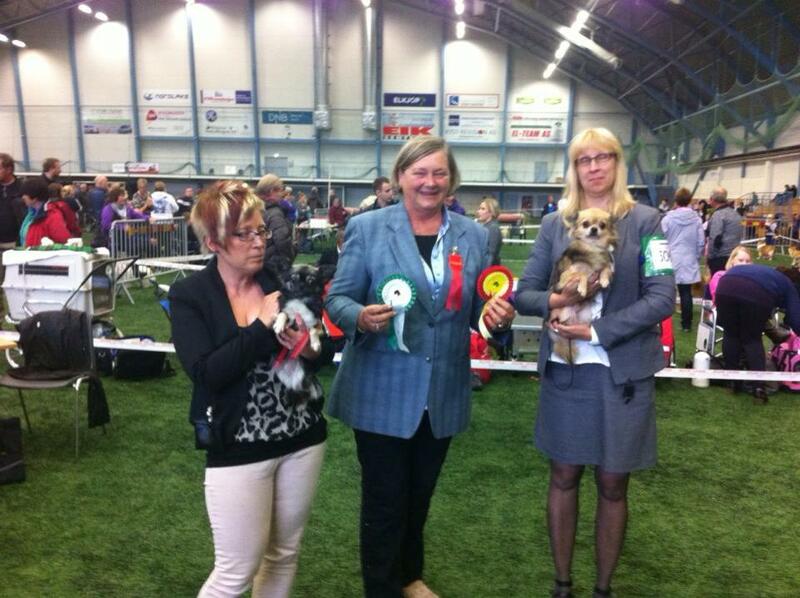 Great show results for our ”Lykke”( TigerLiljas Light Breeze Blowing), BOB & CAC under judge Tuula Savolainen!!! In the final, in a big competition, she was also selected to the last final six but didn´t reach a placement and ended up as number five. Small Is Beautiful´s Red Bedroom, Intermediateclass: Exc 1, CQ, BM 2 with R-CAC!!! 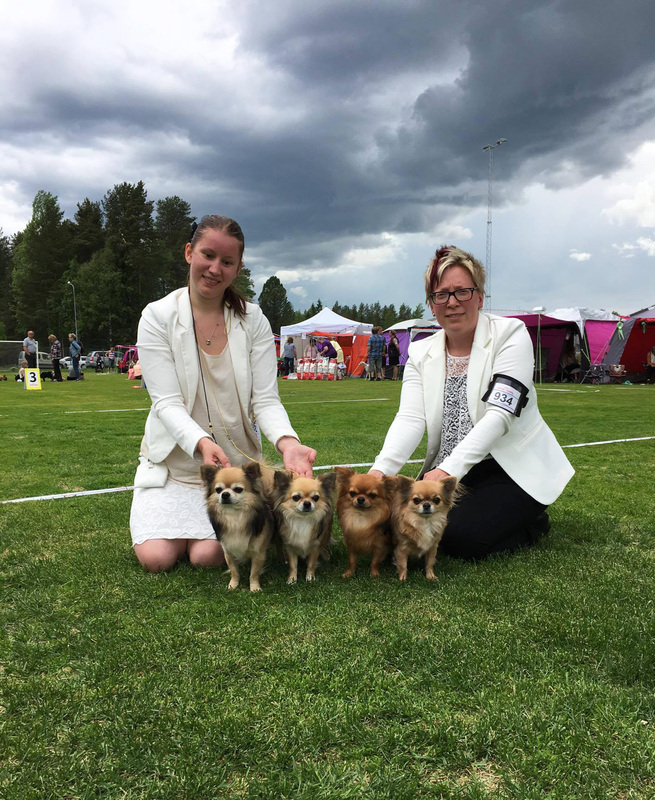 TigerLiljas Thunder and Lightning, Openclass: Exc 1, CQ, BM 2 with R-CAC! 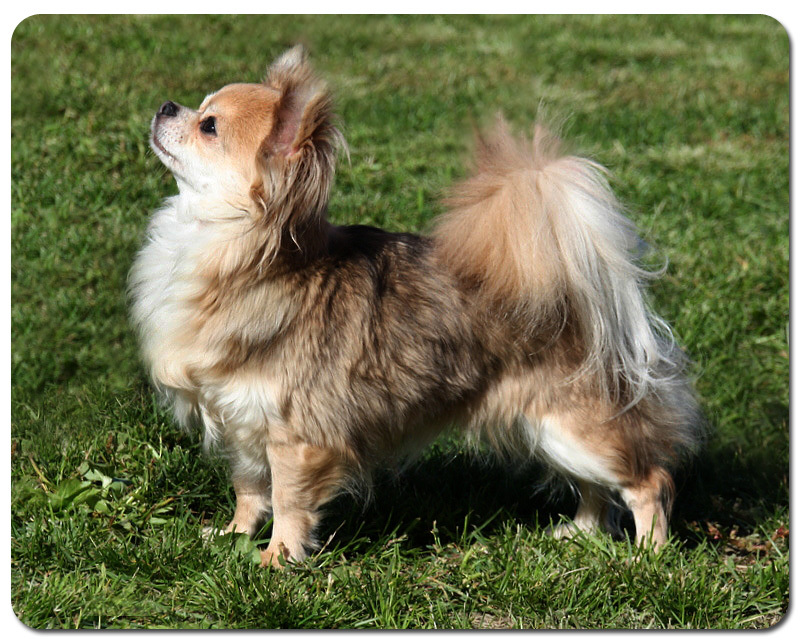 TigerLiljas Light Breeze Blowing, Intermediate class: Exc 1, CQ, BF 2 with R-CAC!!! 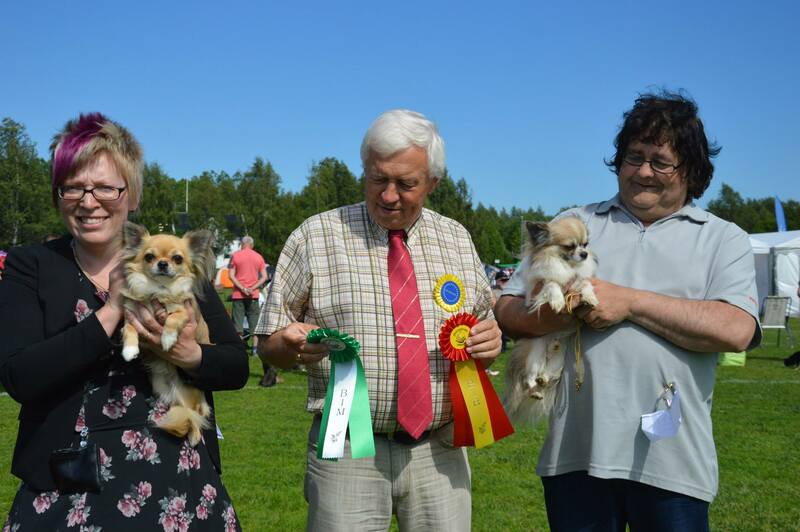 C.I.B NORD UCH BrändaBergets X´Clusive, Veteranclass: Exc 1, CQ, BOB-Veteran!!! 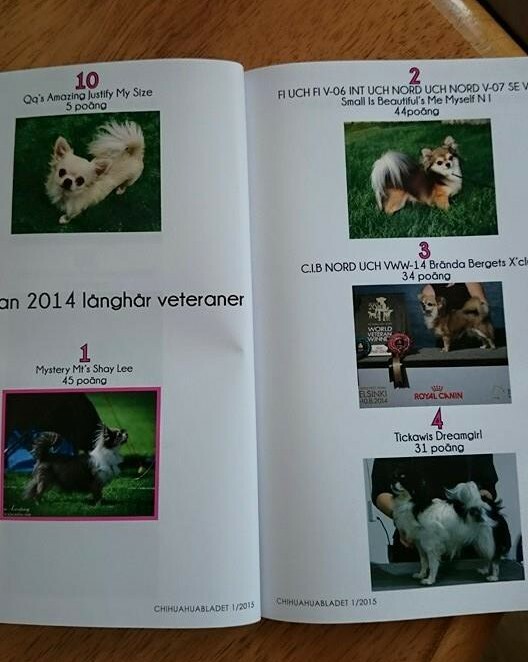 C.I.B NORD UCH BrändaBergets X´Clusive, Veteranclass: Exc 1, CQ, BF 4, BOB-Veteran!!! 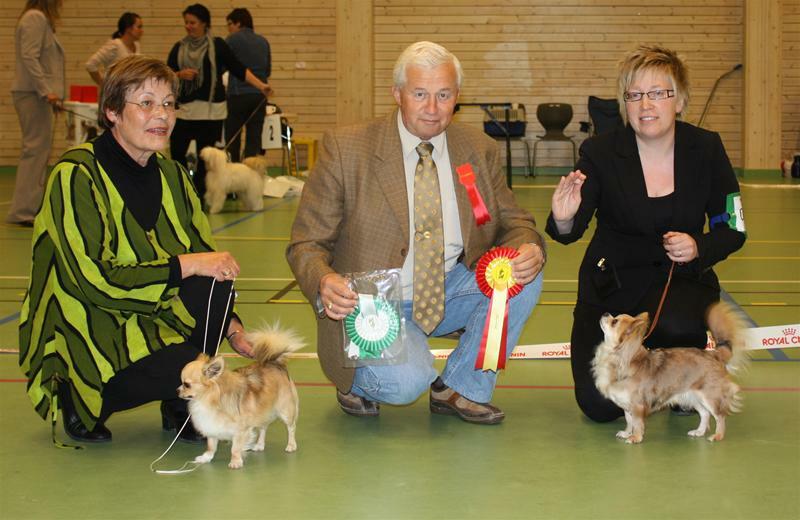 C.I.B NORD UCH BrändaBergets X´Clusive, Veteranclass: Exc 1, CQ, BOB-Veteran! Small Is Beautiful´s Red Bedroom, Intermediateclass: Exc 1,CQ, BM 4 with R-Cacib! 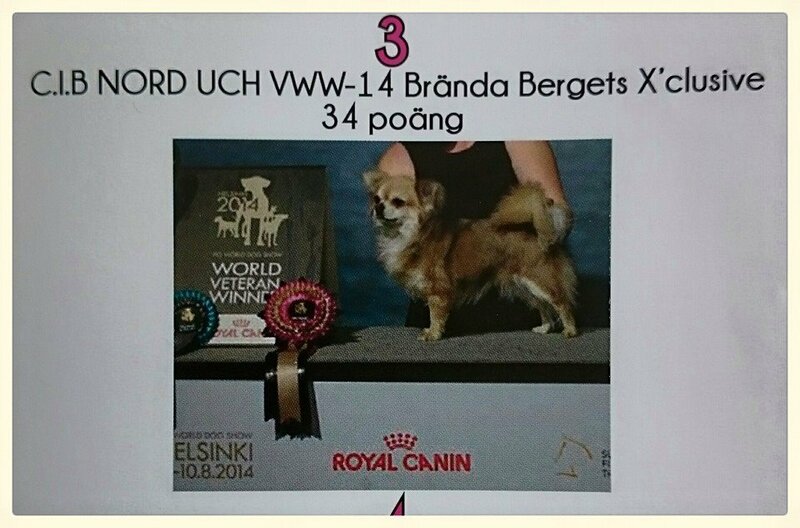 C.I.B NORD UCH BrändaBergets X´Clusive, Veteranclass: Exc 1, CQ, BF 1, BOB!!! 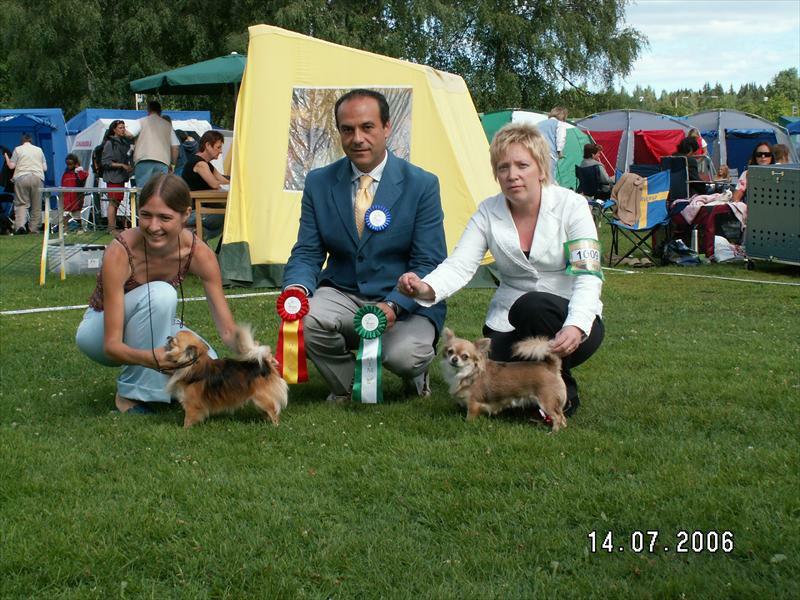 TigerLiljas Thunder And Lightning, Openclass: Exc 1, CQ, BM 1 with CAC & Cacib, BOB!!!! 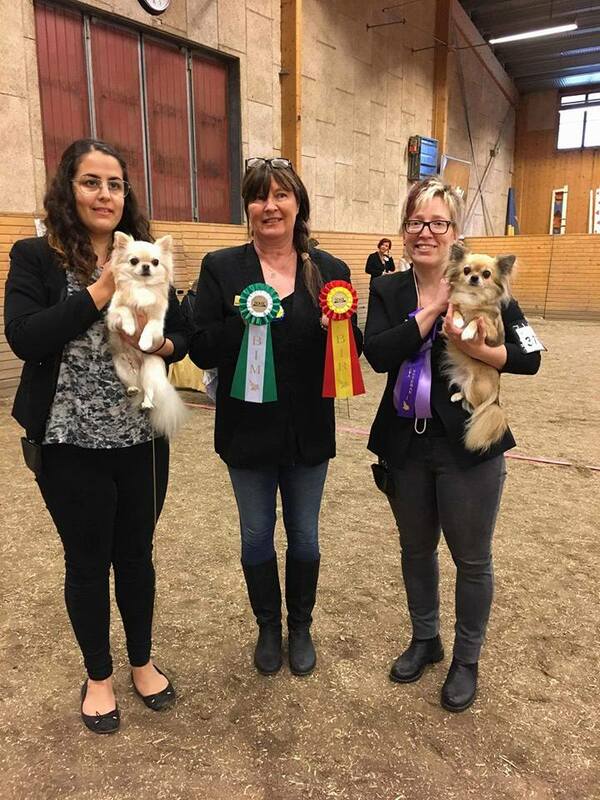 C.I.B NORD UCH BrändaBergets X´Clusive, Veteranclass: Exc 1, CQ, BF 1, BOS!!! Small Is Beautiful´s Red Bedroom, Juniorclass: Exc 1, CQ, BOB-Junior & BISS 3- Junior!!! 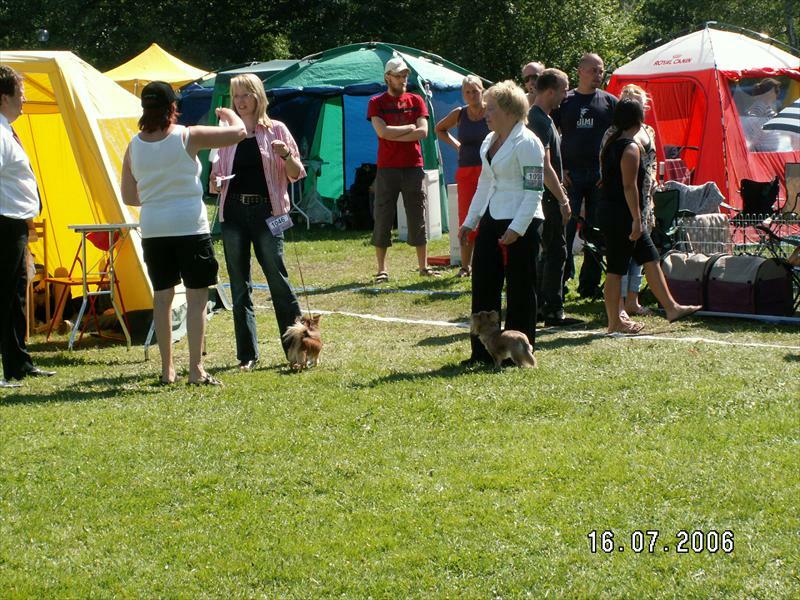 TigerLiljas Thunder And Lightning, Openclass: Exc 1, CQ, BM 1, CAC , BOB!!! TigerLiljas Northern Light, Openclass: Exc1, CQ, BF1, CERT & BOS!!!! Small Is Beautiful´s Red Bedroom, BOB-puppie, BIS 3- puppie!!! 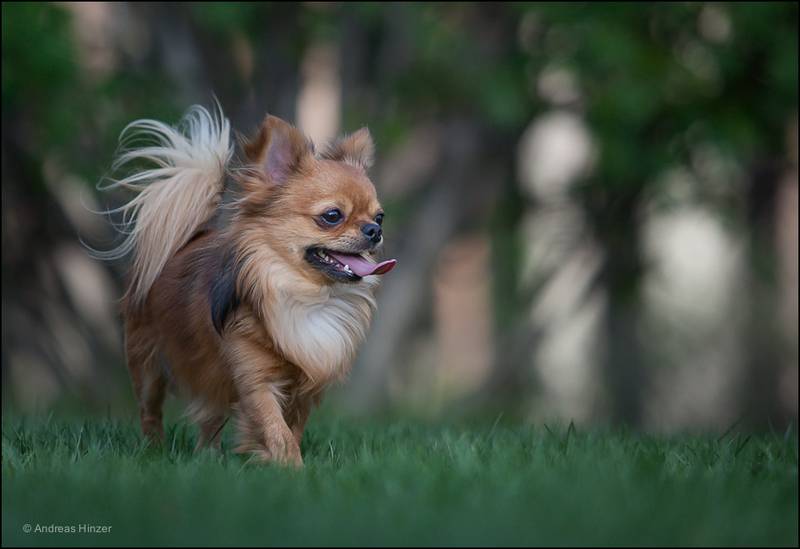 TigerLiljas Light Breeze Blowing, BOB-puppie!!! 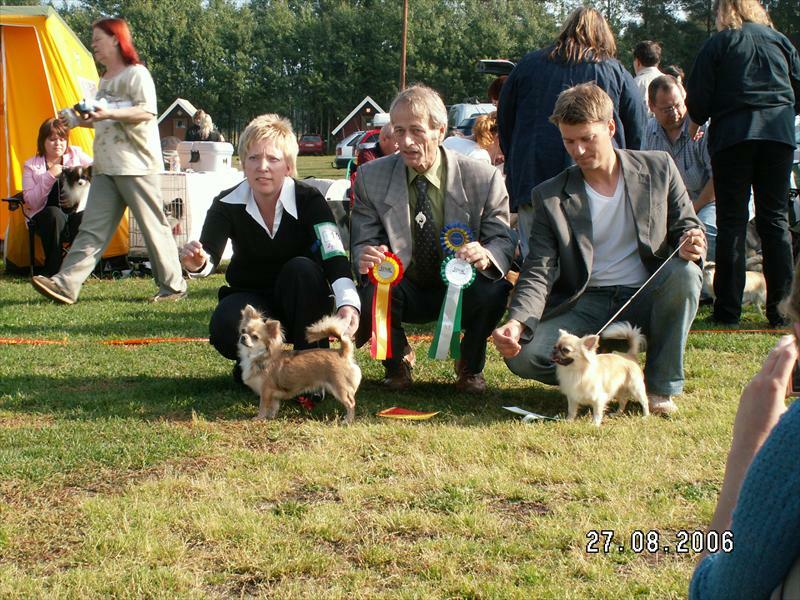 TigerLiljas Thunder And Lightning, Openclass: Exc 1, CQ, BM 1 with CAC, BOB!!!! Small Is Beautiful´s Red Bedroom, BOB-puppie!!! Small Is Beautiful´s Red Bedroom BOB-puppie!!! Small Is Beautiful´s Red Bedroom, BOS-puppie!!! SmallIs Beautiful´s Red Bedroom , BOB-puppie!!! Small Is Beautiful´s Red Bedroom , BOB-puppie!!! 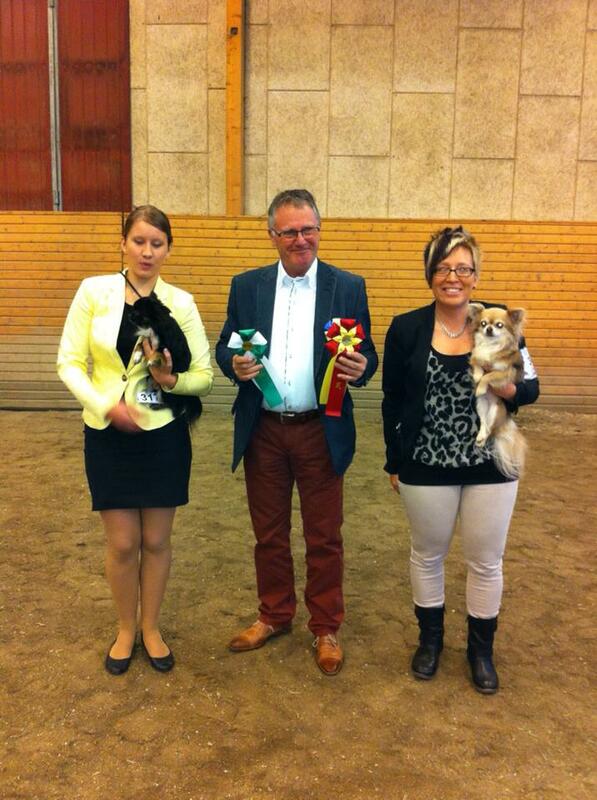 Succesful debut show for Milo (Small Is Beautiful´s Red Bedroom) BOB-puppie & BIS 3-puppie!!! 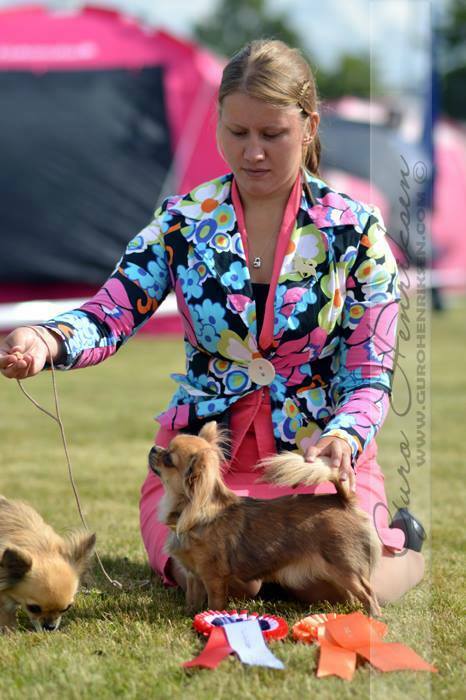 TigerLiljas Northern Light, Openclass: Exc 1, CQ, BF 3 with CAC!!!! 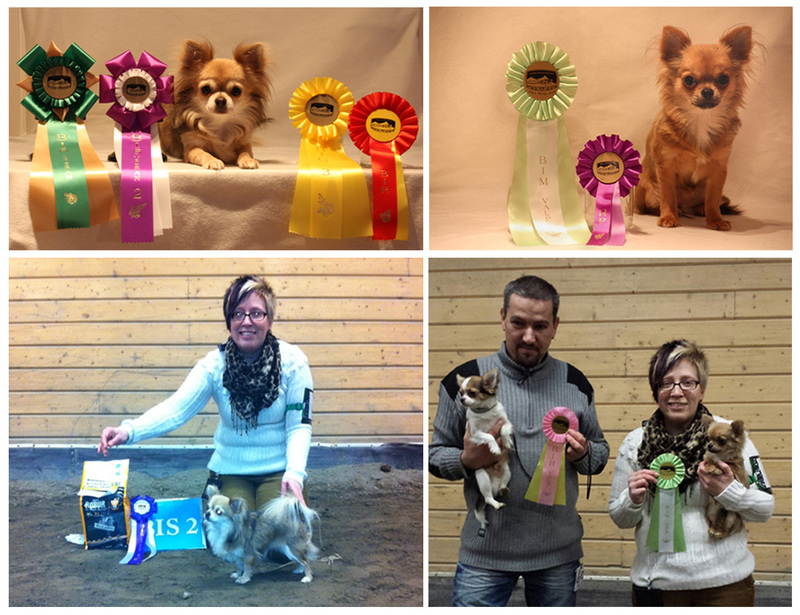 TigerLiljas Northern Light, Openclass: Exc 1, CQ, BF 1, CAC & BOS!! 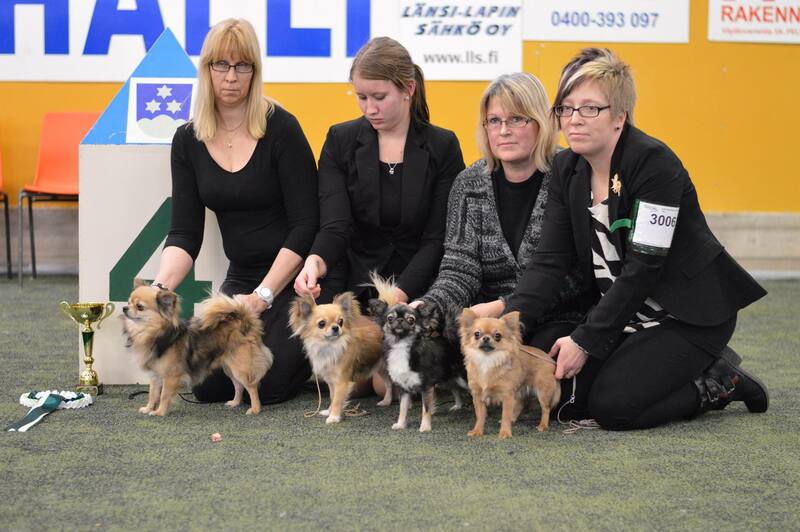 TigerLiljas Northern Light, Openclass: Exc 1, CQ, BF 1, CAC & BOS!!! This weekend was more than good! Noomi was 2 x BOS and got 2 x CAC!!!!! TigerLiljas Northern Light, Openclass: Exc 1, CQ, BF 1, CAC & Cacib, BOS!!! TigerLiljas Northern Light, Openclass: Exc 1, CQ, BF 1,CAC & Cacib , BOS!!! 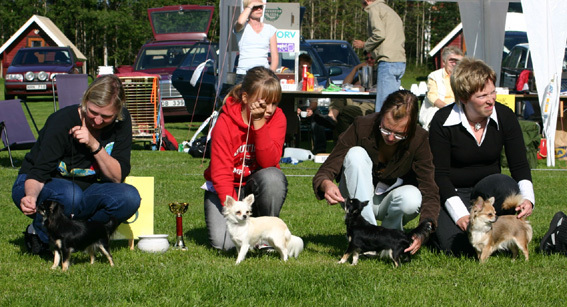 SE FI NO NORD UCH BrändaBergets X´Clusive, Championclass: 1;1 CQ, BF 1, BOS & Cacib!!! 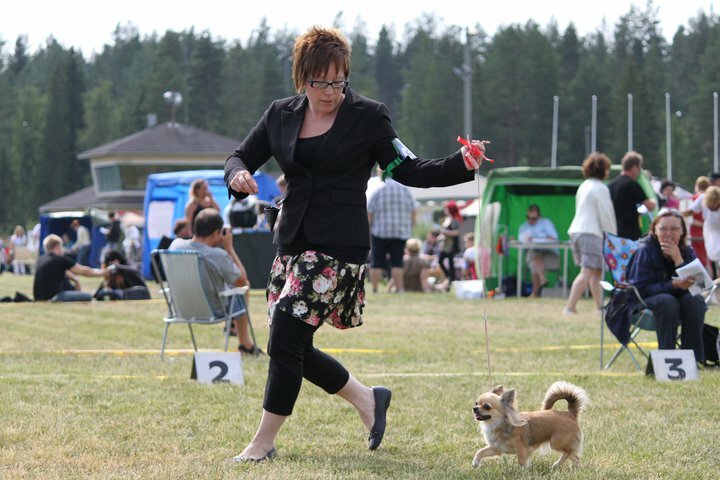 SE FI NO UCH BrändaBergets X´Clusive, Championclass: 1;1 CQ, BF 1, BOB!!! SE FI UCH BrändaBergets X´Clusive, Openclass: 1;1 CQ, BF 1, CAC & BOB! 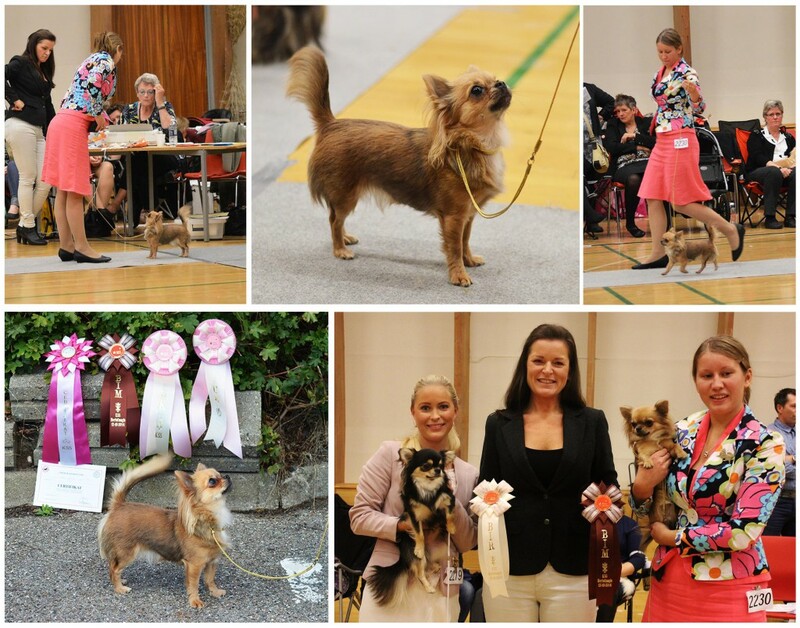 NEW NORWEGIAN & NORDIC CHAMPION!!!! BrändaBergets X´Clusive, Openclass: 1;1 CQ, BF 1, CAC & BOB! BrändaBergets X´Clusive, Openclass: 1;1 CQ, BF 1, CAC & BOS! Openclass: 1;1 CQ, BF 1, CAC & Cacib, BOS!!! 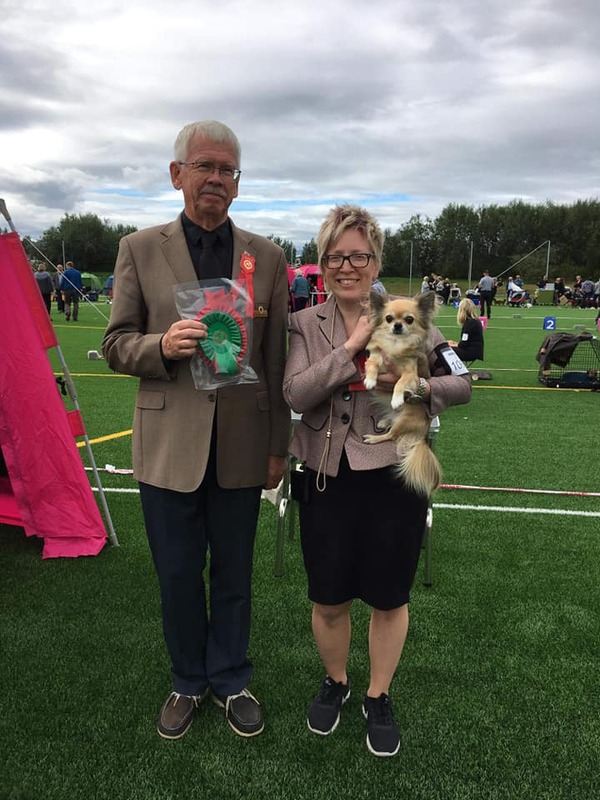 Puppieclass 9-12 month: Hp, Best female puppie, BOB-puppie!!! 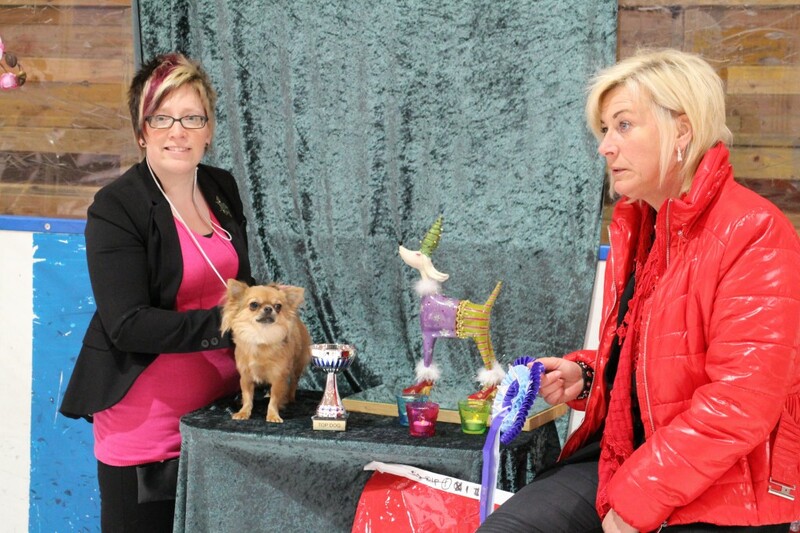 In the final she was unplaced. 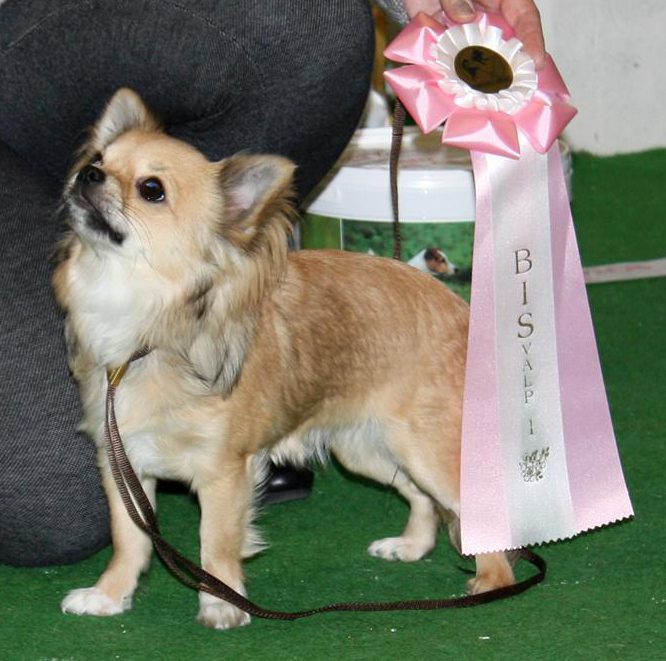 Puppieclass 9-12 month: Hp, Best male puppie, BOS-puppie!!! 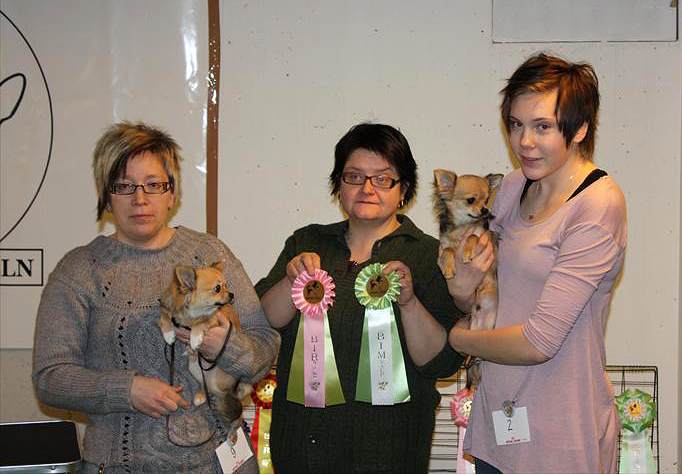 BrändaBergets X´Clusive, BOB & BEST IN SHOW!!!!! 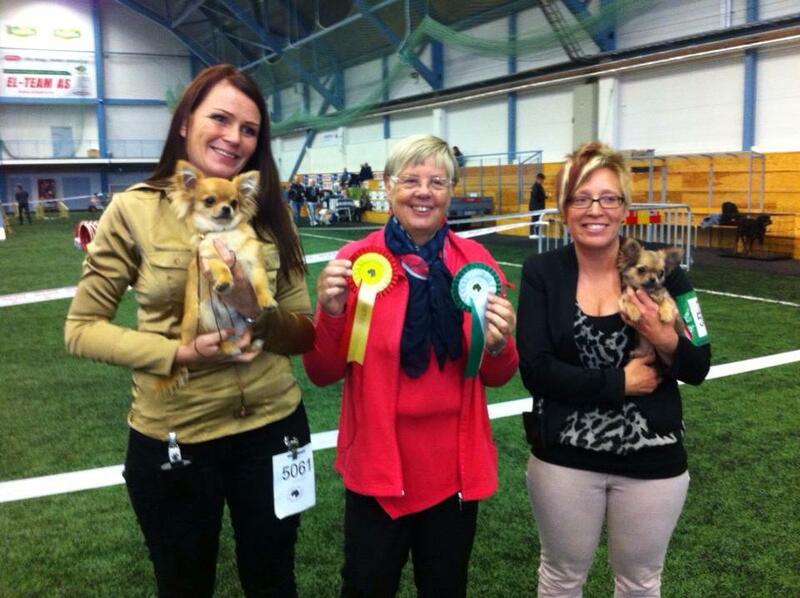 TigerLiljas Northern Light, BOB-puppie & BISS1-puppie!!!! 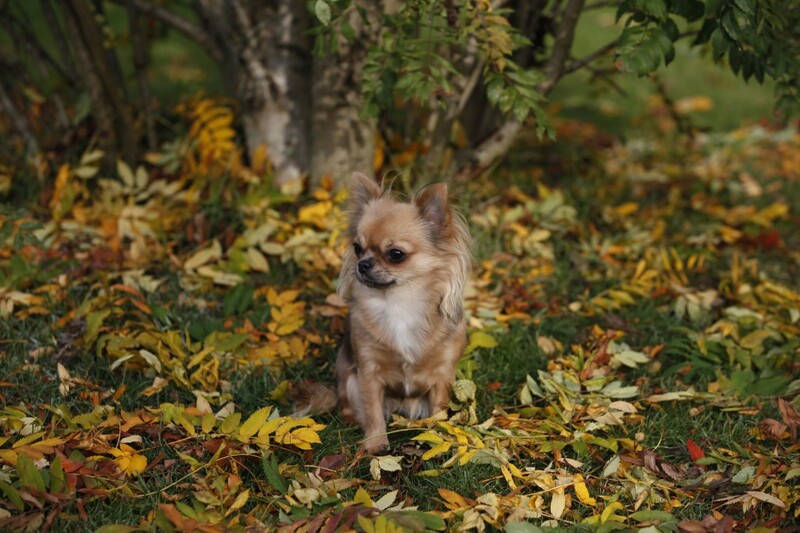 TigerLiljas Thunder And Lightning, BOS-puppie & BISS3-puppie!!! 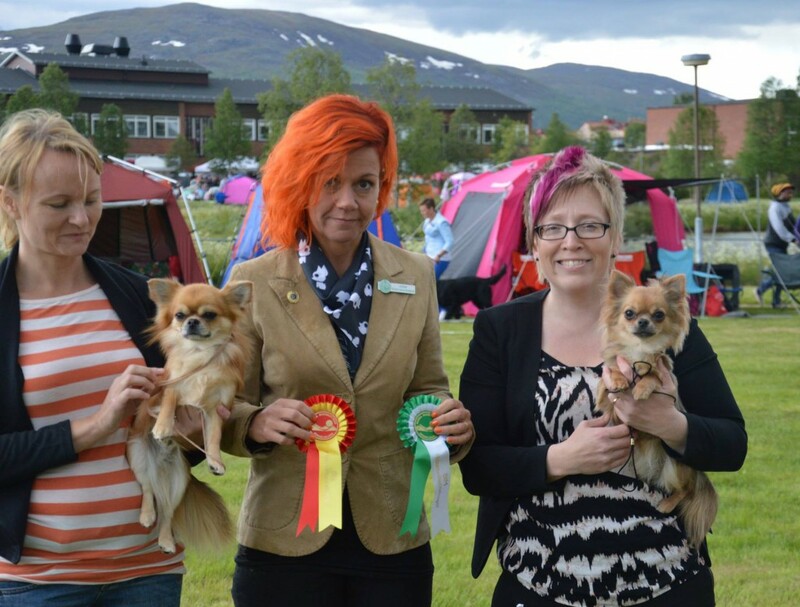 Ina,Gibson and Noomi was also nominated for ”best head and best temperament”. 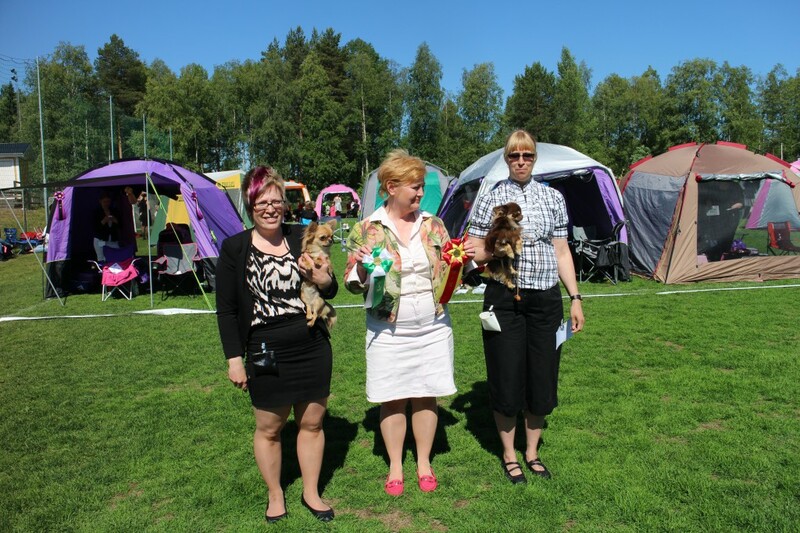 Puppieclass 6-9 month: Best male puppie, Hp, BOS-puppie!!! Intermediateclass: 1;1 CQ, BF 1, CAC & BOB! 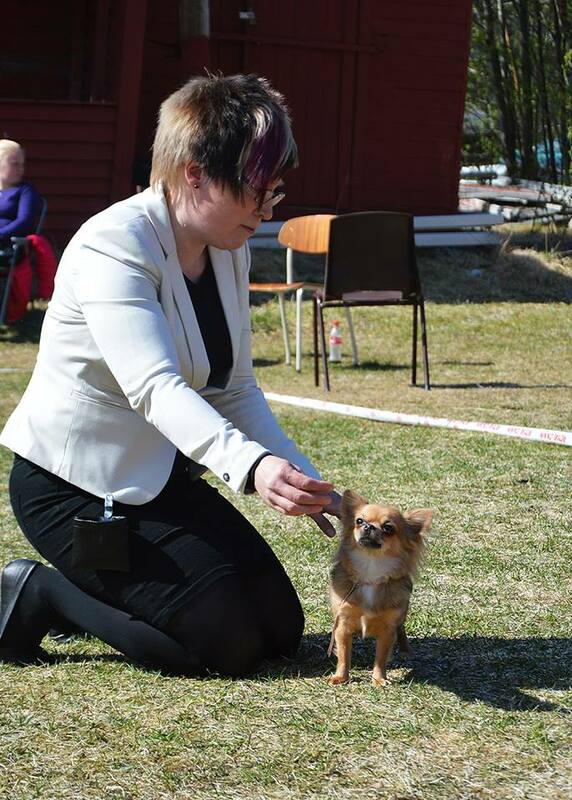 TigerLiljas Love at first Sight, Puppieclass (6-9 month) BOB-puppie! BrändaBergets X´Clusive, Openclass: 1; not placed. Intermediateclass: 1;1 CQ, BF 1, CAC & BOB!!! Intermediateclass: 1;1 CQ, BF 1, CAC & Cacib, BOS!!!! 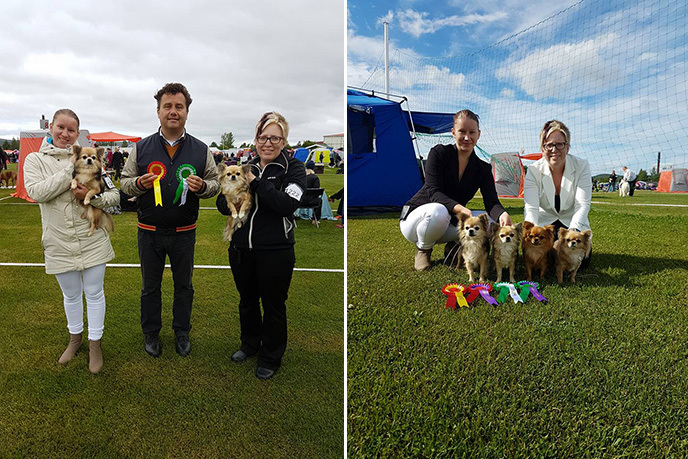 My son Marcus also showed Ina 🙂 and was one of the 3 winner the judge choosed to be on shared first place. BrändaBergets X´Clusive, Intermediateclass: 1;1 CQ, CAC & Cacib, BOB!!! BrändaBergets X´Clusive, Hp & BOB! Intermediate class: 1;1 CQ, BF 1 CAC & BOS!!! Juniorclass: 1;1 CQ, BF 1, CAC & BOB!!! 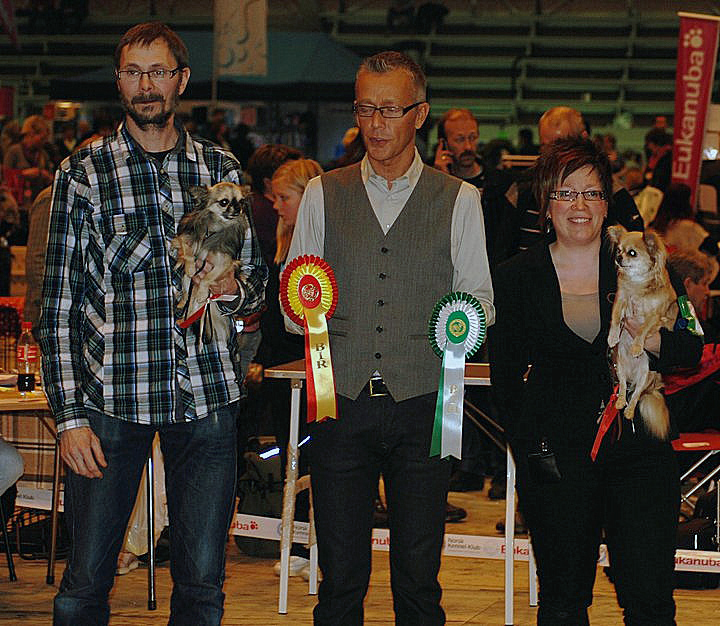 And also my biggest congratulations to BrändaBerget`s Kennel that today become BISS3- breeders class! Juniorclass: 1,1 CQ ,BF 2 with CAC!!!! 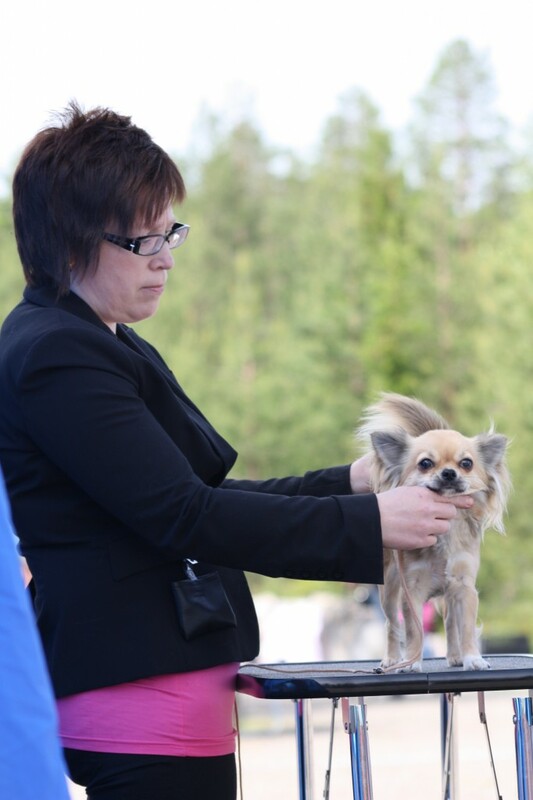 BrändaBergets X´Clusive, Puppieclass: 3rd best female puppie with Hp.